On this page ... Short Brothers, Alfred Simey, John Smith, Smurthwaite, South Hylton Shipbuilding. Copyright? (75 + 1 + 3 + 1 = 80) Test. This is the second 'Short' page, made necessary by the increasing number of listings re 'Short' built vessels. The first page, with the first 100 vessels, is available here. Names of just a few more of the vessels constructed by Short Brothers of Sunderland - as I happen to spot references to them. In a table in build date sequence. And alphabetic within a year. But just a start! Clearly in business a very long time indeed. A cargo ship. Per 1 (wreck), 2 ('convoyweb.org', WW2 convoy duty, Anglo Peruvian), 3 (Convoy OB-288), 4 (sinking), 5 (Miramar, link, you now must be registered to access). 426 ft. (about 135 or so metres) long, speed of 11 knots. Built for 'Nitrate Producers' Steamship Co., Ltd.', (Anglo Line), Lawther, Latta & Co. Ltd. of London, managers. Presumably for the South American nitrate trade. 16 convoy ref. in early WW2 including 2 voyages across N Atlantic & U.K. coastal voyages. 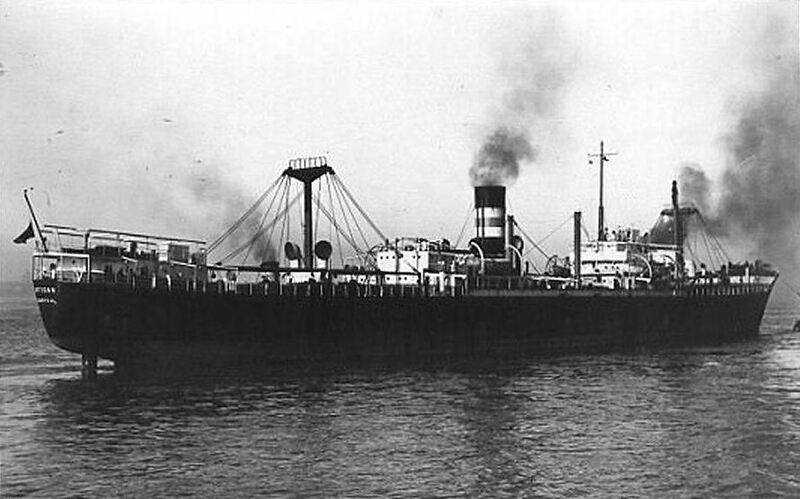 Vessel left Liverpool on Feb. 8, 1941, as part of convoy OB-288, bound for Boston, Massachusetts, with a cargo of coal. 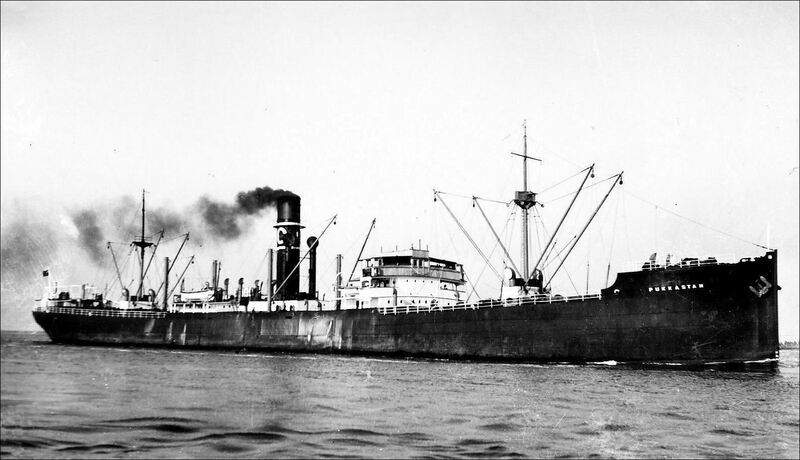 At 9 p.m. on Feb. 23, 1941, when dispersed from the convoy & located S. of Iceland, was twice torpedoed by U-96. Vessel broke in two & sank within 3 minutes. At 59.30N/21.00W. 29 were lost including Cyril M. (Mervyn) Quick, the Master. 17 survivors were picked up from a life-raft by Harberton & were landed at Halifax, Nova Scotia. Anything to add? An image? A cargo ship. Per 1 (Chapman and Willan, Ltd., flags & data), 2 (Birkenhead drydock 55% down), 3 (Saturday, 15 March), 4 ('convoyweb.org', WW2 convoy duty, Demeterton), 5 (Miramar, link, you now must be registered to access). 410 ft. (about 126 metres) long, speed of 10 knots. Built for R. Chapman & Son, ('Chapman'), of Newcastle. Or maybe by 'The Carlton Steamship Company Ltd.', which was related to the owners of Chapman. Over time, Chapman owned 3 vessels of the identical name. 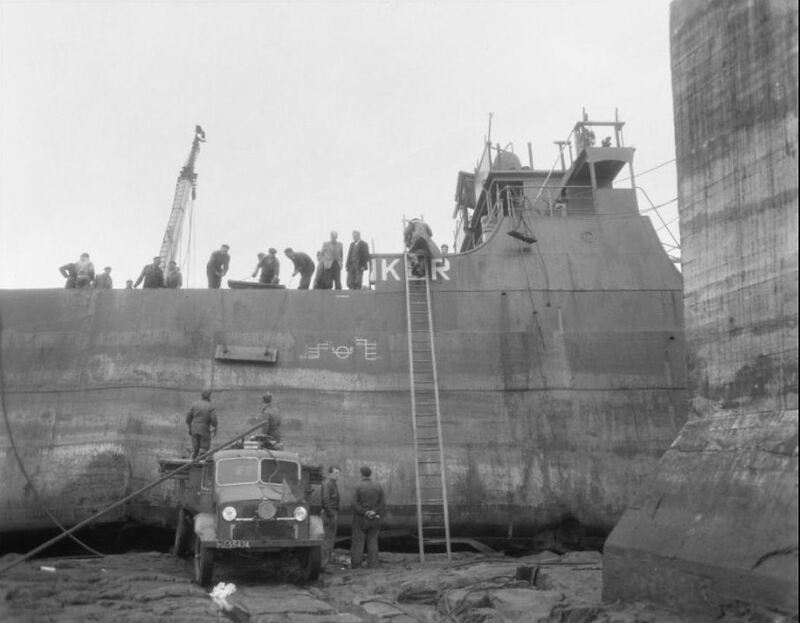 In Dec. 1940, when in drydock at Birkenhead, the vessel was hit by a 100 lb. bomb which exploded in the lower hold with no loss of life. Many references to convoy duty in WW2 - mainly North Atlantic but also in Mar. 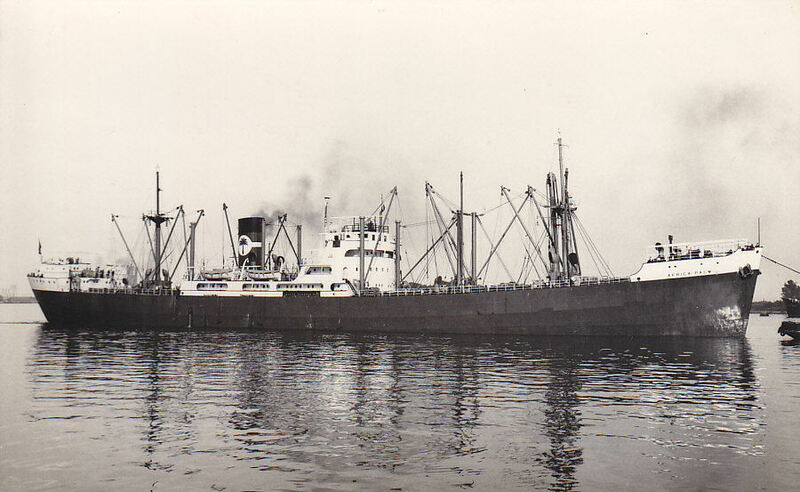 1940 (HN 22) �lesund, Norway, to Methil (Firth of Forth) with iron ore bound for Cardiff. On Mar. 15, 1941, while in convoy HX 42 & en route from the U.S. to Falmouth, U.K. with a cargo of grain, the vessel was attacked by battleship Scharnhorst during operation 'Berlin', the entire crew being taken prisoner. 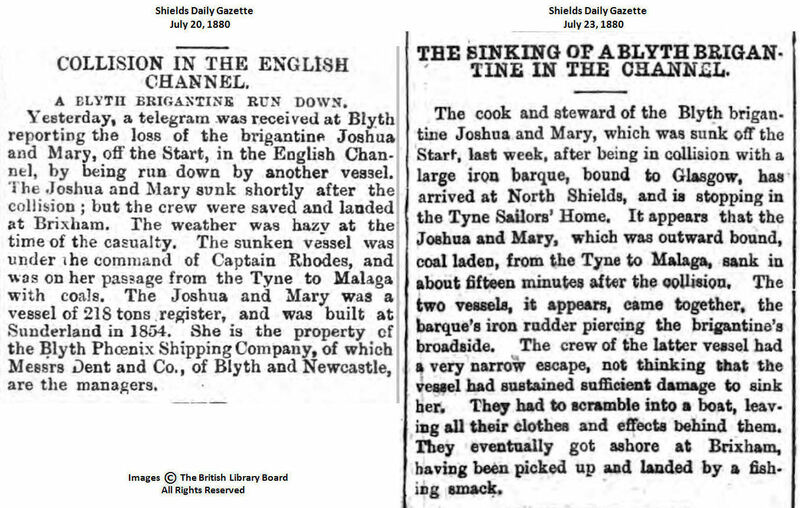 The vessel was sunk on Mar. 16, 1941 at 45.58N/44.00W, SE of St. John's, Newfoundland. On that single day, Scharnhorst & Gneisenau together sank 16 ships in the North Atlantic. Data about Chapman companies is modest indeed. A 1965 volume, entitled 'CHAPMAN OF NEWCASTLE - The Story of a Tyneside Tramp Shipping Company' by John Lingwood & Harold Appleyard, presumably covers the company & its fleet. Anything to add? A cargo ship. Per 1 (data), 2 (Board of Trade Loss Inquiry report), 3 (data), 4 (Miramar, link, you now must be registered to access). 426 ft. long, speed of 10 1/2 knots. Built for 'Nitrate Producers' Steamship Co., Ltd.', (Anglo Line), Lawther, Latta & Co. Ltd. of London, managers. On Mar. 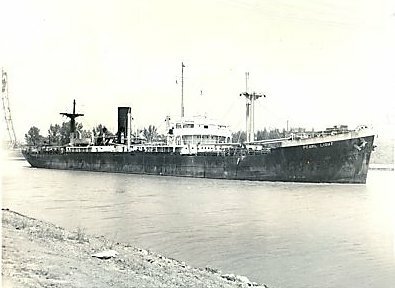 8, 1938, vessel left Cardiff, Wales, in ballast, for British Columbia, via the Panama Canal, to pick up a cargo of lumber. On Mar. 14, 1938 she passed Fayal, Azores, & was never heard from again. Vessel is believed to have foundered in severe gale conditions approx. 60/70 miles NW of Fayal. All 38 aboard were lost. The Captain was Frederick Parslow, who won the DSC for his actions on Jul. 4, 1915 re the Anglo-Californian (1, 2). Actions in which his father died & was posthumously awarded the Victoria Cross. The Board of Trade, at its Oct. 1928 Inquiry, concluded that the most probable cause of the loss was the buckling of the shelter deck with subsequent complete fracture from deck to keel. The vessel had had a history of cracks in the structure of the shelter deck. Which cracks had been routinely repaired. Anything to add? A cargo ship. Per 1 (data), 2 ('convoyweb.org', WW2 convoy duty, Holystone), 3 (Common Bros history 40% down, but no ref. to Holystone), 4 & 5 (convoy OB.284), 6 (insert 101 & then Holystone), 7 (data & image), 8 (Miramar, link, you now must be registered to access). 397 ft. (about 126 metres) long, speed of 10 or 11 knots. 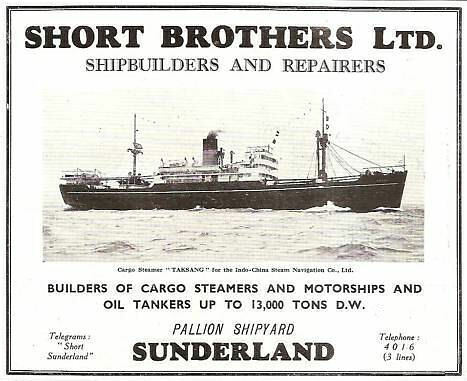 Built for 'Northumbrian Shipping Co. Ltd.', of Newcastle, which company was a ship owning arm of Common Brothers Ltd. 16 convoy references early in WW2 including 3 voyages across N Atlantic & coastal UK trips. On Feb. 10, 1941, under the command of Capt. John S. (Stewart) Bain, vessel left Oban, Scotland, in ballast for Halifax, Canada (voyage originated at Hull). 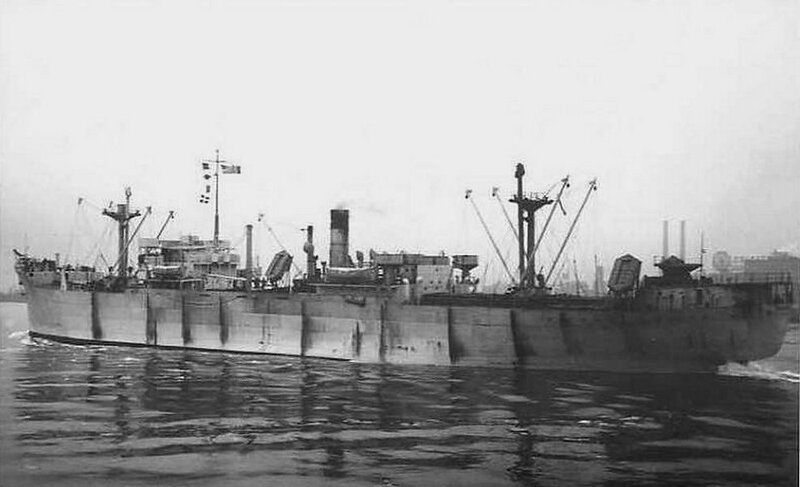 Vessel joined convoy OB.284 which left Liverpool on Feb. 9, 1941. 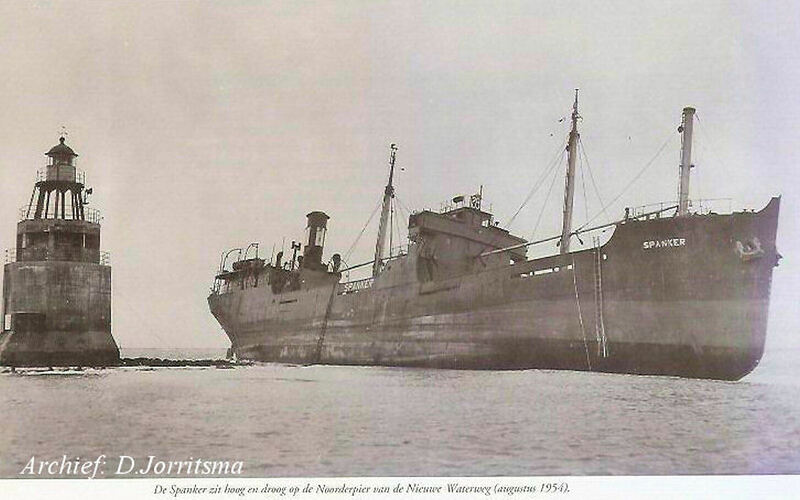 Last heard from on Feb. 14, 1941, on which day vessel was torpedoed & sunk by U.101 (Korvettenkapit�n Ernst Mengersen). At or about 54.10N/18.50W (or 53N/18W), W. of Ireland. All aboard were lost - 40 lives including 2 passengers. Can you add anything? A cargo ship. Per 1 ('convoyweb.org', WW2 convoy duty, Irene S. Embiricos), 2 (image, Irene S. Embiricos), 3 (Miramar, link, you now must be registered to access). 119.8 metres long, perpendicular to perpendicular, 409 ft. 6 in., speed of 9 or 9 1/2 knots. Built for 'S. G. Embiricos Ltd.', of Athens, Greece), & managed by Embiricos Ltd., of London. In Apl. 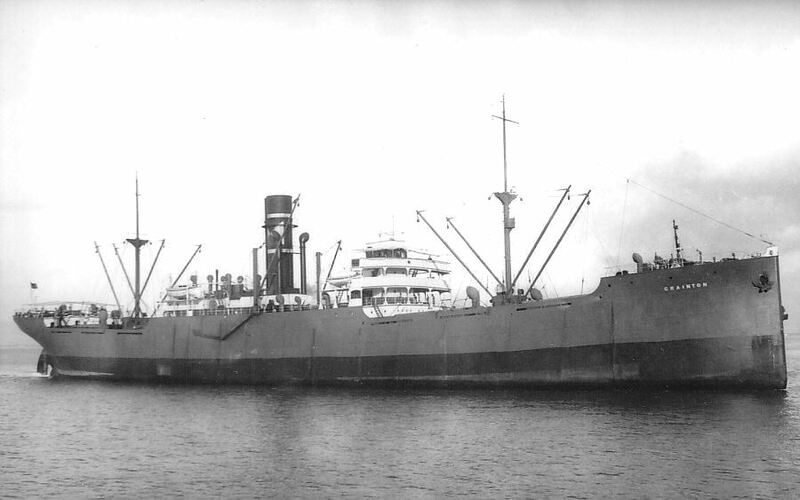 1942, the vessel carried grain from Bahia Blanca to Genoa, Italy. Just 11 convoy references in WW2 in the period of Dec. 1942 to May 1944, mostly 'shorter convoy series' in the Indian Ocean (Aden, Durban, S. Africa, Mombasa, Kenya (Kilindini), Mozambique (Lourenco Marques now Maputo), Vizagpatnam (SE India), Colombo (Ceylon now Sri Lanka). Surely independent voyages also, but I am not permitted access. 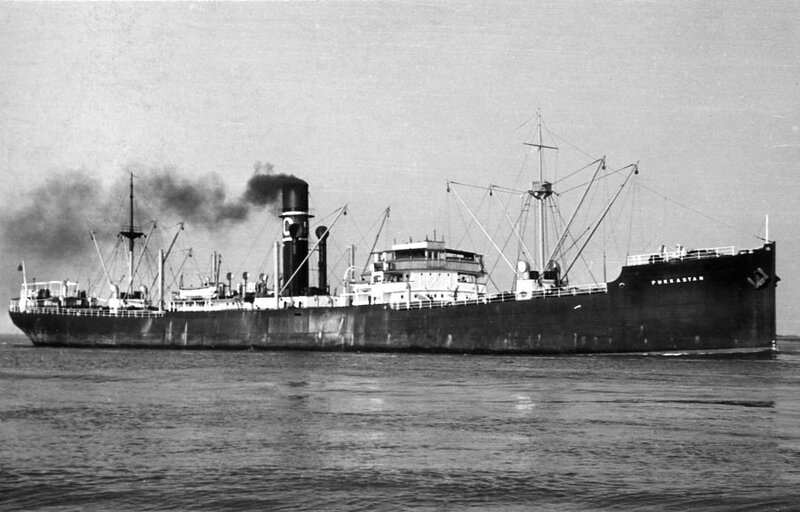 In 1960, the vessel was sold to 'H. Sienmin & Sons', described as Hong Kong trading buyers. And renamed Xmas. On Apl. 19, 1961, the vessel arrived at Koyagishima, Nagasaki, Japan, to be broken up. At the facilities of Kawanami Heavy Industries?? The WWW record for this ship is modest. Can you add anything? A tanker. Per 1 (Gulf), 2 & 3 (WW2 convoy duty, Laristan & Empire Gulf), 4 [data 55% down Laristan (3)], 5 (Convoy ON.57), 6 ('plimsollshipdata.org', Lloyd's Register data, Laristan, 1930/31 thru 1942/43), 7 ('plimsollshipdata.org', Lloyd's Register data, Empire Gulf, 1942/43 thru 1945/46), 8 (Common Brothers 'Blue Peter' article, SECOND SHIP, ex 9 & 10), 11 (Miramar, link, you now must be registered to access). 420.0 ft. long (128.02 metres) perpendicular to perpendicular, about 133 metres long overall, speed of 10 1/2 knots, signal letters KWQS & GFMK. 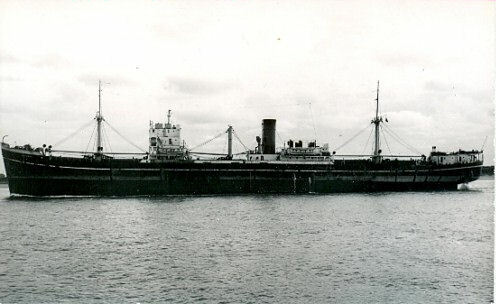 Built for Hindustan Steam Shipping Co. Ltd., the main ship owning arm of 'Common Brothers Ltd.' ('Common'), of Newcastle. I read that the vessel was badly damaged in 1929 during storms in the N. Atlantic while en route from Philadelphia to France under the command of Captain B. E. Marshall. Ownership was taken over by the Ministry of War Transport at the outbreak of WW2. As Laristan, the vessel made 5 voyages across the N. Atlantic & coastal U.K. trips in early WW2. 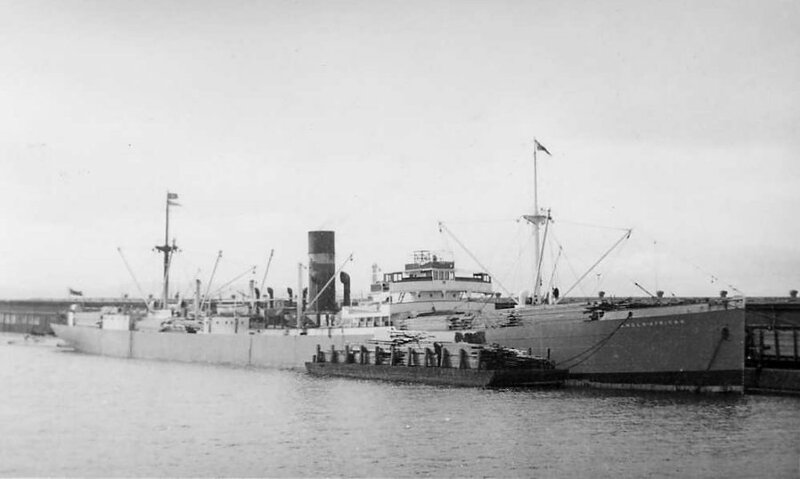 On Jan. 15, 1942, when part of convoy ON.57 ex Liverpool, the vessel was stranded on Tiree Island, an island in the Inner Hebrides. The vessel was seriously damaged & was declared a total loss. 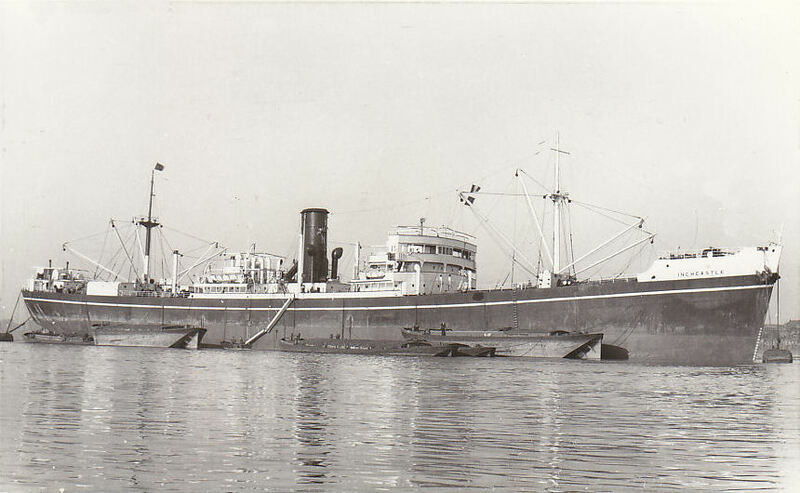 But on Jan. 7, 1943 it was refloated &, presumably repaired, became Empire Gulf, operated by the Ministry of War Transport. As Empire Gulf, the vessel made another 6 voyages across the Atlantic, & shorter voyages also. 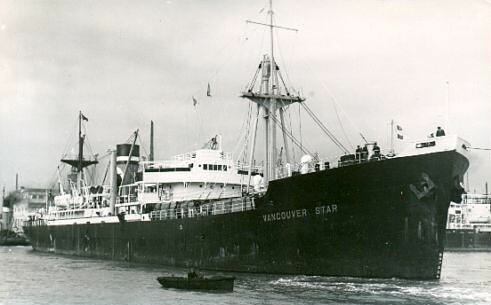 In 1946, vessel was repurchased by Common & renamed Laristan. Owned by Home Line Ltd. with Common the managers. The vessel was sold in 1949 to John I. Jacobs & Co. Ltd., of London, & renamed Cherrywood. 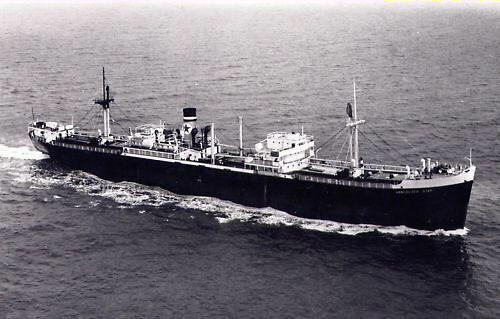 And in 1953, the vessel was sold to Marcou & Sons, of London, & renamed Irene M. (Costa Rica flag). 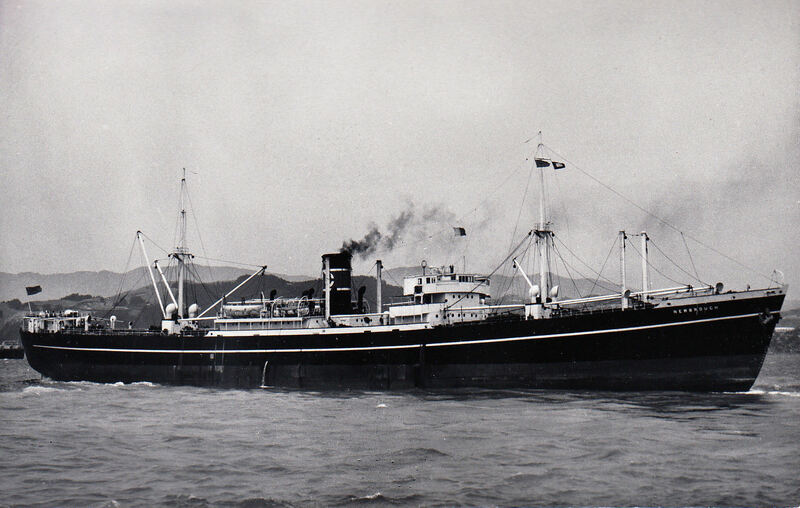 In 1954, she was sold to Muzaffer Emin Zorlu, of Canakkale, Turkey, & renamed Semira. 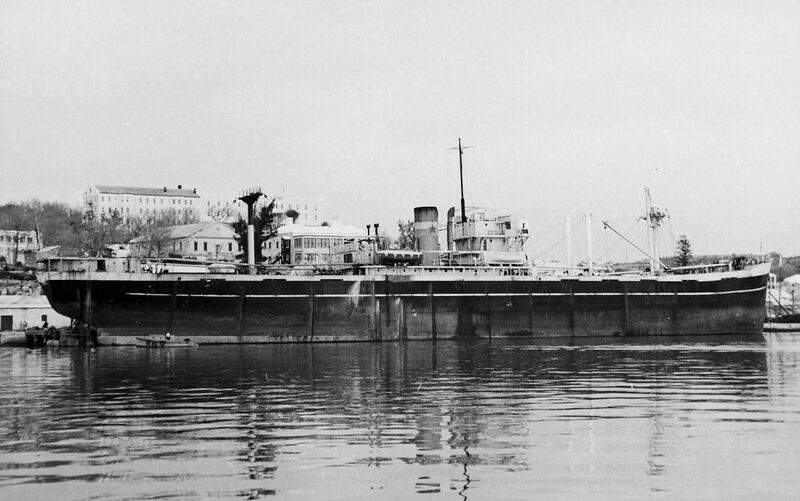 The vessel was scrapped at Kalafatyeri, Turkey, in Q4 of 1960. Can you add anything? A cargo ship. Per 1 (Chapman and Willan, Ltd., flags & data), 2 ('convoyweb.org', WW2 convoy duty, click on 'SHIP SEARCH' then insert Amberton), 3 (Miramar, link, you now must be registered to access). About 130 metres long, speed of 10 knots. Built for Carlton Steamship Co. Ltd. of Newcastle. 139 WW2 convoy references, including at least 11 N. Atlantic crossings, almost always carrying wheat or flour but one voyage carrying sugar, service into Mediterranean (Algiers, Augusta, Naples), to Freetown, Sierra Leone, & many eastern North America & U.K. coastal trips. On Jul. 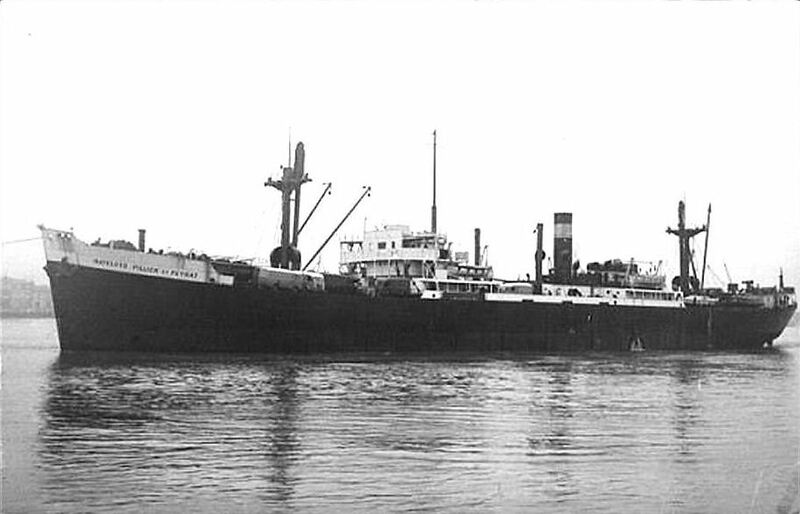 23, 1947, the vessel was wrecked at Western Head, Cape Pine, on the Avalon Peninsula of Newfoundland. Specifically near the Wester Head of St. Shotts Bight. No data about the circumstances. Any loss of life? In Apl. 2011, Joseph Dale kindly advised (thanks!) that he was aboard at the time & that there was, in fact, no loss of life. Foundation Franklin came to Amberton's assistance, & later Foundation Josephine also, both tugs owned by 'Foundation Maritime' of Halifax, Nova Scotia, (images of both tugs are on this page). Their efforts at pulling the vessel free risked breaking her up. Freeing her was not successful & the Amberton crew was transferred to USCG Spencer & in due course flown to Halifax. The vessel's cargo was presumably timber since I read that timber from the ship was used to build at least a dozen buildings & many more outbuildings at St. Shotts. WWW data about Amberton seems to be modest. Anything to add? A cargo ship. Per 1 (Japanese attack in 1942), 2 (data), 3 (data & image), 4 ('convoyweb.org', WW2 convoy duty, click on 'SHIP SEARCH' then insert Anglo Canadian), 5 (Miramar, link, you now must be registered to access). 426 ft. long, speed of 10 1/2 (or maybe 11) knots. Built for 'Nitrate Producers' Steamship Co., Ltd.', (Anglo Line), Lawther, Latta & Co. Ltd., of London, managers. 16 WW2 convoy references including 2 voyages across N. Atlantic, service to W. Africa (Freetown) & service also in eastern Mediterranean. In first 6 months of 1942 served in the Suez/Aden/Colombo/Bombay/Kenya area. At Visagapatam Roads, Andhra Pradesh, India, on Apl. 16, 1942, the vessel, 'sailing alone', was targeted by planes from Ryujo, a Japanese aircraft carrier. Was attacked for 2 hours, hit by a bomb (later carried ashore & exploded!) & set on fire. Captain D. J. Williams later awarded OBE for his conduct & two others honoured also. On Jun. 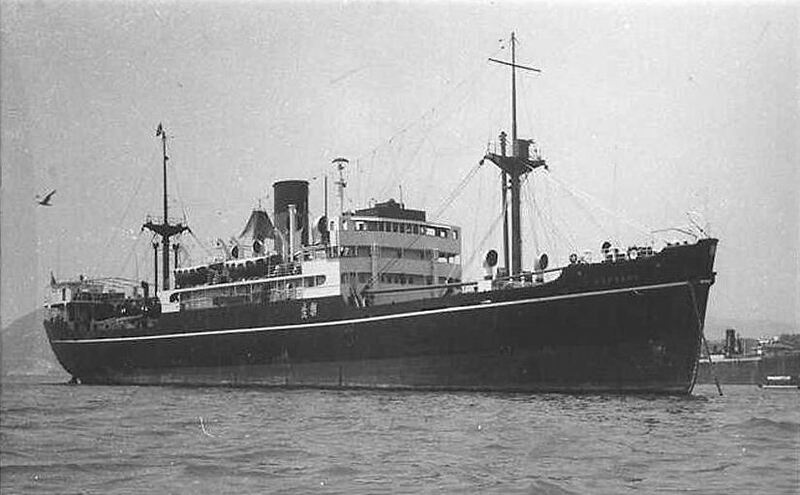 25, 1942, while en route, unescorted & in ballast, from Visagapatam to Baltimore, via Capetown & Ascension Island, vessel was torpedoed & sunk by U-153 in western N. Atlantic. At 25.12N/55.31W. About 800 miles northeast of Antigua. One life lost. Captain Williams & 48 aboard survived & were landed at St. Kitts, Windward Islands. Some references I saw stated, incorrectly I believe, that this vessel was, in fact, built by 'Doxford'. Anything to add? A cargo ship. Per 1 (sinking, 6th May 1940), 2 (Chapman and Willan, Ltd., flags & data), 3 (wreck location), 4 (French page, 20% down), 5 (Miramar, link, you now must be registered to access). About 130 metres long, speed of 10 knots. Built for 'The Carlton Steamship Company Ltd.' which was related to R. Chapman & Son of Newcastle. On May 6, 1940, while en route from the Humber to Dunkirk, France, with a cargo of coal, vessel hit a mine & sank approaching Dunkirk. At 51.03.06N/2.08.40E. Wreck appears, however, to in fact be at 51.03.07N/2.10.59E, lying E-W in 3 pieces. The 34 crew members were rescued. Data about Brighton seems to be non-existent & data about Chapman companies is modest indeed. A 1965 volume, entitled 'CHAPMAN OF NEWCASTLE - The Story of a Tyneside Tramp Shipping Company' by John Lingwood & Harold Appleyard, presumably covers the company & its fleet. Anything to add? A cargo ship. Per 1 (sinking), 2 ('convoyweb.org', WW2 convoy duty, click on 'SHIP SEARCH' then insert Kurdistan), 3 (convoy SC.57), 4 (Hindustan history & Kurdistan (4) 45% down), 5 ('uboat.net' page, with image), 6 (Miramar, link, you now must be registered to access). 434 (or 420) ft. (about 133 metres) long, speed of 10 knots. Built for Hindustan Steam Shipping Co. Ltd., the main ship owning arm of Common Brothers Ltd. A site visitor's father was aboard the vessel in 1931 & 1932 voyages to Buenos Aires & to Canada. 29 convoy references early in WW2 including 5 voyages across N. Atlantic, service to the Indian Ocean (Bombay) & to W. Africa (Freetown), also coastal UK trips. 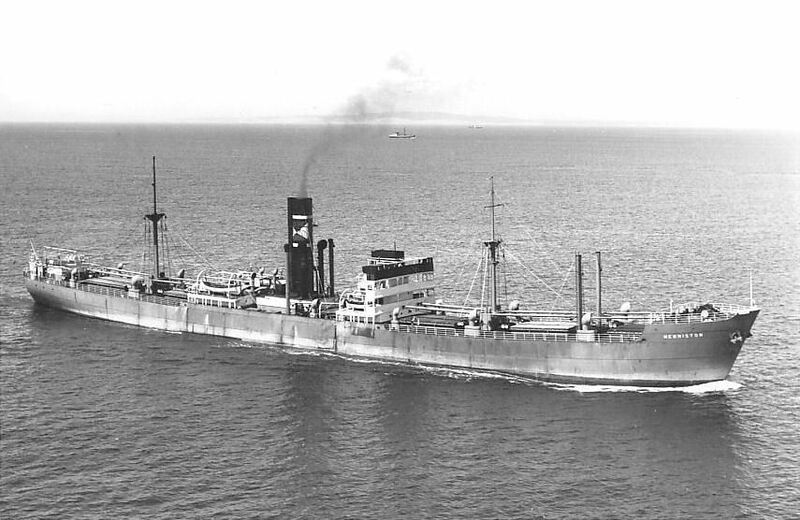 Vessel was at New York in Nov. 1941 & travelled to Sydney, Cape Breton, Canada, to join an E. bound convoy. 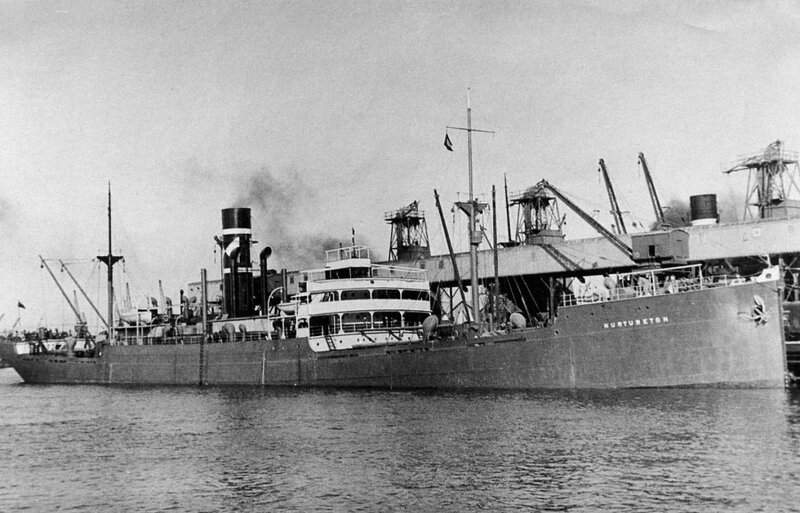 Convoy SC.57 left Sydney on Nov. 28, 1941 for Liverpool. The convoy included Kurdistan, bound for Manchester & carrying a general cargo (foodstuffs, base metals & textiles). 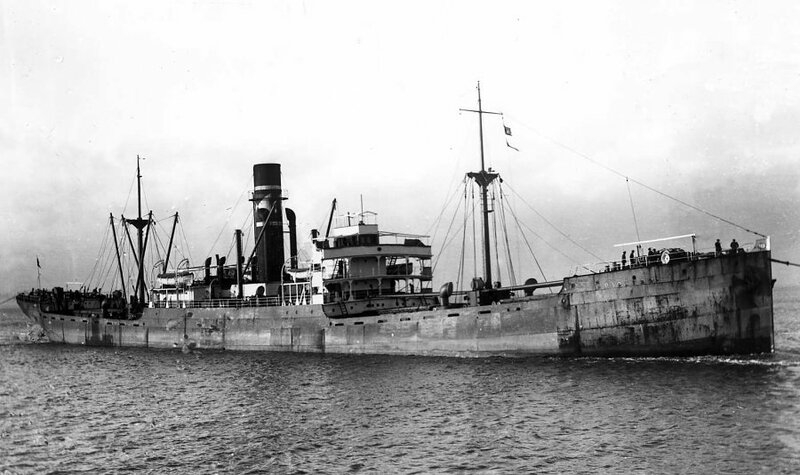 A minute or so before midnight on Dec. 10, 1941, vessel was both torpedoed by U-130 & attacked by a German aircraft. And sank, at 56.51N/16.36W, (or 56.57N), about 300 miles W. of the Hebrides. 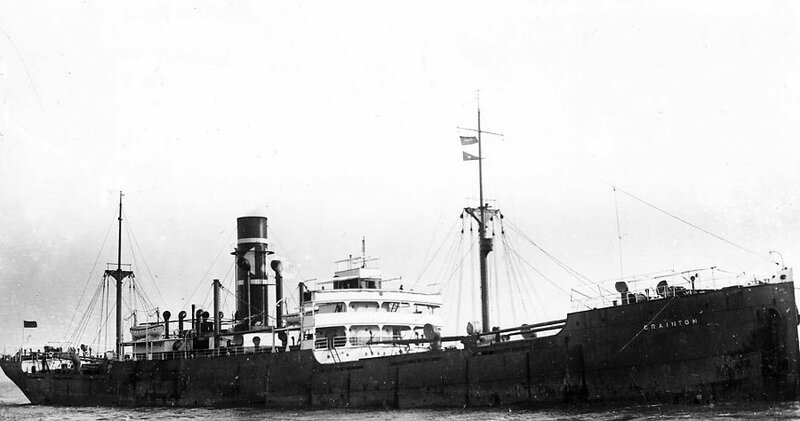 Kurdistan was the ship of the Convoy Commodore (R. Gill). 10 lives lost (7 crew, a gunner & 2 convoy commodore's staff). 56 survivors, including the commodore & Captain William F. (Fearon) McMillan, were picked up by HMS Kingcup (K 33) & landed at Londonderry. A now dead page referred to a German aircraft. Anything to add? An image? A cargo ship. Per 1 ('convoyweb.org', WW2 convoy duty, click on 'SHIP SEARCH' then insert Riverton Beware re the correct ship! 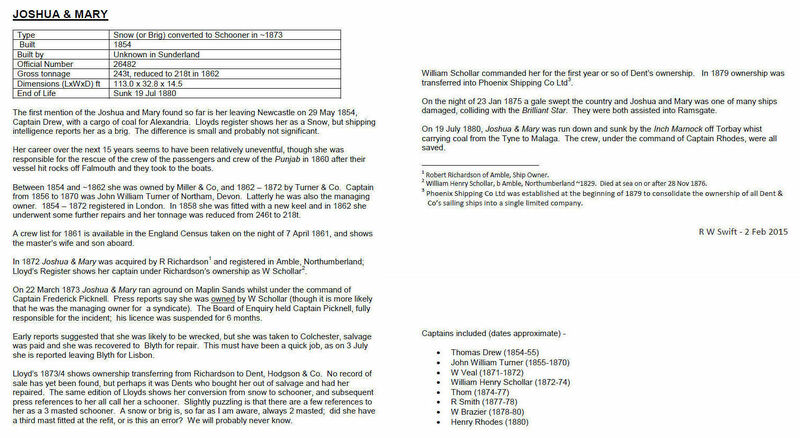 ), 2 (Chapman and Willan, Ltd., flags & data), 3 (image, ex Photoship), 4 (data, about 35% down, 2 paragraphs above 'ALLIED SUBMARINE OPERATIONS'), 5 (data, 'Wednesday, 24 April' para 10, 30% down), 6 (Lloyd's Register data, 1930/31 thru 1938/39, ex 'plimsollshipdata.org'), 7 (Miramar, link, you now must be registered to access). About 130 metres long (409.6 ft.), speed of 10 knots, signal letters LBKV later GNRY. Built for 'The Carlton Steamship Company Ltd.', of Newcastle, with R. Chapman & Son, ('Chapman') the vessel's managers & owners. On Mar. 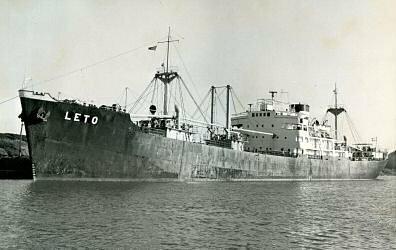 22, 1940, Riverton (have not read what her cargo was) left Methil (Firth of Forth) as part of convoy ON.22 bound for Norway. On Apl. 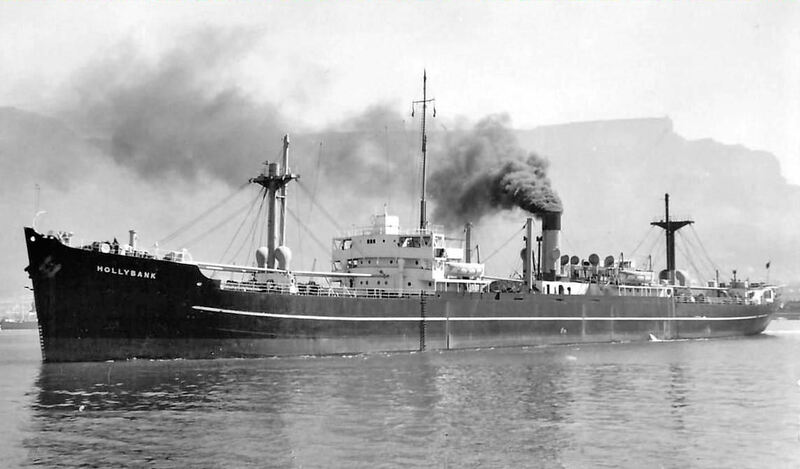 9, 1940, Riverton was one of a number of British steamers seized by German forces as part of their invasion of Norway, which invasion, in part at least, was to secure German control over iron ore mined in the region. Riverton was seized at Narvik, in the Arctic Circle, 700 miles N. of Bergen. 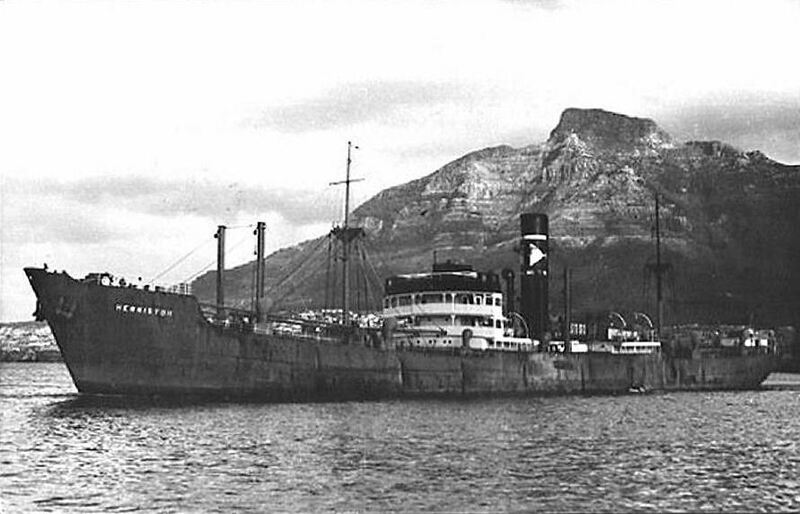 Her crew members were taken prisoner & placed aboard Jan Wellem, a German tanker. While I have read that Riverton was scuttled on Apl. 22, 1940, she would seem to have been rather sunk by British Light Cruiser Effingham, on Apl. 24, 1940, while moored along an outlying pier. The wreck, I have read, was removed in the 1940s. Can anybody, in a few words, better set the stage for those 1940 events? WWW data about Riverton seems to be non-existent. 'DRIVER5966' has kindly added some data related to the battle at Narvik as you can read here. Anything to add? A cargo ship. Per 1 (ref. 5% down), 2 (William Reardon Smith), 3 ('convoyweb.org', WW2 convoy duty, click on 'SHIP SEARCH' then insert Anglo African), 4 (Mediterranean convoys 1942/43), 5 (WW2 voyages), 6 (Miramar, link, you now must be registered to access). 129.8 metres long, (426 ft.) speed of 11 knots. Built for 'Nitrate Producers' Steamship Co., Ltd.', (Anglo Line), Lawther, Latta & Co. Ltd. of London, managers. It would seem that Anglo Line's vessels were sold to Sir William Reardon Smith & Co. ('Reardon') in 1943. It must have been early that year in view of the interesting WW2 account by Kenneth Clatworthy at 1. The vessel he refers to would seem to be this Anglo-African, even though he states his Anglo-African was built in 1912. Now Reardon was noted as being tight-fisted. 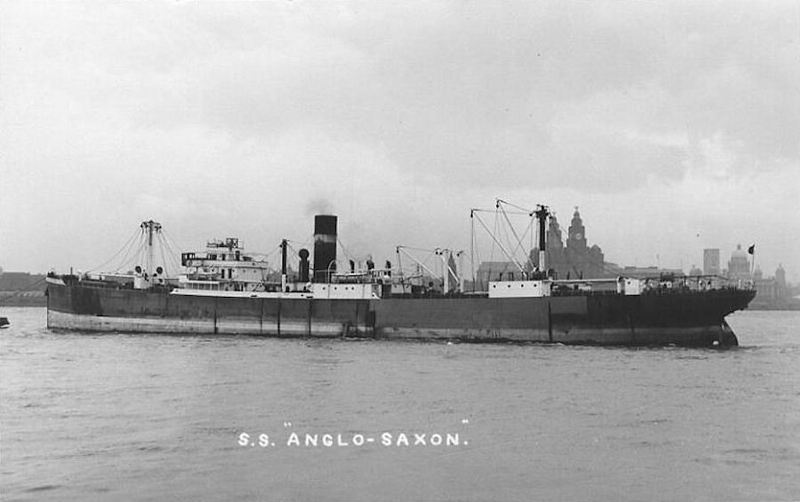 Hence Kenneth's comment that the 'Anglo-African had a big "S" on the funnel, the insignia of the Sir William Rearden Smith Line, but the crew said it stood for starvation.' And his comment that the ship carried, in a cargo of war supplies, 493 tons of high octane fuel. Only 493 tons because if a merchant ship carried over 500 tons they would have had to pay the crew an extra �1 - per month! He refers to the ship carrying supplies to Tangiers & S. America & possibly to Russia. 70 convoy references early in WW2, including at least 5 voyages across N. Atlantic, voyages to Mediterranean (Naples, Augusta, Port Said), also to Freetown, Sierra Leone, Suez, Aden & coastal U.K. trips. In 1948, renamed New Westminster City. Sold in 1949 to 'Sojozita Shipping Company, Ltd.', 'Ships Finance & Management Co. Ltd.' the managers, & renamed Lord Codrington. 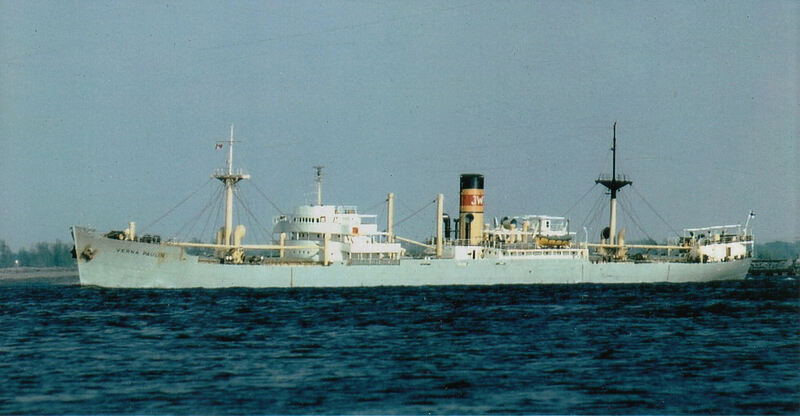 Sold in 1952 to 'Tozai Kisen Co.', of Japan, & renamed Tozai Maru No. 7. Sold in 1956 to 'Kusakabe Kisen K.K. ', of Amagasaki, Japan, & renamed Risshun Maru No. 3. Broken up in Japan in 1965. Anything to add? Or correct? A cargo ship. Per 1 (sinking & image), 2 (diary of voyage, & many data pages), 3 (survivors machine-gunned & related story), 4 (data) & 5 (image at N. Vancouver), 6 (Miramar, link, you now must be registered to access). 426 ft. (about 135 metres) long, speed of 11 knots. Built for 'Nitrate Producers' Steamship Co., Ltd.', (Anglo Line), Lawther, Latta & Co. Ltd. of London, managers. 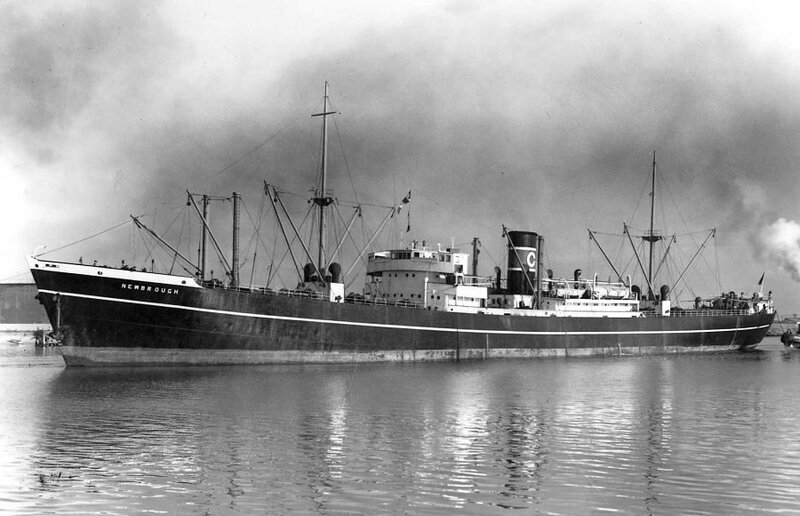 On Aug. 21, 1940, while en route with a cargo of coal from Newport, Wales, to Bahia Blanca, Argentina, vessel, unaccompanied & lightly armed, was surprise attacked & sunk off the coast of Africa with gunfire & torpedo by Widder, a German raider. At 26.10N/34.09W. 2 small boats got away but only one of them was heard from again. 7 of the crew of 41 escaped in an 18 ft. jolly boat & 2 of the 7 landed on Eleuthera Island, Bahamas, on Oct. 30, 1940, after 70 harrowing days at sea (including a hurricane) & after drifting some 2,700 miles. En route, 1 of the 7 went insane & 3 committed suicide. 39 lives were accordingly lost including Philip R. L. Flynn, the captain. Robert G. Taggert & Wilbert Roy Widdicombe (19 & 21 years respectively) were the 2 survivors, but Widdicombe was later lost when aboard Siamese Prince, torpedoed by U-69 on Feb. 17, 1941. The jolly boat was auctioned off in Dec. 1940, but is now on display in the Imperial War Museum in London. Hellmuth von Ruckteschell, the Widder captain, did not attempt rescue of survivors & per 3 machine gunned two life rafts. He was later tried for War Crimes. Taggart died at age 43. 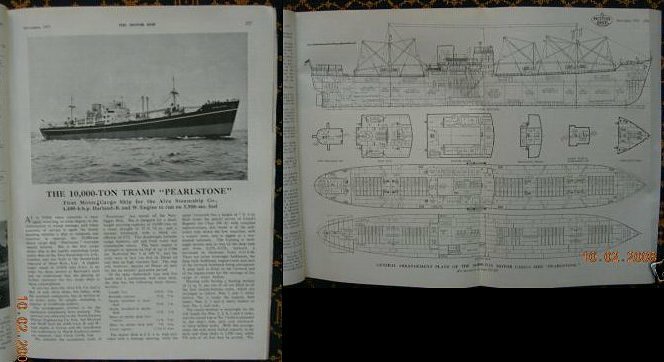 Whole story covered in 'All Brave Sailors: The Sinking of the 'Anglo Saxon', August 21, 1940', by J. (James) Revell Carr (1939-), 1st published 2004. Anything to add? A cargo ship. Per 1 (data incl. 42 names of the lost), 2 ('convoyweb.org', WW2 convoy duty, click on 'SHIP SEARCH' then insert Goolistan), 3 (convoy QP.15), 4 (Goolistan with image), 5 (insert 625, U-625), 6 (QP.15 report), 7 (Miramar, link, you now must be registered to access). 440 ft. (about 139 metres) long, speed of 10 knots. Built for 'Hindustan Steam Ship Co. Ltd.', of Newcastle, owned by 'Common Brothers Ltd.' (the ship's managers). 34 convoy references early in WW2, including at least 5 voyages across N. Atlantic carrying grain or flour, voyages to Archangel, Russia, W. Africa (Freetown, Sierra Leone) & coastal U.K. trips. On Nov. 17, 1942, under the command of Master William Thomson, the vessel left Archangel, Russia, for Loch Ewe, Scotland, & Manchester in ballast (or per one ref. carrying timber & a general cargo). At Kola Inlet (Murmansk, Russia), she joined convoy QP.15 for Loch Ewe. Weather conditions were bad, with high seas, gale force winds & poor visibility. In the early hours of Nov. 23, 1942, the vessel was hit by a torpedo fired by U-625 at 75.50N/15.45E (or maybe 75.50N/16.45E or 75.30N/8.00E), W. of Bear Island in the Barents Sea. The entire crew was lost, either 42 or (per Miramar) 50 lives. Can you add anything? A cargo ship. Per 1 (Chapman and Willan, Ltd., flags & data), 2 ('Fritzen' & Katharina Dorothea Fritzen), 3 ('convoyweb.org', WW2 convoy duty, click on 'SHIP SEARCH' then insert Grainton), 4 (Saturday, 2 December Fowey), 5 (Miramar, link, you now must be registered to access). 128.9 metres long, perpendicular to perpendicular, speed of 10 knots. Built for Carlton Steamship Co. Ltd. of Newcastle. Extensive convoy duty in WW2 - 83 convoy references - list includes many U.K. coastal trips but also 8 voyages across the N. Atlantic & voyages to Freetown, Sierra Leone. Most frequently carrying grain. 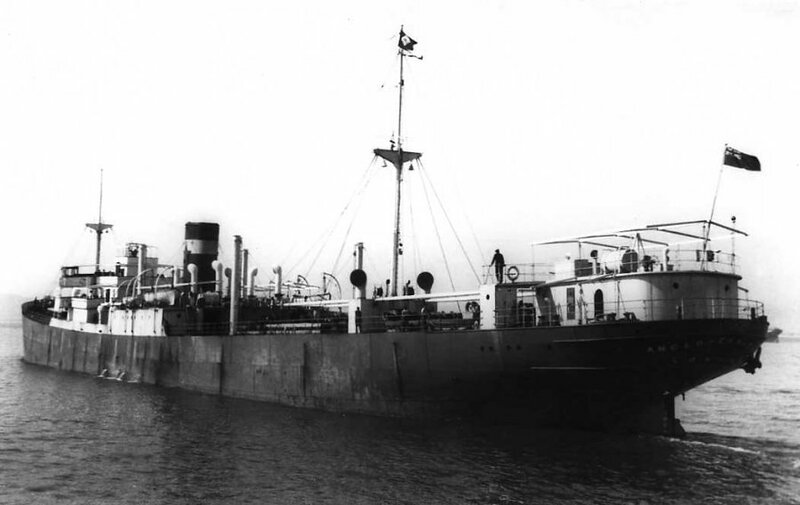 On Dec. 2, 1939, while part of convoy SL 11 (a convoy not listed at 3), the vessel collided with escorting sloop Fowey at 8.51N/14.37W, off Freetown. 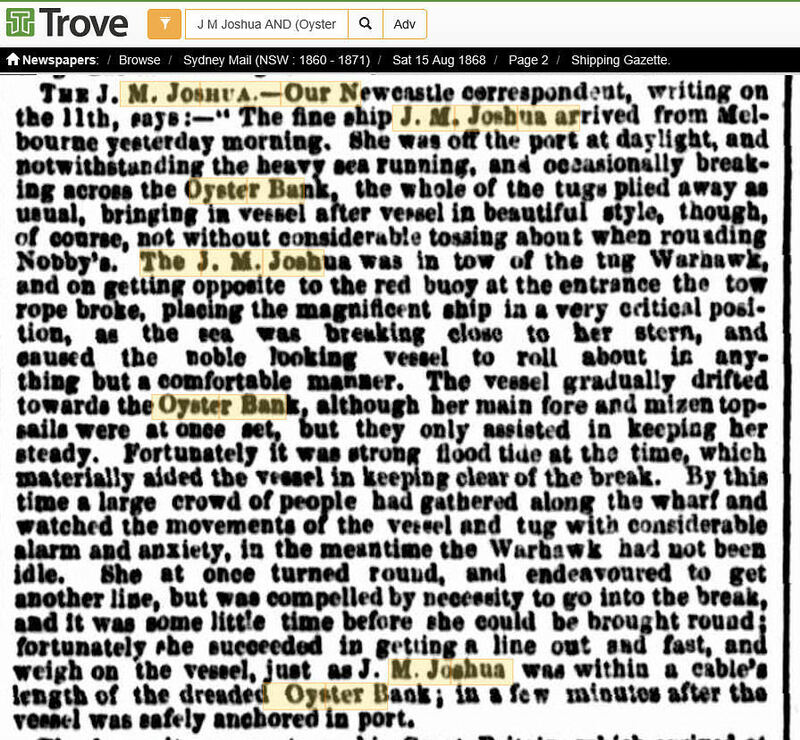 The vessel was sold, in 1950, to 'Johs. 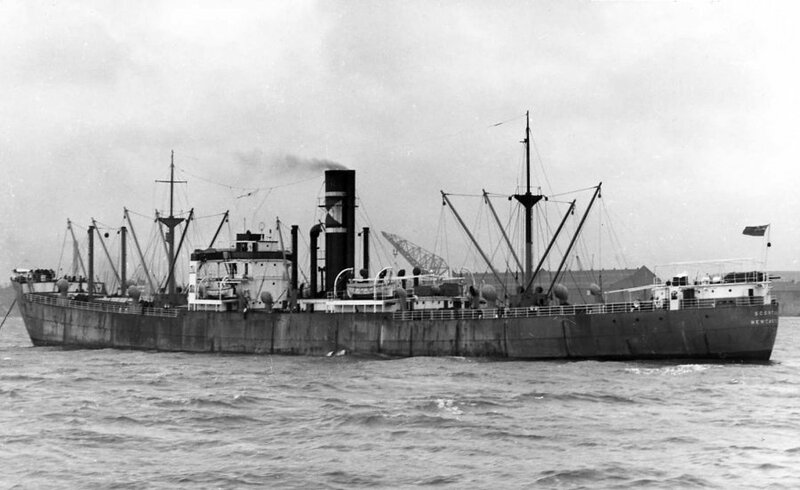 Fritzen & Sohn', of Emden, Germany, & renamed Katharina Dorothea Fritzen. The vessel arrived at Yokosuka, Japan, in Apl. 1961, to be broken up. All said & done, I can locate only minimal WWW data about this vessel. Can you add anything? A cargo ship. Per 1 (Chapman and Willan, Ltd., flags & data), 2 (image, Erika Fritzen), 3 ('convoyweb.org', WW2 convoy duty, click on 'SHIP SEARCH' then insert Nurtureton), 4 (Lloyd's Register data, 1930/31 thru 1945/46, ex 'plimsollshipdata.org'), 5 (Miramar, link, you now must be registered to access). 128.9 metres long perpendicular to perpendicular (423.0 ft.), speed of 12 knots, signal letters LDKG later GSWV. Built for 'The Carlton Steamship Company Ltd.' which was related to the owners of 'R. Chapman & Son', of Newcastle, the vessel's managers. An eBay item advised me that on Jan. 5, 1931, she was stranded in thick fog near Dungeness, Kent. She was re-floated, in two halves, which halves were towed by tug to Rotterdam to be joined together. 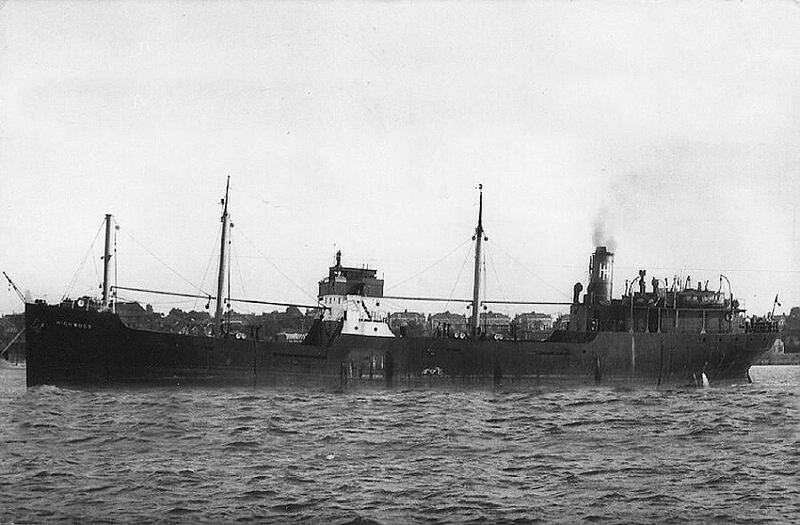 In 1941/42 the vessel became owned by The Carlton Steamship Company Ltd. & Cambay Steamship Co. Ltd. 65 WW2 convoy references. List includes many U.K. coastal trips but also 10 voyages across N. Atlantic & voyages to Freetown, Sierra Leone. Most frequently carrying grain. 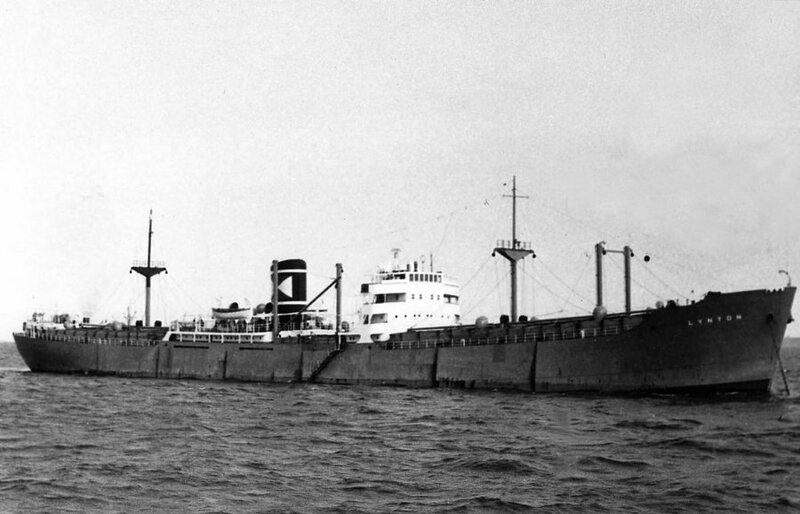 The vessel was sold, in 1953, to 'Johs. 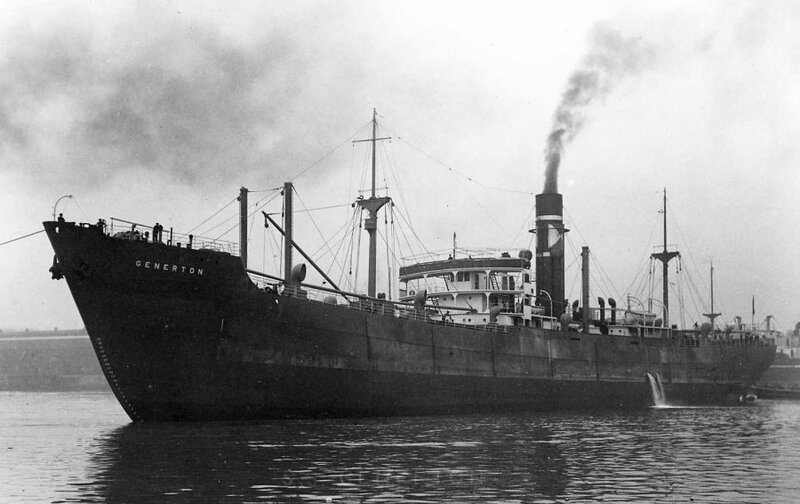 Fritzen & Sohn', of Emden, Germany, & renamed Erika Fritzen. And sold, in May 1960, to Oriental Steel & Rolling Mills Co., of Hong Kong, probably to be broken up, & renamed Mongkok. The vessel arrived at Hong Kong, on Aug. 2, 1960, to be broken up. All said & done, I can locate minimal WWW data about the vessel. Can you add anything? Some detail about the interesting Dungeness grounding, perhaps?. A cargo ship. Per 1 ('uboat.net', data about sinking, with image), 2 ('wrecksite.eu', wreck detail), 3 (the ship's bell), 4 (Hindustan/Common Brothers history 45% down), 5 (Pukkastan data, low on page), 6 (Miramar, link, you now must be registered to access). 134.4 metres long, perpendicular to perpendicular, 440.5 ft., speed? Built for 'Hindustan Steam Ship Co. Ltd.', of Newcastle, owned by 'Common Brothers Ltd.' (the ship's managers). 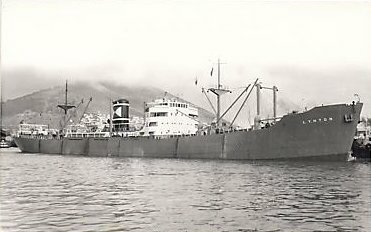 On Sep. 7, 1939, under the command of John S. (Strachan) Thomson, the vessel was en route, unescorted, from Cape Town, South Africa, to Rotterdam via Devonport, with a cargo of maize (have read mutton as well). She was stopped by 2 shots across her bow fired by U-34, Fregattenkapit�n Wilhelm Rollmann in command. The crew were ordered to abandon ship, the vessel was sunk by torpedo & possibly by gunfire also, & the entire crew of 35 was rescued by Bilderdijk. At 49.23N/07.49W, SW of Bishop Rock, 70 miles off Land's End. Can you add anything? A cargo ship. Per 1 (Chapman and Willan, Ltd., flags & data), 2 ('convoyweb.org', WW2 convoy duty, click on 'SHIP SEARCH' then insert Frumenton, but beware the correct vessel), 3 (Saturday, 7 September), 4 (Miramar, link, you now must be registered to access). About 138 metres long. Built for R. Chapman & Son, ('Chapman'), of Newcastle. Or maybe that might correctly be 'The Carlton Steamship Company Ltd.' which was related to the owners of Chapman. Many references to WW2 convoy duty, mainly carrying grain. On Sep. 7, 1940 & also on Sep. 8 & 9, 1940 was bombed by enemy aircraft & damaged. Have not read where. On Mar. 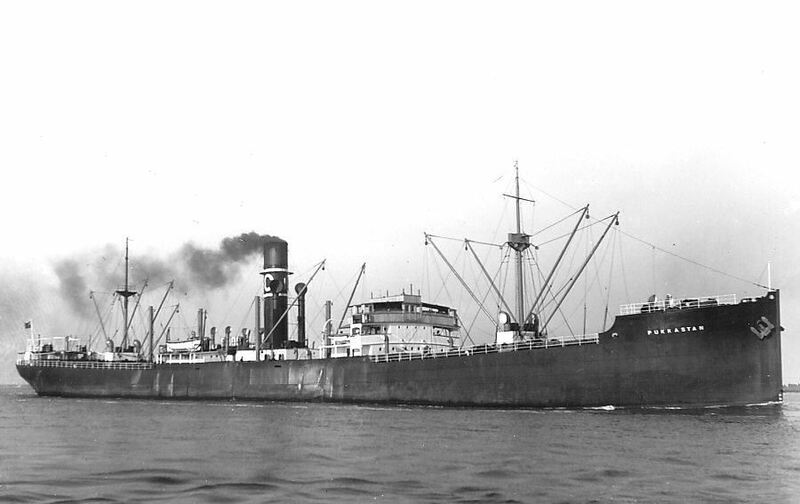 3, 1942, vessel hit a mine & sank. At 52.21N/01.58E. Off the coast of Norfolk, U.K. Can locate minimal WWW data about the vessel & no data about the 1942 circumstances. Loss of life when mined? Arie de Lange advises (thanks! ), per a link in German, that the mine was laid by the 2nd S-flotilla, KKpt Feldt in command. Data about Chapman companies is modest indeed. 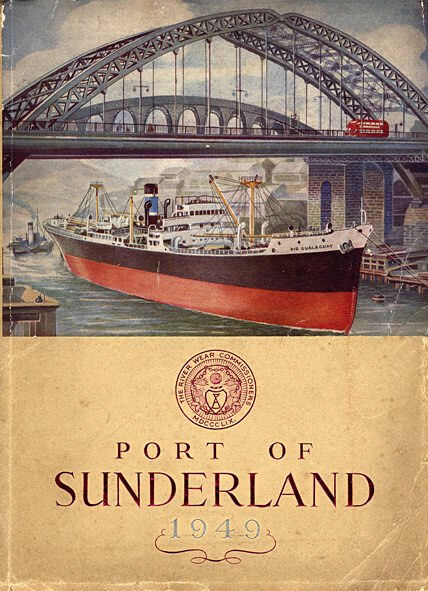 A 1965 volume, entitled 'CHAPMAN OF NEWCASTLE - The Story of a Tyneside Tramp Shipping Company' by John Lingwood & Harold Appleyard, presumably covers the company & its fleet. Anything to add? 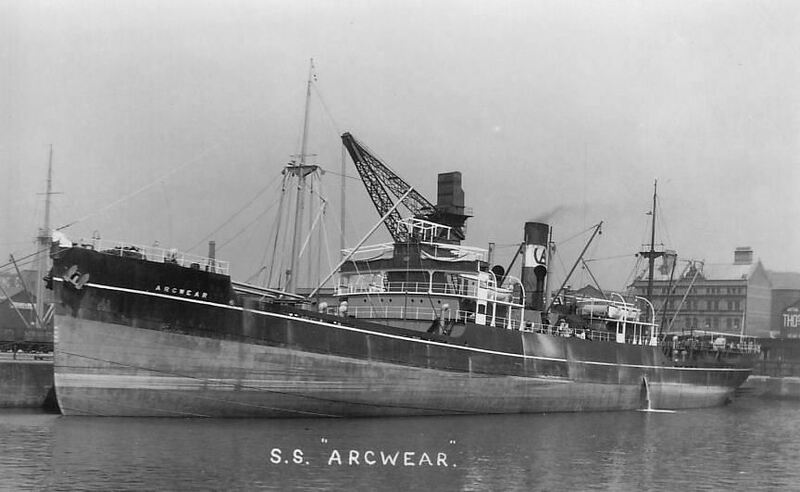 An 'arcform' cargo ship. Per 1 (data, Arcwear), 2 (data, 1933 & 1934), 3 ('convoyweb.org', WW2 convoy duty, click on 'SHIP SEARCH' then insert Lord Cochrane), 4 (Miramar, link, you now must be registered to access). About 115 metres (377.4 ft.) long, speed of 11 (have also read 10) knots. Vessel was built using the curved 'arcform' design of Sir Joseph Isherwood. Its 'loaded' sea trials took place on Jan. 22, 1934, over the Polperro measured mile off the Cornish coast, after which the vessel left on its maiden voyage to Buenos Aires, with a cargo of coal. On its maiden voyage, 'the ship suffered with heavy rolling in heavy weather, and jerky motion in calm weather. This resulted in seawater halfway up her hatches and the whole foredeck submerged under water.' The design improved fuel consumption, I understand. 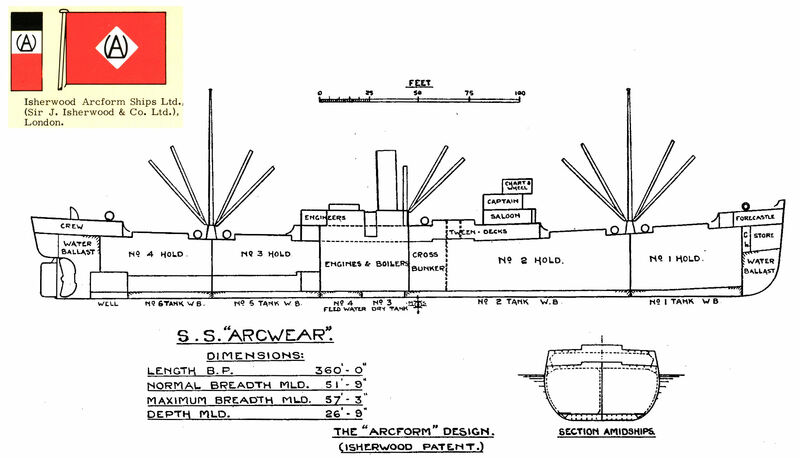 Built for Arcwear Shipping Co. Ltd. or maybe Arcwear Steamship Co. (Isherwood Arcform Ships Ltd., the managers? ), of London. 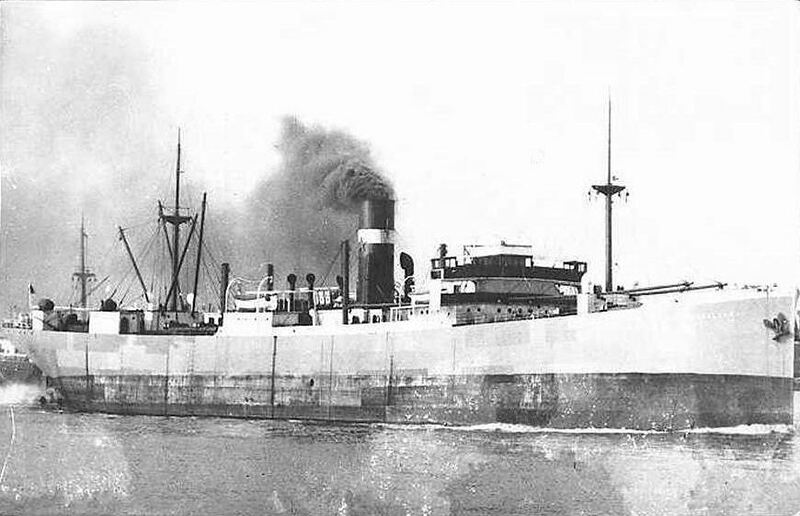 The vessel was sold, in 1936, to Norwich Steamship Co. Ltd., (Ships Finance & Management Co. Ltd., the managers), renamed Lord Cochrane & registered at London. 89 WW2 convoy references including at least 11 N. Atlantic crossings, service to W. Africa (Freetown, Takoradi) & S. America, along with many U.K. coastal voyages. 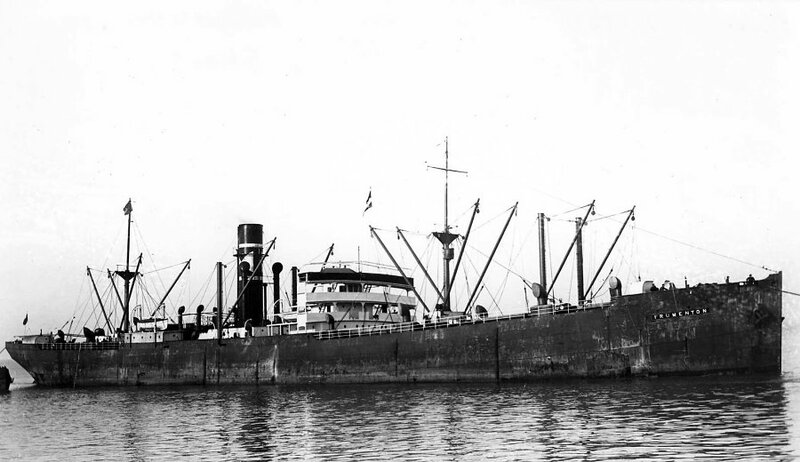 The vessel was sold in 1950 to 'Aug. Bolten Wm. Miller's Nachfolger (GmbH & Co.) KG', of Hamburg, Germany, & renamed Frieden. And sold in 1958 to N. D. Koufos & renamed Martha. And sold again, in 1964, to M. Scufalos, of Pir�us, Greece, & renamed Boston L. And sold yet again, in 1966, to Ferrando & Massone ('Ferrando'), of Genoa, Italy, & renamed Helene. But Ferrando may have been the manager rather than the owner. Since on Jul. 25, 1968, when owned by 'Concordia Enterprise, Inc.' of Panama, & en route from Constantza, Rumania, Black Sea, to Jeddah, Saudi Arabia, the vessel was stranded off Inhaca Island, near Laurenco Marques, Mozambique. At 25.58S/32.59E. The vessel's cargo was mainly timber but with some cement also. I have not read the circumstances. 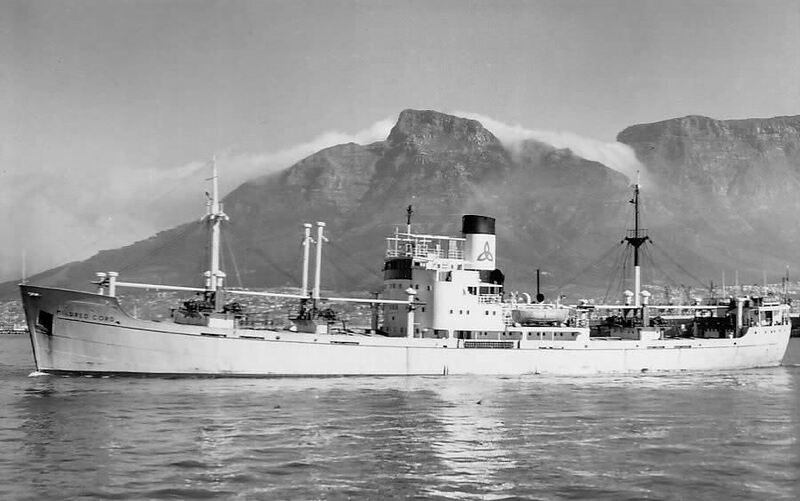 It was re-floated with the assistance of Jacob, a Dutch salvage tug, towed into Lauren�o Marques & 5 weeks later to Durban, South Africa, where she arrived on Sep. 15, 1968. Upon examination, her damage was found to be severe, & she was broken up at Durban. Can someone remind my why a 1968 voyage from the Black Sea to Saudi Arabia would not have used the Suez Canal? The canal must have been closed, likely related to then hostilities between Israel & Egypt. Yes? Not a lot of WWW data, all said & done. Can you help with more? An image? A cargo ship. Per 1 (Chapman and Willan, Ltd., flags & data), 2 (bombing, 'Thursday, 18 July'), 3 (watercolour by Laurence T. Dunn), 4 ('convoyweb.org', WW2 convoy duty, click on 'SHIP SEARCH' then insert Generton), 5 (Miramar, link, you now must be registered to access). About 135 metres long, 439 ft. 2 in., speed of 10 or 10 1/2 knots. Built for 'Carlton Steamship Company Ltd.' with R. Chapman & Son, ('Chapman'), as the managers, both of Newcastle. Extensive convoy duty (114 voyages) in WW2. Duty included a great many voyages to & from North America, also into the Mediterranean (Port Said), to W. Africa (Freetown), plus many U.K. coastal trips. The vessel would appear to have left convoy HX 55, (Liverpool ex Halifax), on Jul. 16, 1940, when NW of Ireland, for its onward trip to Middlesbrough with scrap iron & steel plate. It was bombed on Jul. 18, 1940, in the North Sea. Said to have been damaged but presumably lightly so. Since the vessel left Methil, Firth of Forth, Scotland, for Southend, Essex, (but surely, in fact, for Middlesbrough) on Jul. 19, 1940. Re Convoy SC.174, which left Halifax on Apl. 28, 1945 for Liverpool, the vessel, carrying lumber, is described as having been a straggler for 7 days. 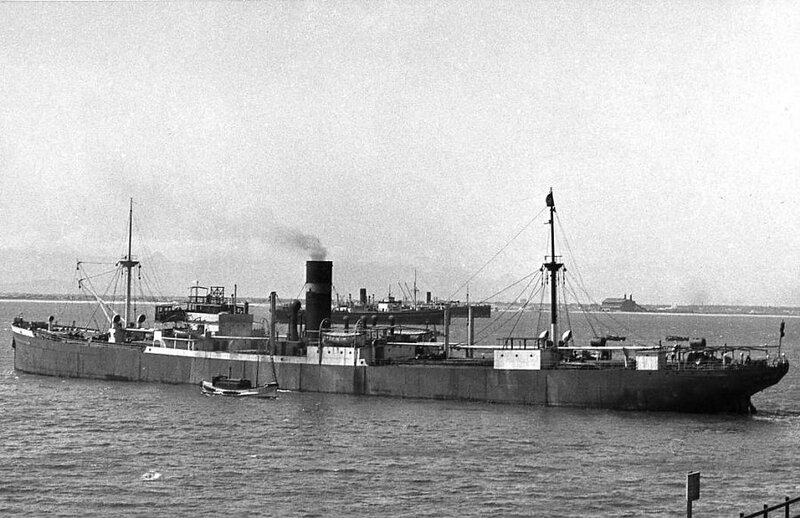 In 1955, the vessel was sold to 'Paulins Rederi Ab. Modesta', (Frank Skibdahl, Turku, Kanavaniemi), of Finland, & renamed Imatra. 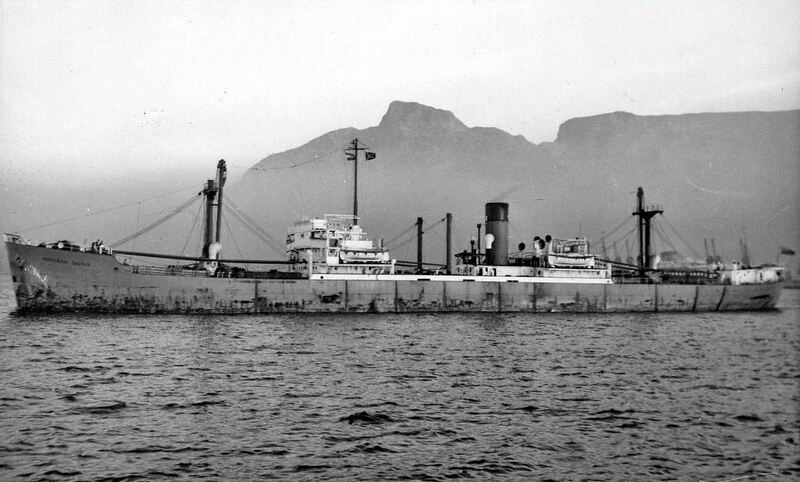 In 1960, the ship was sold to 'Wallem & Co.', (of Hong Kong? ), & renamed Capella. And sold again, in 1966, to 'Teh Hu Steamship Co.' ('Teh'), of Hong Kong, who may rather have been the managers, & renamed Bucentaur. The vessel was sold again, in 1968, to 'Cia. Nav. Pearl', of Panama, Teh the managers?, & renamed Bangkok Trader. On Oct. 1, 1968, the vessel developed 'leaks' during a typhoon while en route from Bangkok, Thailand, to Osaka, Japan. They must have been rather large 'leaks' because the vessel was abandoned at 22.30N/117.30E, off the coast of China, but soon was towed E. to Kaohsiung, Taiwan, where it arrived on Oct. 4, 1968. The vessel was subsequently heavily damaged by fire at Kaohsiung on Oct. 16, 1968, & was sold to Taiwanese ship breakers in (June?) 1969 & broken up at Kaohsiung. Anything to add? A cargo/passenger ship. Per 1 ('Flotilla Australia', data, image, Corinda), 2 ('Australasian United', data Corinda), 3 ('convoyweb.org', WW2 convoy duty, click on 'SHIP SEARCH' then insert Corinda), 4 (Miramar, link, you now must be registered to access). 356 ft. 10 in. long (overall I think), 105.3 metres long perpendicular to perpendicular, 345 ft. 6 in., speed of 12 knots. Corinda? A suburb of Brisbane, Australia. 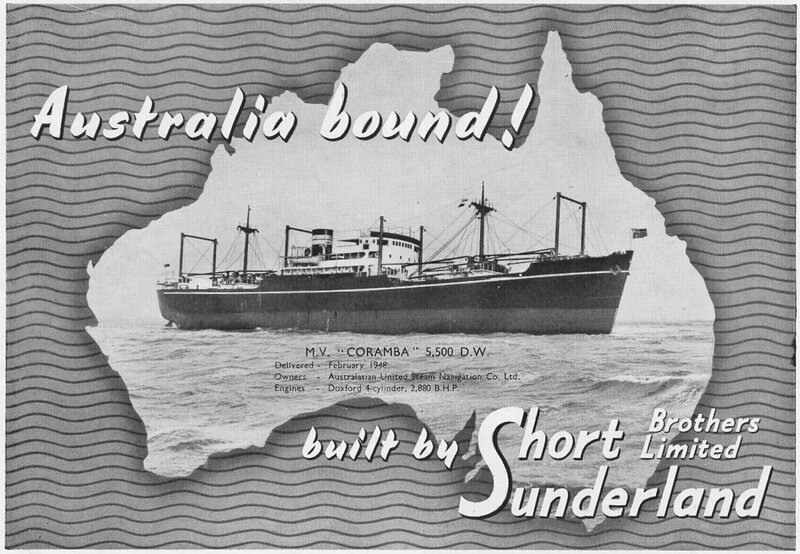 Built for 'Australasian United Steam Navigation Company Ltd.' ('Australasian'), of London & Sydney, New South Wales, Australia (have also read Brisbane & Melbourne). Their 50th fleet vessel. Its maiden voyage was on Jul. 16, 1937 (I suspect that is the arrival date in Australia). 50 WW2 convoy references, almost all of which were in Australian waters (Brisbane/Caloundra, Newcastle, Sydney, Melbourne), except for service in the Indian Ocean in Apl/Sep 1944 (Colombo, Calcutta). And then briefly independent into the eastern Mediterranean (Alexandria, Haifa). Later on, the company ran into financial difficulties & sold all of its ships - Corinda was, in fact, the last fleet vessel to be sold. In Mar. 1961, the vessel was sold to 'Power Navigation Co.', of Hong Kong, & renamed Silver Gulf. And later that same year (i.e. 1961) the vessel was sold to 'Continental Navigation & Enterprises Ltd.' ('Continental'), also of Hong Kong, (Miramar states 'Chan Hoon Ho', who was, it would seem, the President of Continental), & renamed Fortune Wind. In Oct. 1970, the vessel was sold again, to 'Sincere Navigation Co.', of Taiwan perhaps, with no change of vessel name. On Jun. 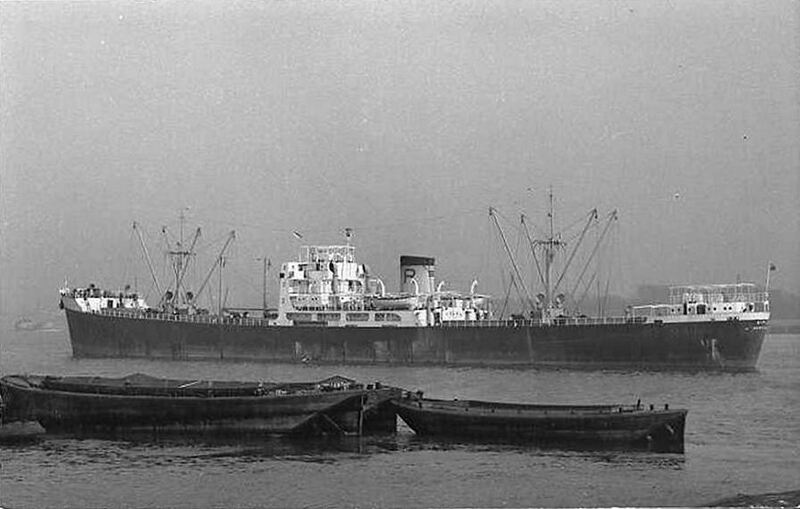 11, 1971, the vessel arrived at Hsinkang, China, to be broken up. There is not a lot of WWW available data about the vessel. Can you help with more? A small cargo ship. A coaster. Per 1 (Reoch 15% down), 2 (Lloyd's Register data, 1937/38 to 1940/41, ex 'plimsollshipdata.org'), 3 (Miramar, link, you now must be registered to access). 76.5 metres (251.4 ft.) long perpendicular to perpendicular, 259.9 ft. overall, speed of 10 knots, signal letters MMLT. 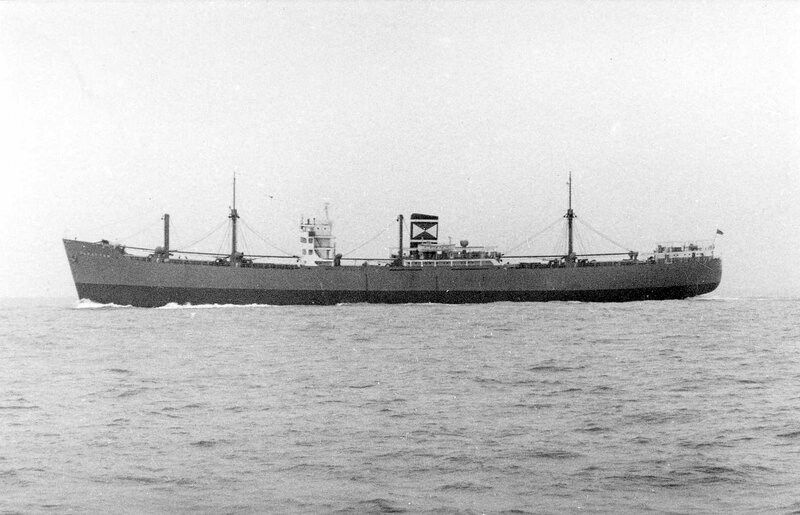 Built for Springwell Shipping Co. Ltd. ('Springwell'). David Freeman has advised (thanks!) of a voyage ex Newcastle on Feb. 17, 1953 returning to Swansea, Wales. 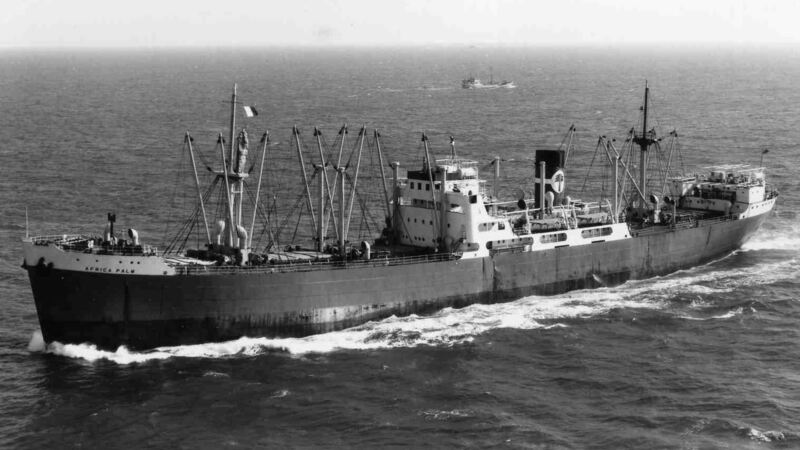 In 1953, presumably later in the year therefore, the vessel was chartered by Reoch Steamship Company Limited, of Montreal, Quebec, Canada, for the shipment of grain on the Great Lakes. Sold (later that year, I presume), to 'Eastboard Shipping' & renamed Eastdale. In 1955, the name reverted to Springdale. On Jun. 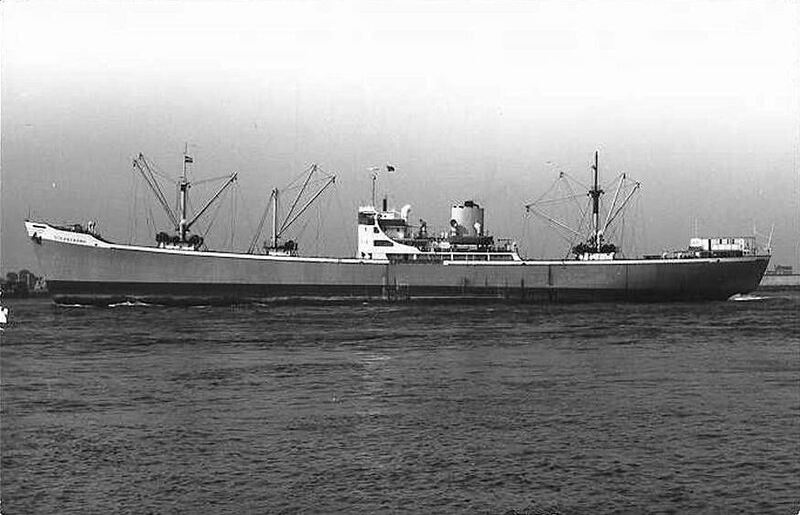 18, 1959, while en route from Munksund, Sweden, to London, with a cargo of timber, the vessel capsized when the cargo shifted. The vessel sank at 63.02N/19.39E, about 17 miles off Cape Skag, Gulf of Bothnia, off the E. coast of Sweden, near �rnsk�ldsvik. It was then owned by Springwell, so maybe they re-acquired it in 1955, but, an expired eBay item stated the owner, when it sank, to be 'East Board Shipping'. Not a lot of WWW data. Can you help with more? A small cargo ship. A coaster. Per 1 (extensive data, insert Springtide & click on link), 2 (Reoch 15% down), 3 (Lloyd's Register data, 1937/38 to 1940/41, ex 'plimsollshipdata.org'), 4 (Miramar, link, you now must be registered to access). 76.6 metres long perpendicular to perpendicular, 259.9 ft. long overall, 251.4 ft. between perpendiculars, speed of 10 or 10 1/2 knots, signal letters MMLJ. The vessel was built for 'Springwell Shipping Co. Ltd.' ('Springwell'), of London, a company noted for the carriage of timber. During WW2, from 1940 to 1947, the vessel was employed as a 'mine destructor vessel' by the Royal Navy, to combat German magnetic mines. It may have been registered in the name of the Royal Navy. Was it in fact so registered? The ship was equipped with a large electro-magnet in its hold. Which did not work too well & was superseded by 'the much lighter & highly efficient LL-sweep'. The vessel was later converted into a 'deperming' vessel. 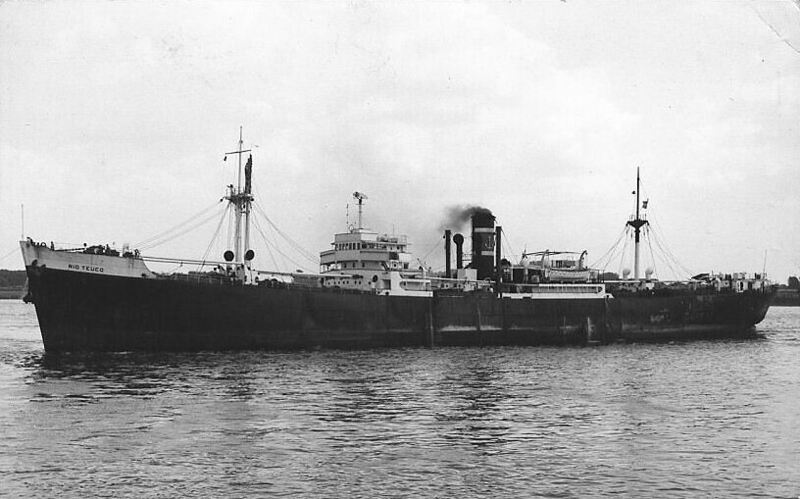 Saw service with the Eastern Fleet, based at Colombo, Ceylon, now Sri Lanka. 'Petroc', who kindly provided the 1960 image of Granny Marigo at left, advises that 'Sea Breezes' had an article in its Sep. 1982 issue about the vessel's WW2 history. Can anybody provide that article? 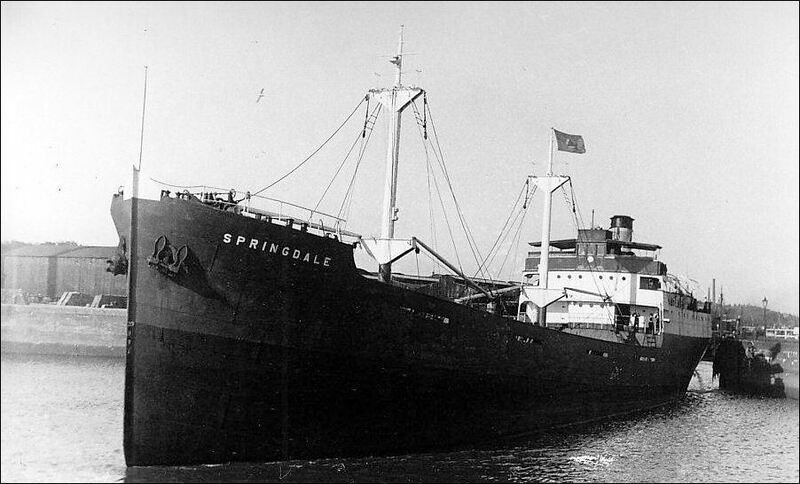 In 1947, the vessel reverted to Springwell. It 'christened' a new harbour, likely on the Thames, & discharged a cargo of timber ex Oulu, Finland. 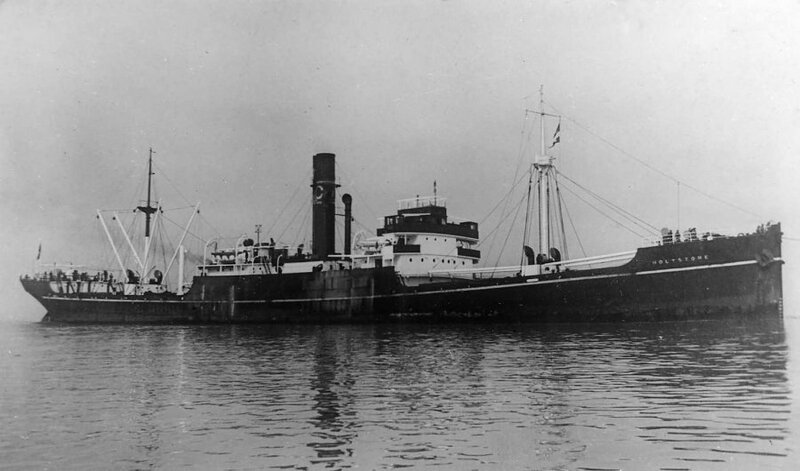 Was chartered for a period by Newfoundland-Great Lakes Steamship Co. Was in collision with Hampshire Coast in the River Ribble, Lancashire, on Mar. 6, 1952. Have not read enough detail to summarise what happened. In 1953, the vessel was sold to 'Eastboard Shipping Ltd.', of London, 'Federal Commerce & Navigation Co. Ltd.' the managers, & renamed Eastide. 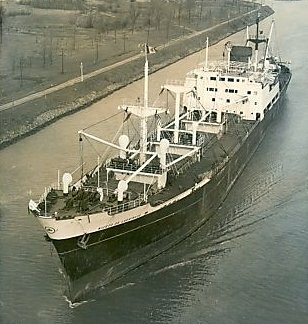 During the 1954 season, the vessel was chartered by 'Reoch Steamship Company Limited', of Montreal, Canada, for the shipment of grain on the Great Lakes. It was sold, in 1956, to 'August Bolten Wm. Miller�s Nachfolger (GmbH & Co.)', of Hamburg, Germany, & renamed Sullberg. And sold again, in 1960, to 'Compagnia Maritima Angelikana S.A.', of Panama, 'D. J. Papadimitriou' the manager (which may mean D. J. Papadimitriou Sons, a shipping company earlier headquartered in Alexandria, Egypt.) Was then renamed Granny Marigo & registered at Monrovia, Liberia. But ... the 1960 image at left of Granny Marigo indicates that the vessel was then registered at Beirut (Beyrouth), Lebanon. The vessel was sold, in 1961, to 'S.A.N.A.' (i.e. 'Societ� Abruzzese di Navigazione per Azioni', of Venice, Italy, & renamed Guiseppe Riccardi. In Q1 of 1972, the vessel was broken up at La Spezia, Italy. 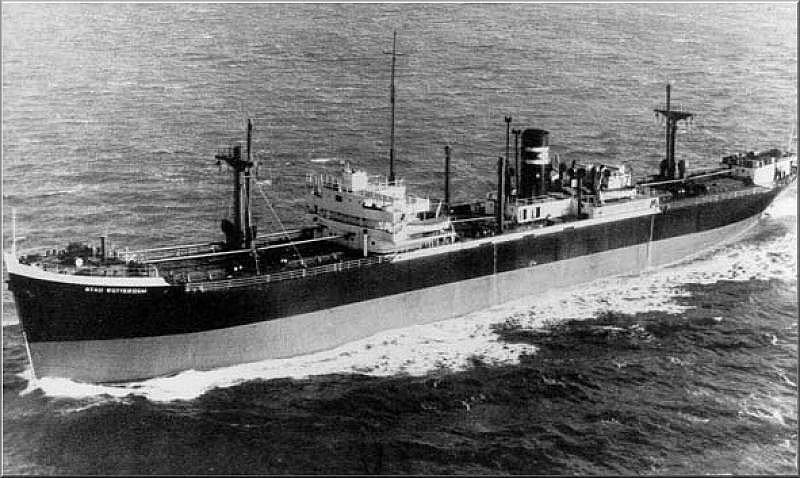 Link 1 indicates that the initial gross tonnage was 1627, otherwise the vessel must have been modified in 1956, to become 1638 tons. Other more modest tonnage changes, in subsequent years. Can you add anything more or clarify the above? Another image? A cargo ship. Per 1 (Inch Steamship, Inchcastle), 2 (70% down 'CAPILANO'), 3 (Anglo-Indian), 4 (New Zealand), 5 (Miramar, link, you now must be registered to access). About 137 metres long, speed of 10 knots. Built for 'Nitrate Producers' Steamship Co., Ltd.', (Anglo Line), Lawther, Latta & Co. Ltd. of London, managers. In mid Jun. 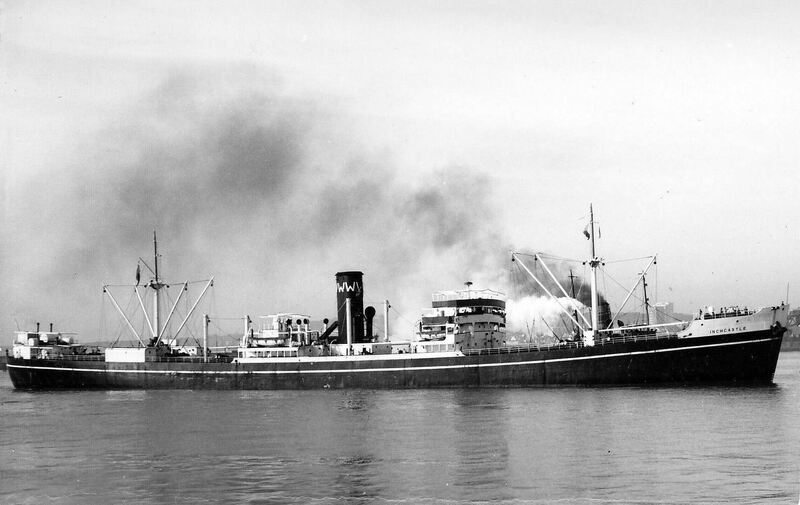 1938, the chartered vessel, carrying a 36 man crew & a general cargo which included gold concentrate & sulphur, was en route from Montreal, Quebec, to Vancouver, British Columbia, both Canada, via Tacoma, Washington, when a fire broke out in her holds. After the crew's 3 day battle against the flames, the fire was finally extinguished when the vessel arrived at Los Angeles, California, & the fire was extinguished by the harbour fireboats of San Pedro (Los Angeles). 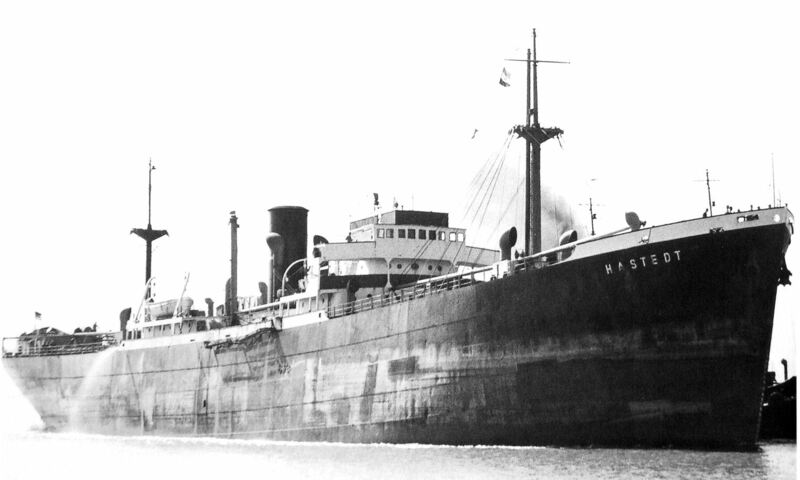 In 1943, the vessel was sold to Reardon Smith & Sons, 'Rearden Smith Line', of Cardiff. Due to Government restrictions, the vessel could not be renamed until 1948 - when it was renamed Tacoma City. 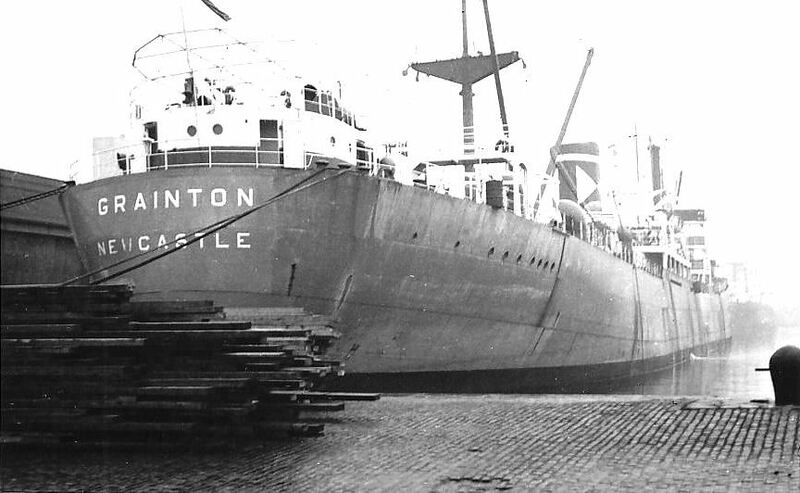 In 1954, sold to Williamson & Co. ('Williamson') of Hong Kong (or maybe to Inch Steamship Company Ltd., a subsidiary of Williamson), & renamed Inchcastle. Visited Auckland, New Zealand, once, on Sep. 1, 1956. In 1966 the vessel was sold to Prosperity Steamship Co. (or to 'Wing On Steamship Co. SA'), also of Hong Kong, & renamed Lucky. Registered at Panama. On Nov. 8, 1969, Lucky arrived at Kaohsiung, Taiwan, to be broken up. Anything to add? A cargo ship. Per 1 (Chapman and Willan, Ltd., flags & data), 2 ('pdf', ref. page 11 Hermiston), 3 (Miramar, link, you now must be registered to access). 133.6 metres long overall, 439 ft. 2 in., speed of 10 knots. Built for The Carlton Steamship Company Ltd. ('Carlton'), (R. Chapman & Son, the manager, related to the owners of Carlton), of Newcastle. It would seem that Carlton & Cambay Steamship Co. Ltd. became the owners in 1941. 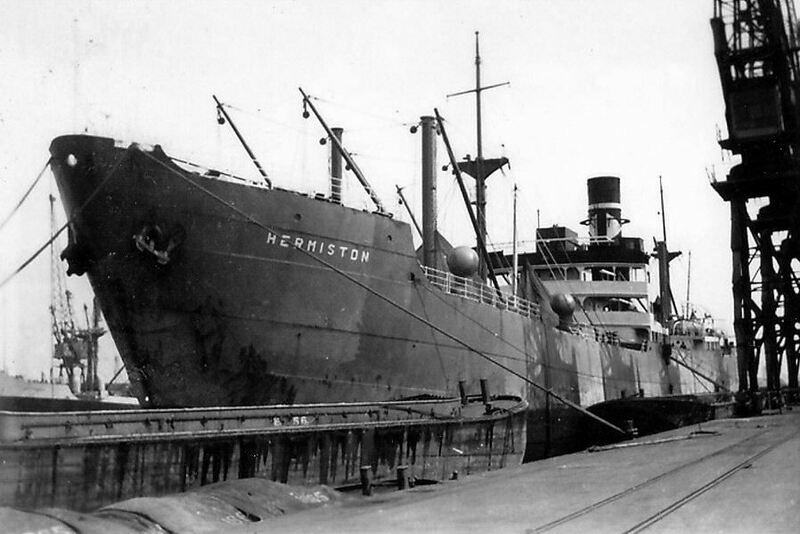 Hermiston was the second last ship out of Rangoon before that city was seized by the Japanese (in 1942?). 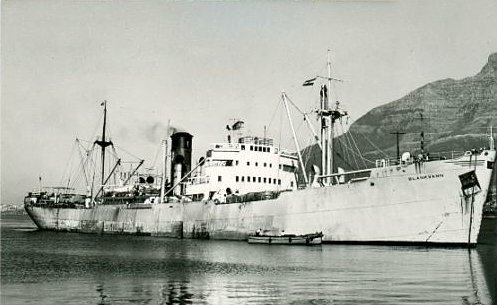 The vessel was sold, in 1960, to 'Pan Norse Steamship Co.', of Panama, Wallem & Co., of Bergen, Norway, likely the managers, & renamed Nego Trader. And sold, in 1966, to 'Kien An Steamship Co., S.A.', of Panama, 'C. W. Hsin' likely the agent, & renamed Kien An (a name that seems to be associated with Vietnam). 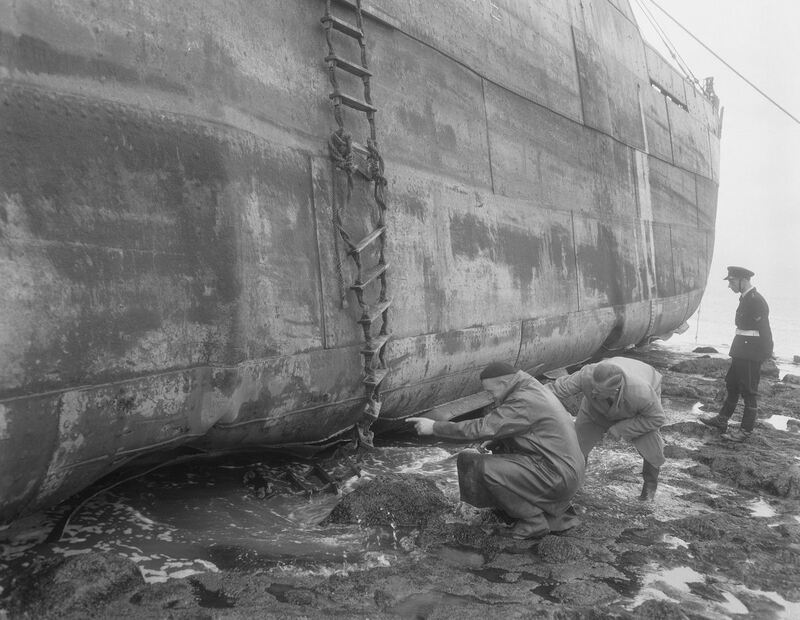 On Dec. 16, 1967, the vessel was blown aground off Kikizaki, Naoetsu, Japan, in heavy weather. The vessel dragged its anchors, when awaiting a berth at Naoetsu to unload her cargo of manganese ore ex Thailand. At 37.17N/138.34E (an incorrect 'inland' reference). I read that 38 members of the crew were rescued by Japanese Air Force helicopters. 5 crew members dived into the icy waters & made it to shore though one of the 5 later died. Four others, who also, it is presumed, dived from the ship, were never found. So 5 lives were lost. The ship? It broke into two pieces in the heavy seas. WWW data about the vessel seems to be non-existent. Anything to add? 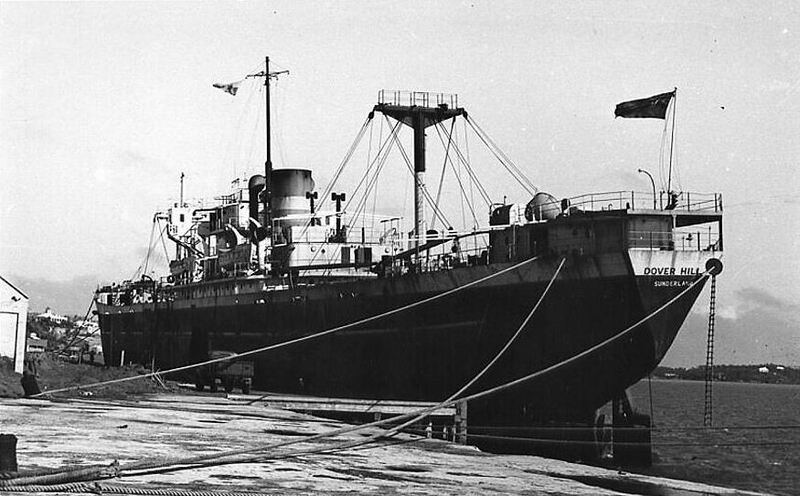 A cargo ship which was launched on Oct. 30, 1939. Per 1 (U-229), 2 (U-633), 3 (image, Fro), 4 (Chapman and Willan, Ltd., flags & data), 5 ('convoyweb.org', WW2 convoy duty, click on 'SHIP SEARCH' then insert Scorton), 6 (Montrose, about 50% down, search for Winsome), 7 & 8 (sinking of U-633), 9 ('southampton.spydus.co.uk' Lloyd's Register listings, 1939 thru 1945), 10 (Miramar, link, you now must be registered to access). 427.0 ft. long perpendicular to perpendicular, 439.2 ft long (133.87 metres) overall, speed of 10 knots, signal letters GMVL, 359 HP engines by George Clark (1938) Limited of Sunderland. 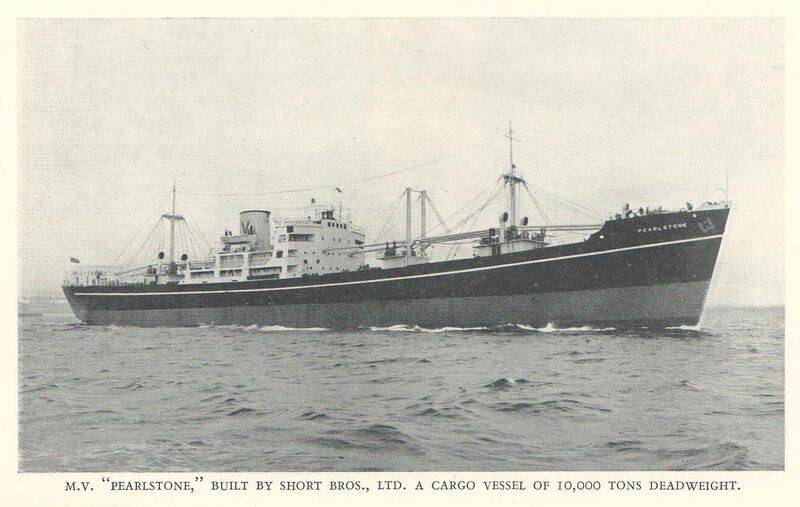 Built for Carlton Steamship Company Ltd. ('Carlton'), of Newcastle, (R. Chapman & Son, the manager, related to the owners of Carlton), which ownership became, from 1941, Carlton Steamship Company Limited & Cambay Steamship Company Limited. Extensive convoy duty (88 voyages) in WW2. Duty included a great many voyages to & from North America, also to W. Africa (Freetown, Sierra Leone), plus many U.K. coastal trips. In early Mar. 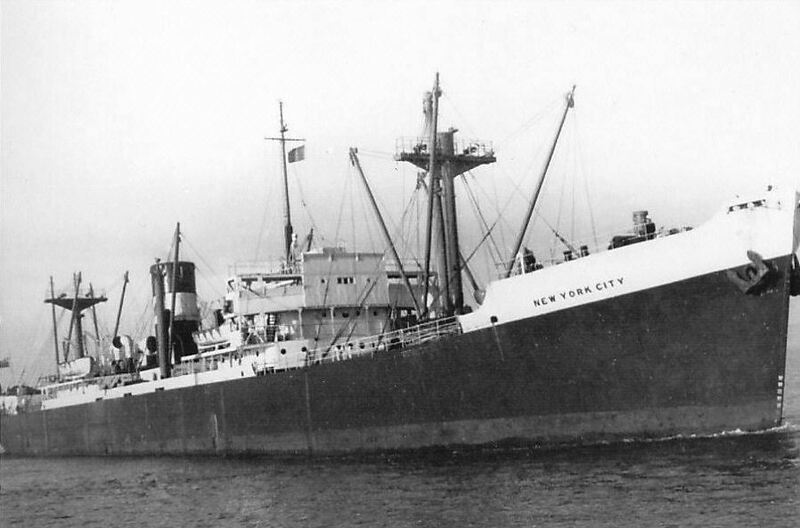 1943, the vessel, under the command of Terrot Glover (1905/1971), was en route in convoy SC.121 from New York City to Liverpool with a cargo of sugar. On Mar. 10, 1943, at daybreak, the vessel was attacked by German submarine U-229 which fired 2 torpedoes at Scorton - but both of them missed their target. A little later that same day, two submarines were spotted within the convoy & one of them came close to the surface right under Scorton's bow. Scorton ran into/rammed what proved to be U-633, & as a result of the collision the submarine sank with the loss of 43 lives - at 58.51N/19.55W in the N. Atlantic south of Iceland. U-633 was commanded by Oberleutnant zur See Bernhard M�ller. Scorton suffered both bow & rudder damage from the collision & had to be towed into Greenock by tug Cherbourgeois III. I should note that link 2 refers to U-633 being rather sunk by depth charges from U.S. Coast Guard cutter Spencer. 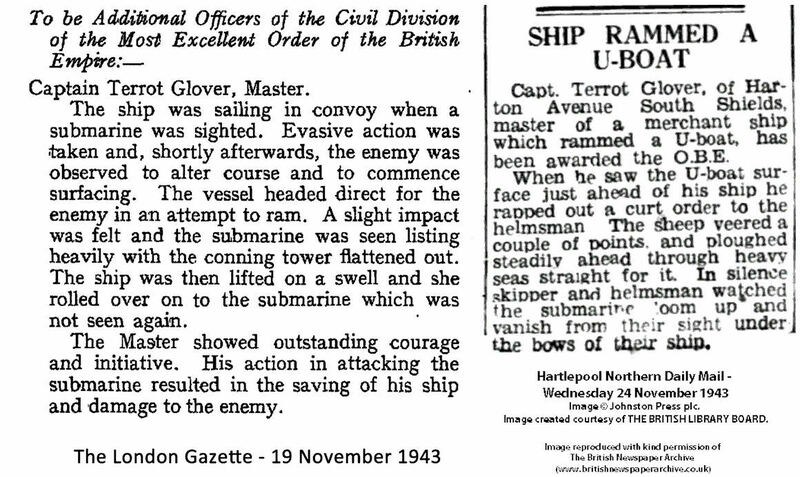 Such report seems likely to be incorrect, since Scorton's captain, Terrot Glover, (his image), was awarded the OBE (Member of the Order of the British Empire) for his actions respecting the sinking, as per these newspaper cuttings kindly provided by a friend of the site (1 & 2). The vessel's 3rd Officer, William McDonald Nicolson received a Commendation also. 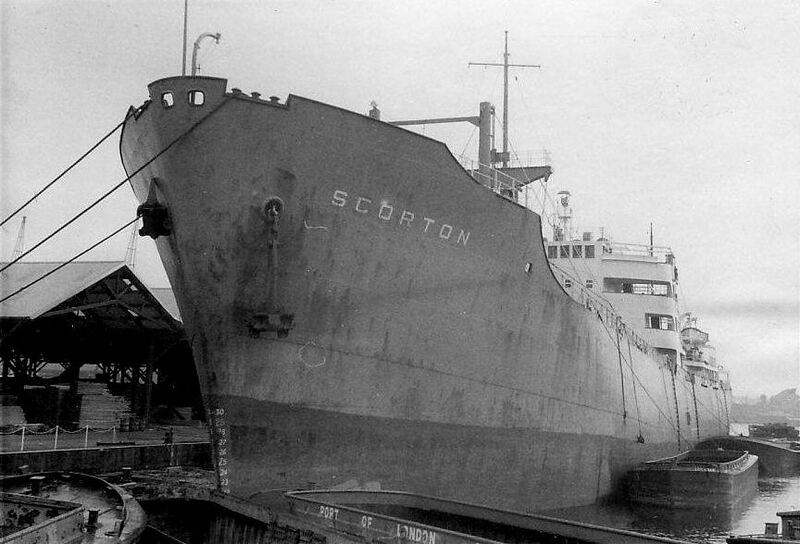 Scorton was soon repaired & back into service. On Sep. 8, 1943, the vessel rammed amidships & seriously damaged Matapedia, a Canadian Flower Class corvette, in thick fog off Sambro Lightship (approaches to Halifax harbour, Nova Scotia, Canada). 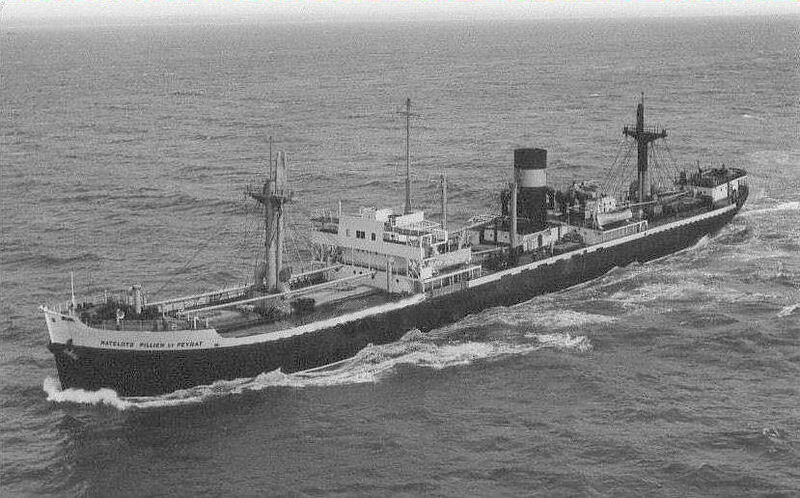 Scorton was sold in 1955 to A/S D/S Ask, A. Kjerland & Co. A/S of Bergen, Norway, the managers & renamed Fro. And sold again in 1965 to Winsen Steamship Co. S.A. of Panama, Winley Shipping Co., of Hong Kong the managers, & renamed Winsome. On Jun. 10, 1967, the vessel, en route from Kaohsiung, Taiwan, to Da Nang, Vietnam, in ballast, caught fire at 16.30N/115.13E, in the S. China Sea, NW of Manila, Philippines. It sank the next day at 16.45N/116.45E. USS Montrose came to her rescue but Winsome had sunk by the time she arrived on the scene. The crew was rescued by a Russian ship (unnamed), I read. I have seen nothing yet about the circumstances. WWW data about the vessel is, despite all of the above, modest. Anything to add? A cargo ship. Per 1 (Barnby 75% down - convoy HX126), 2, 3 & 4 (all May 22), 5 (page in German), 6 (Miramar, link, you now must be registered to access). A very short life! 439 ft. (130.2 metres) long. Built for 'Rowland & Marwood's Steamship Co. Ltd.', ('Headlam & Son' managers), of Whitby. 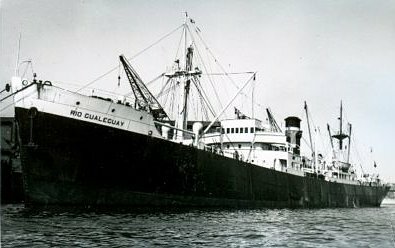 On May 10, 1941, Barnby left Halifax, Nova Scotia, destination Hull, as part of convoy HX126 (started as 29 ships), with a cargo of bagged flour from Saint John, New Brunswick. On May 20, a submarine was sighted & the convoy scattered. 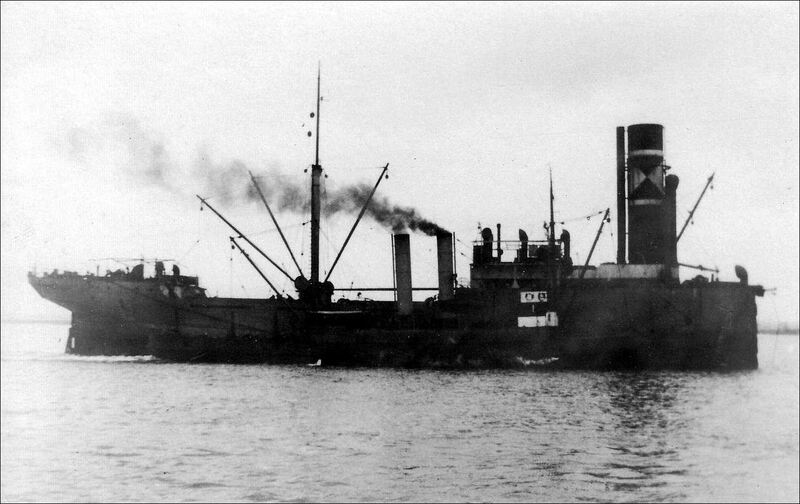 Barnby was hit by 2 torpedoes fired by U-111 & sank at 1340 on May 22, 1941, SW of Iceland, at 60.30N/34.12W. But a long expired eBay item said that the cargo of flour kept her afloat after the crew abandoned ship & that it is not known where exactly she later sank. 2 lives lost (some sites say 1 only). 44 survivors, including the master, were adrift for 9 days, rescued by British light cruiser Aurora on May 30th, & landed 9 days later at Reykjavik, Iceland. A splendid builder's model of the vessel, 146 cm long, was listed on eBay but is long expired. The vendor is no longer on eBay. Is it possible that you have anything to add? Your contribution of knowledge would be most welcome. A cargo ship. Per 1 [data about 45% down, Hindustan (6)], 2 ('convoyweb.org', WW2 convoy duty, click on 'SHIP SEARCH' then insert Hindustan), 3 (George Sigalas), 4 (Miramar, link, you now must be registered to access). 137.2 metres long, speed of 10 1/2 knots. 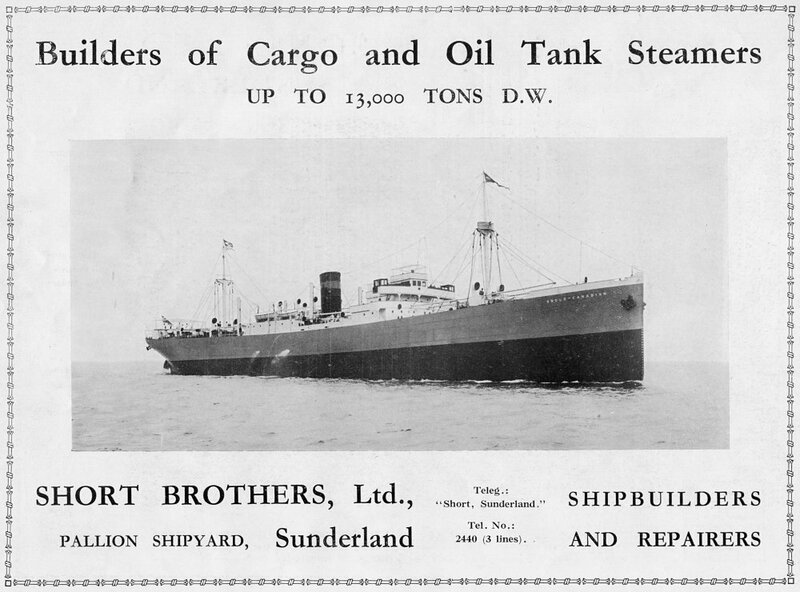 Built for 'Hindustan Steam Shipping Co. Ltd.', of Newcastle, owned by 'Common Brothers Ltd.' (the ship's managers). 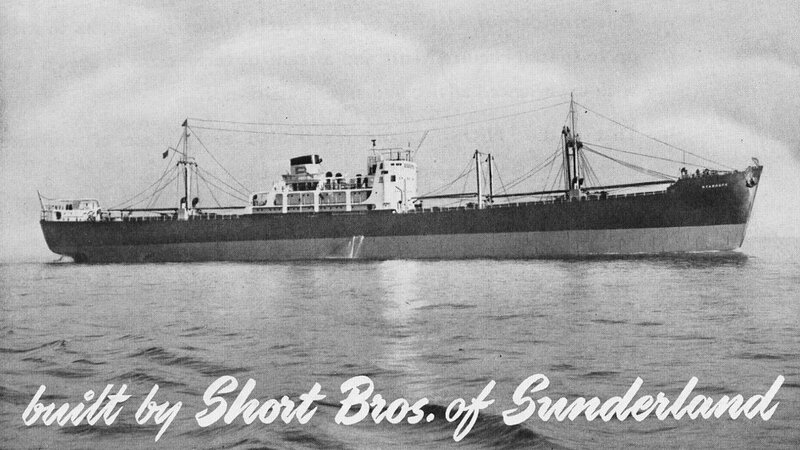 The 6th 'Common Brothers' vessel of the name (they had 8 over the years). Extensive convoy duty (71 voyages) in WW2. Duty included 5 voyages to & from North America, service in Indian Ocean & Middle East (Bombay, Calcutta, Colombo, Suez), & many U.K. coastal trips. 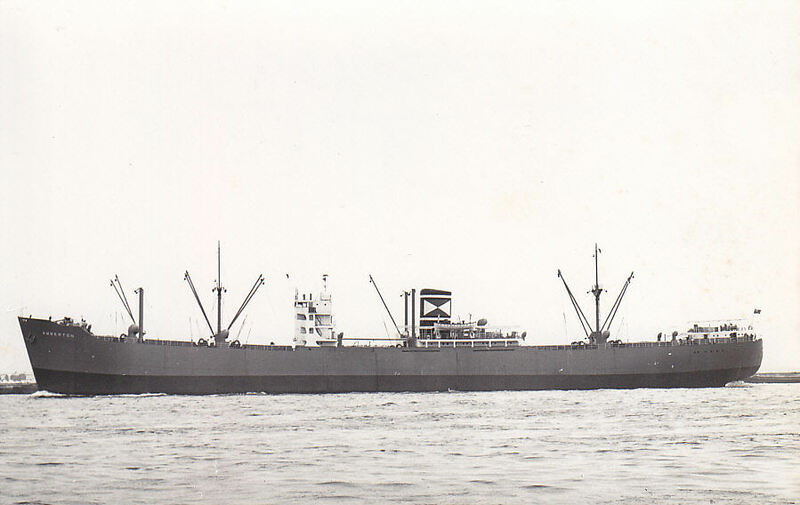 In 1954, vessel was sold to Rederi A/B Atos, of Sweden, (Allan Borjesson, the manager), & renamed Almen. 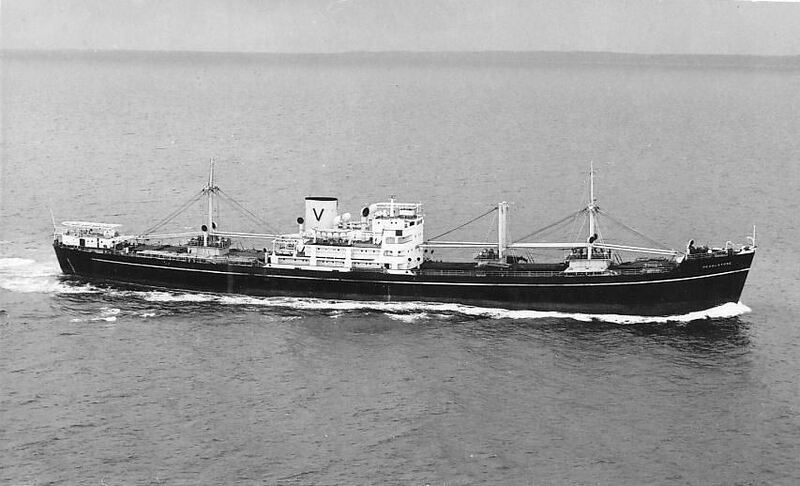 In 1963, vessel was sold to T. Stafilopatis et al ('Stafilopatis'), of Greece, & renamed Sas. It seems likely, however (3), that George T. Sigalas ('Sigalas') was in fact the owner & Stafilopatis maybe was the manager. 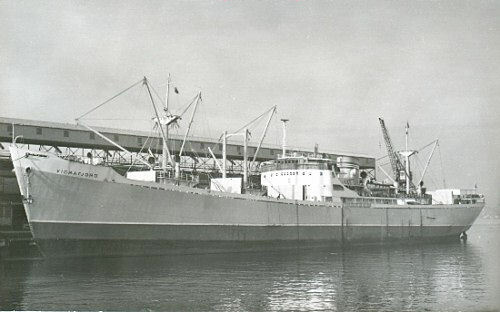 On May 29, 1967, the vessel, chartered to 'Raznoeksport', left Novorossiisk (Black Sea coast of Russia) for the Persian Gulf with a cargo of cement. An engine defect arose on Jun. 1, 1967, & the vessel proceeded to Piraeus, Greece, to effect necessary repairs. By the time she was ready to proceed, 14 days later, the Suez canal was closed due to the then Israeli-Arab six-day war. 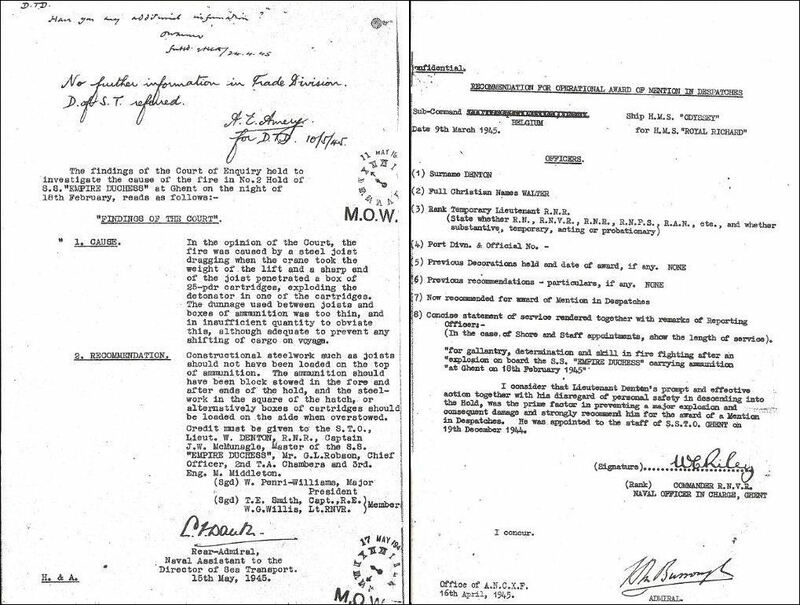 The cement was then delivered to the Persian Gulf (via Cape of Good Hope) & Sigalas claimed, unsuccessfully, for compensation for extra incurred expenses. Vessel was sold again in 1972. To whom? No name change. Vessel was laid up in 1977 & on Jul. 23, 1979, arrived at Santander, Spain, to be broken up. Can you add anything? A cargo ship. Per 1 (Turnbull Scott history, 50% down), 2 ('convoyweb.org', WW2 convoy duty, click on 'SHIP SEARCH' then insert Empire Summer), 3 (image Stonegate, but you must be registered to see it), 4 (Miramar, link, you now must be registered to access). 134.1 metres long overall, 130.5 metres perpendicular to perpendicular, 428 ft., speed of 10 knots. 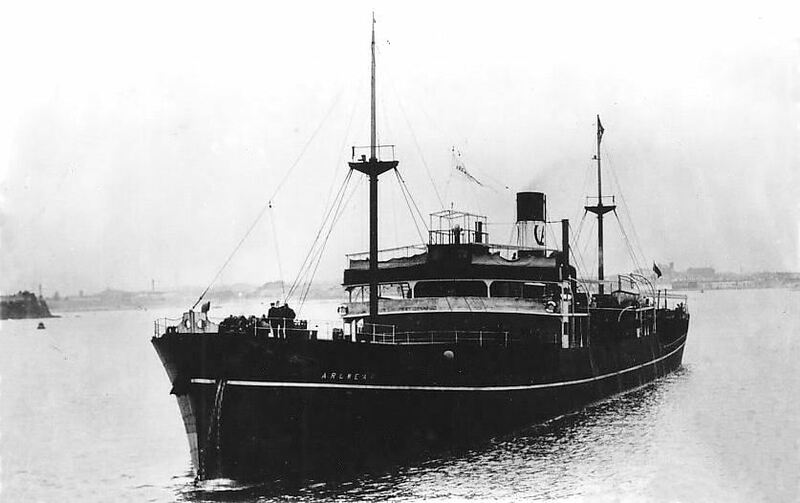 The vessel was suilt for the Ministry of War Transport (initially managed by 'Haldin & Phillips Ltd.' & then by 'Turnbull, Scott & Co.', both of London). 79 WW2 convoy references including at least 5 N. Atlantic crossings, extensive service into the Mediterranean (Port Said, Alexandria, Augusta, Naples, Bone), to W. Africa (Freetown), & many U.K. local. 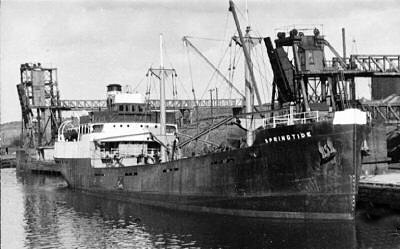 The vessel was sold in 1945, to Turnbull Scott Shipping Company Ltd., a tramp ship company, of London, & in 1946 was renamed Stonegate. 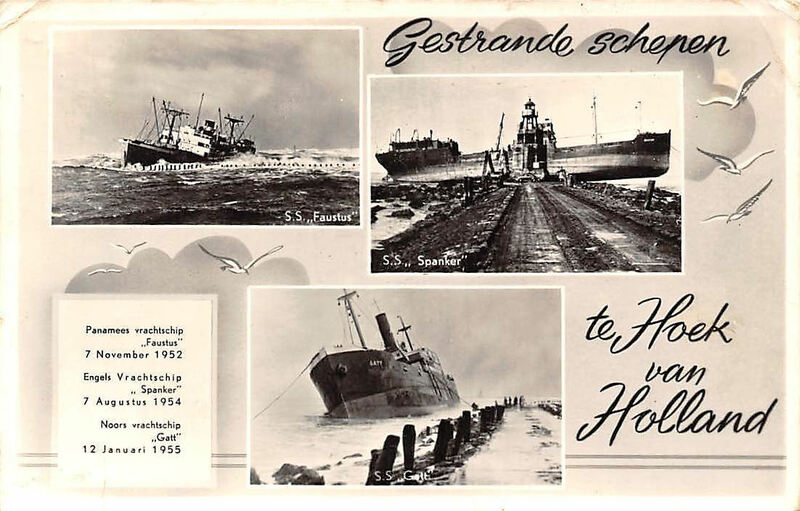 In 1955, the vessel was sold to 'Partenreederei Hastedt', ('Carl Meentzen Schiffahrt und Handel GmbH', the managers), both of Bremen, Germany, & renamed Hastedt. The vessel was sold, in 1959, for �130,000, to the Government of the People's Republic of China, & renamed Ho Ping 52 (per Miramar) & Hoping Wu Shi Er, per 1 (maybe 'Err' at the end). 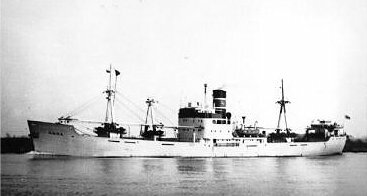 Was renamed Zhan Dou 52 in 1967. Transferred to (or registered under) China Ocean Shipping Co, of Peking, China, in 1973. Per 1, may have been renamed Ho Ping 52 in 1979. Reportedly broken up in China, in 1985. Certainly deleted from Lloyd's Register in 1984/85. Is it possible that you have anything to add? Or can correct the above? A cargo ship. Per 1 ('convoyweb.org', WW2 convoy duty, click on 'SHIP SEARCH' then insert Newbrough), 2 (Miramar, link, you now must be registered to access). 137.2 metres long, speed? Built for 'Northumbrian Shipping Corporation Ltd.', of Newcastle, which company was related to both 'Hindustan Steam Ship Co. Ltd.', & 'Common Brothers Ltd.' (the last were the ship's managers). 52 WW2 convoy references including 5 voyages across the N. Atlantic, generally carrying grains, voyages to the Mediterranean, Caribbean, Iran, West Africa (Freetown, Sierra Leone), & coastal U.K. trips. 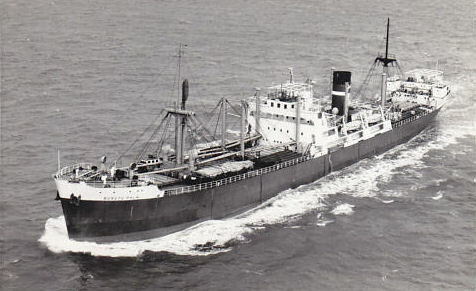 The vessel was sold, in 1955, to 'The Aviation & Shipping Co. Ltd.', of London, 'Purvis Shipping Co. Ltd.', also of London, the managers & renamed Avisbay. 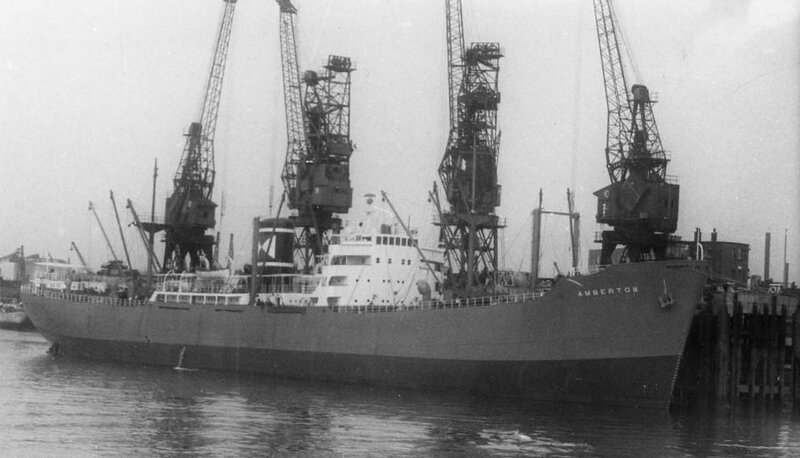 In 1962, the vessel was sold to 'Aegean Nav. Co. Inc.', of Beirut, Lebanon, 'L. Nimicos' the manager, & renamed Giannis. In Sep. 1969 the vessel had engine trouble, & went to 'Fuji Marden & Co. Ltd.' ('Fuji'), of Hong Kong. In Oct. 1969, the break up of the vessel commenced at Fuji. Can you add anything? A cargo ship. 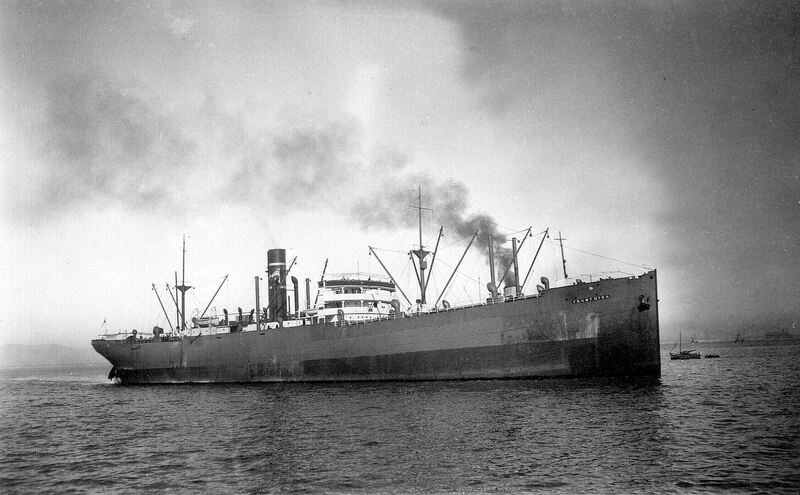 Per 1 ('plimsollshipdata.org', Lloyd's Register listings, Empire Envoy, 1942/43 thru 1945/46), 2 (1965 image Verna Paulin), 3 (50% down, image La Orilla but I think not the correct vessel), 4 (Miramar, link, you now must be registered to access). 431.0 ft. long perpendicular to perpendicular, 446.5 ft. long overall, signal letters BFDF. Built for Ministry of War Transport, managed by Hugh Roberts & Son. Involved in convoy work in 1943 & probably later also. 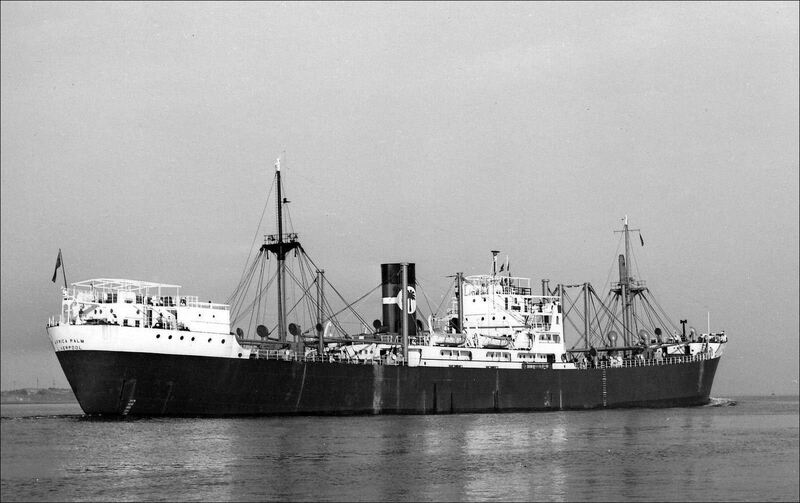 The vessel was sold in 1946 to Thompson Steamshipping Co. Ltd., of London, & renamed Cheltenham. 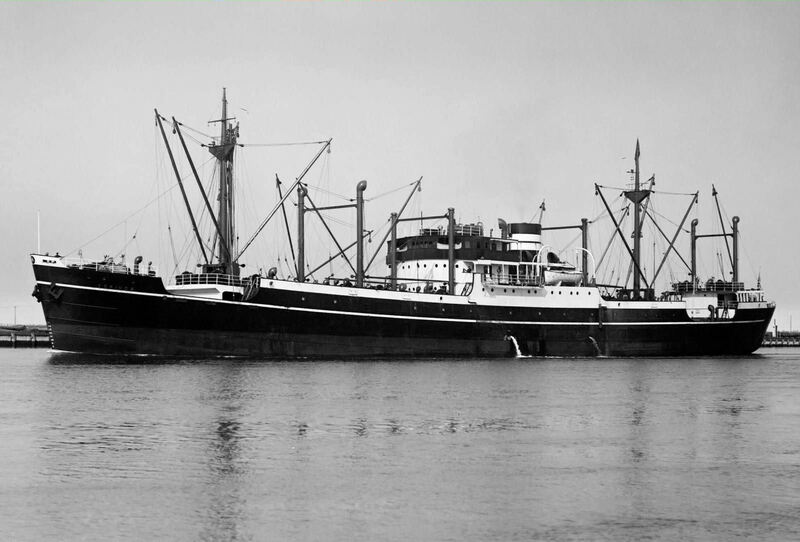 The vessel visited Auckland, New Zealand, 4 times between Oct. 1951 & Feb. 1952. 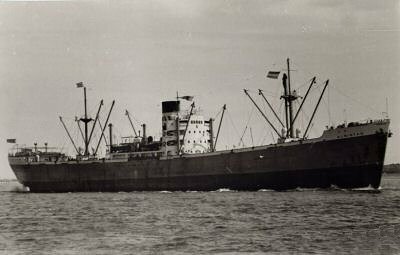 In 1952 (or maybe in 1951) the vessel was sold to Buries Markes Limited ('Buries'), grain & coal shippers, & renamed La Orilla. It was transferred, in 1954, to Louis Dreyfus & Co. Ltd., of France, (owners of Buries). 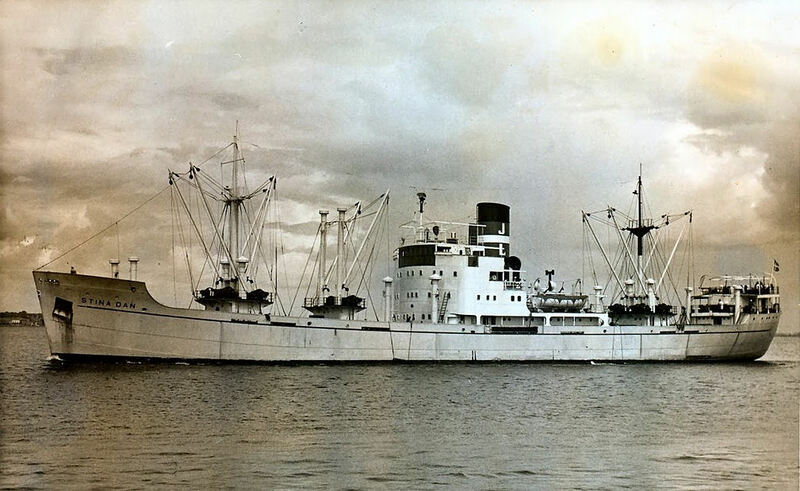 In 1955 the vessel was sold to 'Stallbergs Grufve Rederi', of Stockholm, Sweden, & renamed Stallberg. And sold to other Swedish owners in 1957 & 1960 - to 'Rederi A/B Stellvik' & to 'Stallbergs Grufve Rederi', respectively, both of Stockholm. In 1962, Stallberg was sold to 'Paulins Rederi A/B', of Abo (Turku), Finland & renamed Verna Paulin. The vessel arrived at Bruges, Belgium, in Jul. 1969, to be broken up. is it possible that you have anything to add? A cargo ship. Per A (e-Bay image, Ioannis Chandris), 1 ('convoyweb.org', WW2 convoy duty, click on 'SHIP SEARCH' then insert Empire Keats), 2 ('convoyweb.org', WW2 convoy duty, Ionion), 3 (Miramar, link, you now must be registered to access). 431 ft. long. Built for the Ministry of War Transport. 17 WW2 convoy references thru 1943 as Empire Keats, including a N. Atlantic crossing & service to W. Africa & Caribbean. Sold or transferred to the Greek Government in 1943 & renamed Ionion. (1 states Ionian). 21 WW2 convoy references as Ionion, including 2 N. Atlantic crossings & service to South Africa. In 1944/45, many independent voyages in Indian Ocean & to New Zealand & Australia. In 1947, sold to 'Mrs. 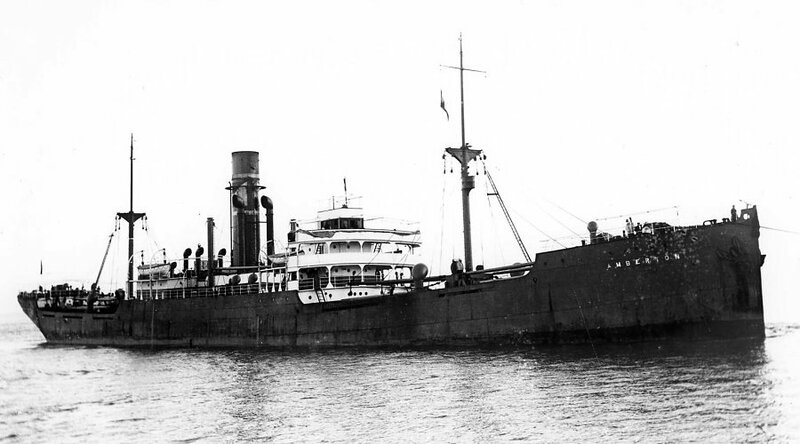 Evegenisa J. Chandris', of Greece, & renamed Ioannis Chandris, (Chandris Lines, perhaps?). 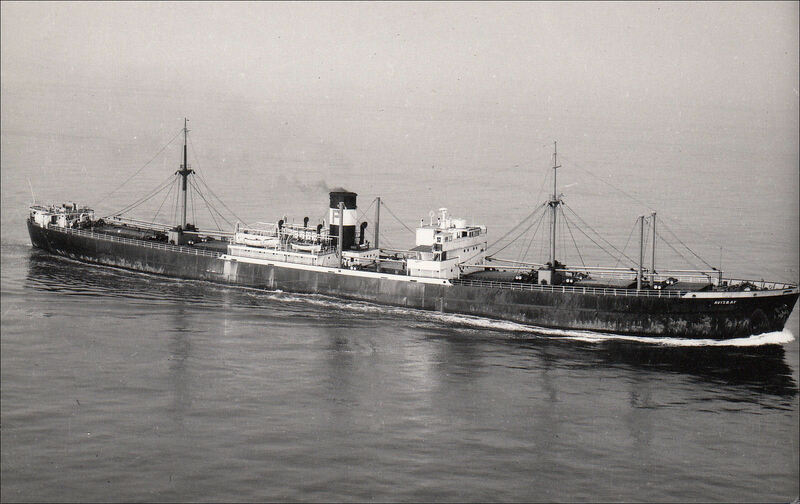 Sold in 1955 to 'Navigation de Samos' (Samos Steamship Co.), also of Greece, (D. Inglessi Sons the managers? ), & renamed Ioannis Inglessis. Sold in 1965 to either a) Welfare Marine Corp., of Liberia, or b) Thai Chong Nav. 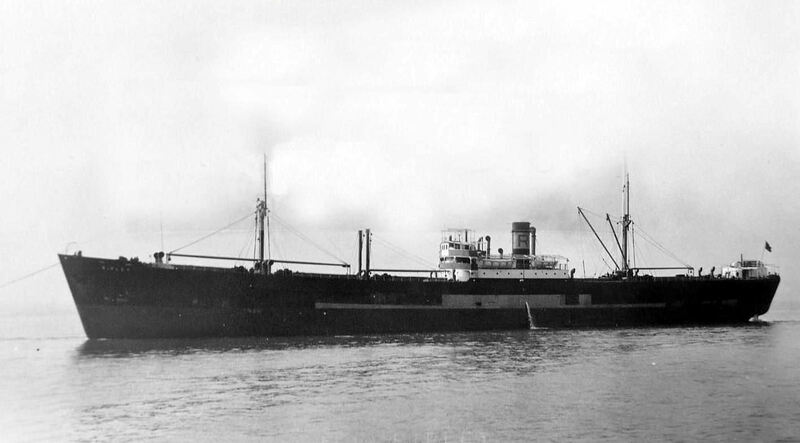 Co., possibly of Taipei, & renamed Thai Long. In Oct. 1966, arrived at Keelung, Taiwan, to be broken up. Is it possible that you have anything to add? An image perhaps? A cargo ship. Per 1 (T. & J. Harrison, Artisan), 2 ('convoyweb.org', WW2 convoy duty, click on 'SHIP SEARCH' then insert Empire Newton), 3 & 4 ('shipsnostalgia', data & images, Artisan, but you must be registered to see either of them), 5 (Miramar, link, you now must be registered to access). 136.1 metres long overall, 129.5 metres perpendicular to perpendicular, 431 ft., speed of 11 knots. Built for Ministry of War Transport, managed initially by W. H. Cockerline & Co. Ltd., of Hull, & later, in 1944, by T. & J. Harrison Ltd., of Liverpool. 52 WW2 convoy references as Empire Newton, including 5 N. Atlantic crossings (3 of the return voyages were independent - 4 of the W. bound crossings were independent also), service into the Mediterranean (Malta, Augusta, Bari, etc.). Also 6 voyages to Juno and Gold beaches, Seine Bay, France, in Jun/Jul 1944 re the Normandy landings. From Oct. 1944, the vessel was mainly independent, either in the Indian Ocean (Cape Town, Durban, Mombasa, Colombo, Calcutta, Visakhapatnam in India), or in S. American waters (Buenos Aires, Rosario, Montevideo). Also U.K. coastal voyages. The ship suffered damage to her port quarter on Jul. 14, 1945 when at Calcutta, India - hit by Rose, a tug. 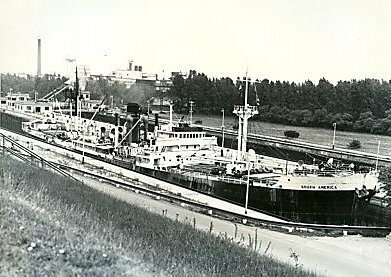 The vessel was sold, on Jan. 29, 1946, for �139,398, to Charente Steamship Co. Ltd., owned & managed by T. & J. Harrison Ltd., both of Liverpool, & renamed Artisan. 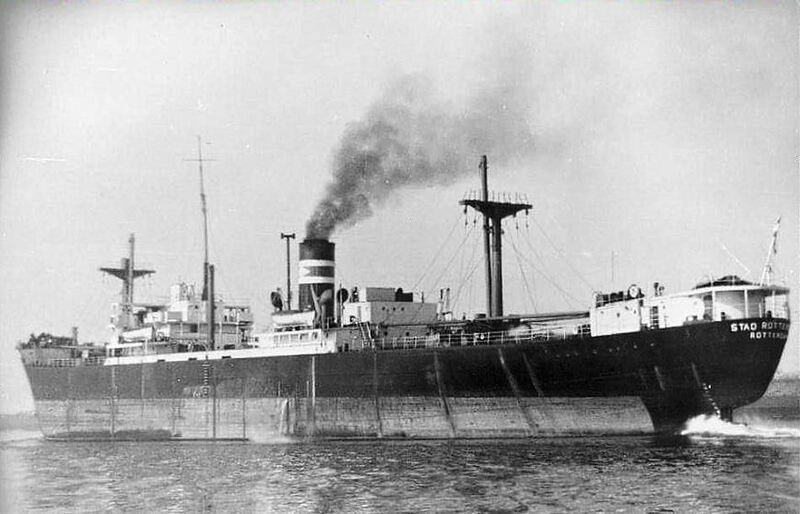 I read that on Sep. 23, 1949, the vessel put into Dakar, Senegal, with a serious fire in her coal bunkers, while en route from Beira, Mozambique, to Avonmouth. 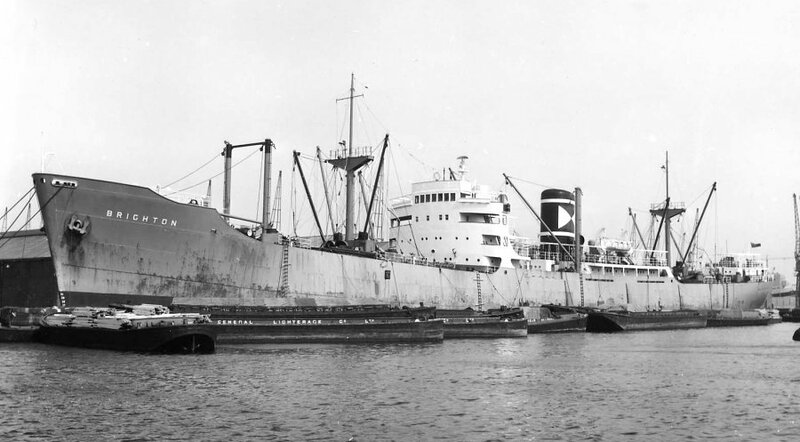 The vessel was sold to British Iron and Steel Corporation to be scrapped & on Aug. 21, 1959, the vessel arrived at the Grays, Essex, ship breaking facilities of T. W. Ward Ltd., to be broken up. Is it possible that you have anything to add? An image perhaps? A cargo ship. Per 1 ('convoyweb.org', WW2 convoy duty, click on 'SHIP SEARCH' then insert Empire Southey), 2 [Bank Line, Hollybank (1)], 3 (Halcyon-Lijn, 5 images, Stad Rotterdam), 4 (Rio Atuel case), 5 (Miramar, link, you now must be registered to access). 431 ft. long, 136.07 metres, speed of 9 1/2 (or 10 1/2) knots. Built for Ministry of War Transport. Initially managed by W. Runciman & Co., but in 1944, Andrew Weir & Co. Ltd. took over that role. 61 WW2 convoy references including at least 6 N. Atlantic crossings, extensive service in the Mediterranean (Alexandria, Port Said, Augusta, Bari), Caribbean, also Capetown, S. Africa & French coast. Am not permitted to access the ship's 'convoyweb.org' independent voyages. On Mar. 13, 1944, the vessel damaged Empire Addison at Naples, Italy. Have not read any detail. Collisions with ice on one N. Atlantic crossing to Halifax. 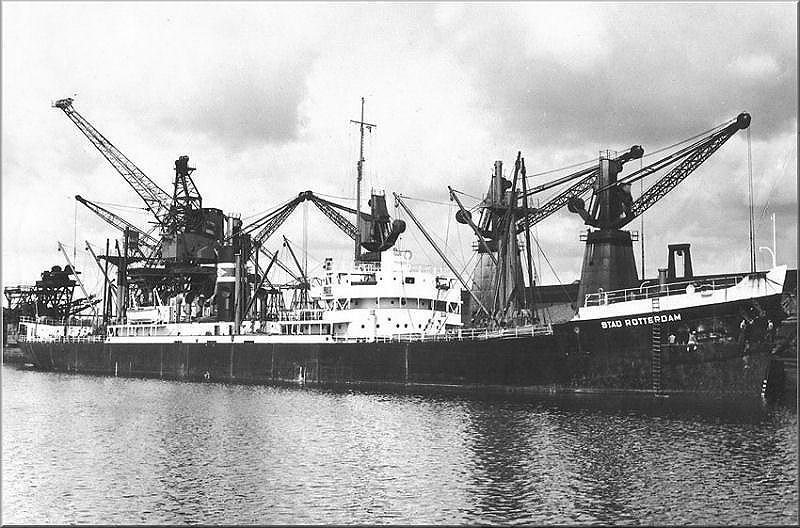 In 1946, the vessel was sold to Bank Line Limited, managed by Andrew Weir & Co. Ltd., & renamed Hollybank. 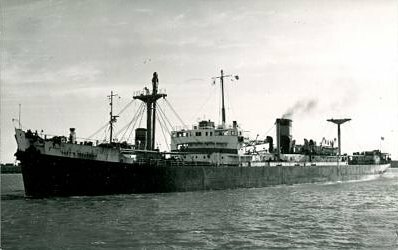 On Oct. 31, 1947, Hollybank ran aground to avoid a collision with Rio Atuel, an Argentine steamship. In Hog Island Channel of Cape Cod Canal. Rio Atuel, which suddenly veered into the course of Hollybank as a result of a language misunderstanding of her pilot's instruction, was held to be at fault. Sold in 1953, for �250,000, to 'Halcyon-Lijn N.V.' of Rotterdam, the Netherlands, & renamed Stad Rotterdam. 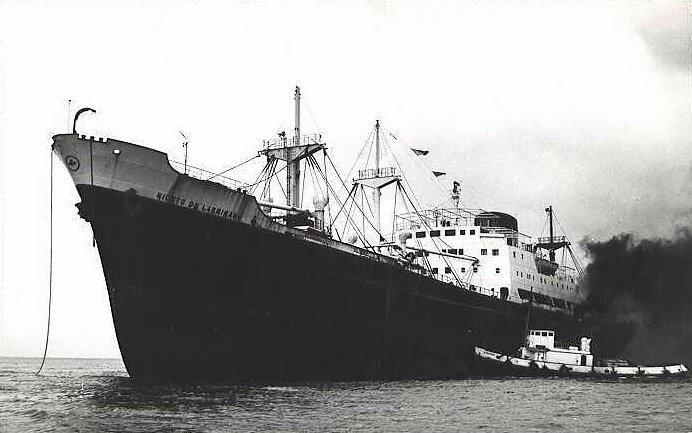 Was sold again, in 1963 to Ocean Shipping & Enterprises (Panama) S.A., of Panama, 'Great East Asia Shipping & Trading Corporation', of Hong Kong, the managers, & renamed Ocean Unity. Liberian flag. On Mar. 8, 1967, the vessel arrived at Kaohsiung, Taiwan, to be broken up. Is it possible that you have anything to add? An image as Empire Southey, perhaps? A cargo ship, which had a very short life. Per 1 ('uboat.net', sinking), 2 ('convoyweb.org', WW2 convoy duty, click on 'SHIP SEARCH' then insert Empire Webster), 3 (data, with image of Otto Hartmann), 4 (Hartmann), 5 (U-77), 6 (Lloyd's List, 1943/44), 7 (Miramar, link, you now must be registered to access). Likely 131.7 metres long overall, & 125.0 metres perpendicular to perpendicular, (431 ft.), speed of 10 knots. Built for Ministry of War Transport & managed by Hall Brothers, of Newcastle. Just 5 WW2 convoy references, including U.K. coastal & a Nov. 1942 voyage from the Clyde to B�ne, N. Africa, returning from Philipeville, Algeria. 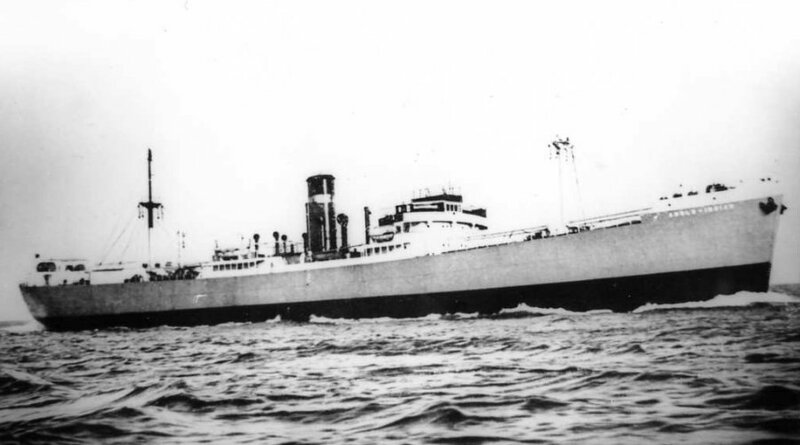 On Jan. 21, 1943, the vessel, under the command of Alexander R. (Roderick) Duncan, with a total of 63 aboard including 8 military passengers & 1 gunner, (have also read 61 total only), left Glasgow, River Clyde, for B�ne, Algeria, in convoy KMS-8 (a convoy of 60 merchant ships & 17 escorts). Carrying 3,000 tons of coal & military stores - have also read included trucks & tanks. 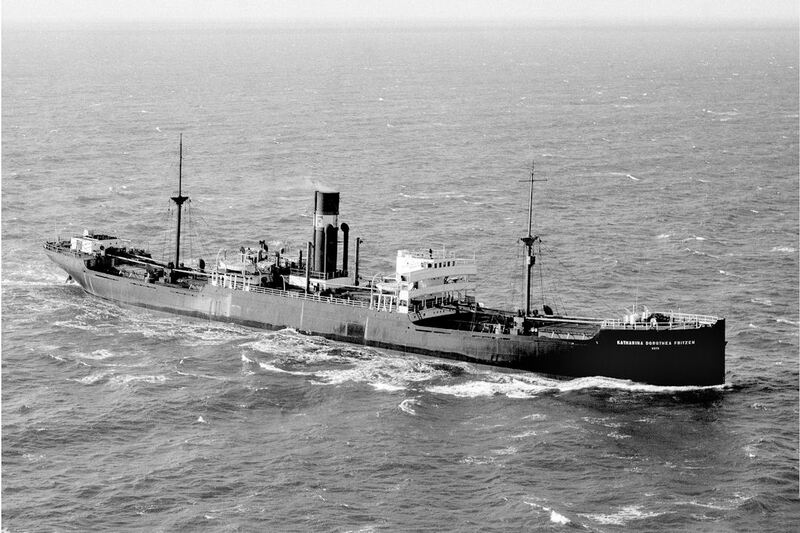 At 2:00 a.m. on Feb. 7, 1943, the convoy was attacked by air & by submarine. Empire Webster was hit by one of 4 torpedoes fired at the convoy by U-77, Kapit�nleutnant Otto Hartmann in command. At 36.47N/01.37E, near T�n�s, Algeria, W. of Algiers in the Mediterranean. U-77 broke off her attack when HMCS Camrose ('Camrose') (K154) detected her presence & vigorously counter attacked. As did an allied aircraft, it would appear. 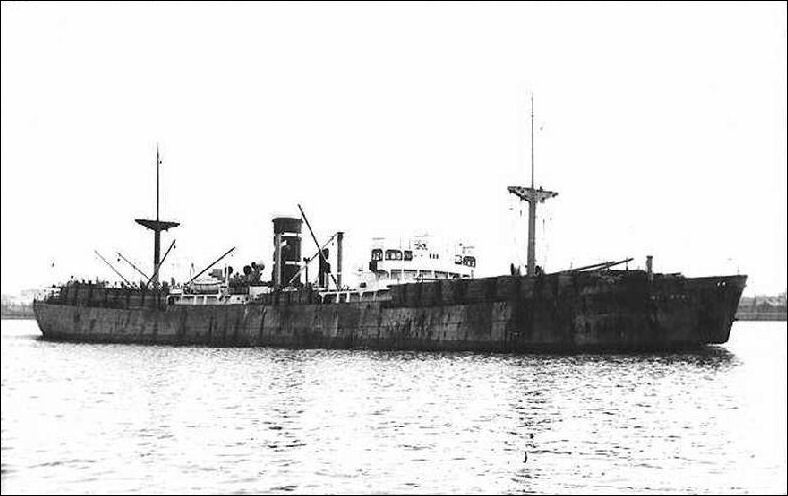 Empire Banner (built at Sunderland by Bartram) was hit by another of the 4 torpedoes. Empire Webster did not sink immediately. It would seem that the vessel may have been hit by 2 torpedoes - a second, also by U-77, a few hours after the first (per a Google 'snippet' reference, here, to 'U-boat Operations of the Second World War' by Kenneth G. Wynn. Indeed the volume seems to state 'Empire Webster was sunk by gunfire from an Allied naval vessel'.) Is that what, in fact, happened? Four Empire Webster lives were lost as a result of the attack, the gunner & three crew members. 59 Empire Webster survivors were picked up by Camrose & landed at Algiers. 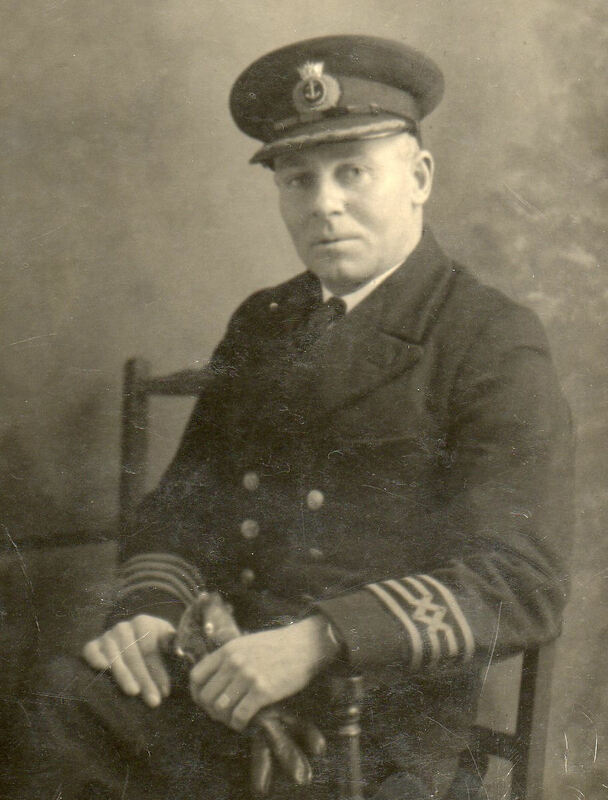 Harry R. (Richard) Phillips, an apprentice, was awarded the 'Lloyd's War Medal for Bravery at Sea' & also the 'British Empire Medal' for his rescue of two injured members of the crew, trapped in their quarters when the ship was hit. U-77 was later sunk, on Mar. 28, 1943, when attacked E. of Cartagena, Spain. Would welcome any corrections to the above, or additional data. An image? A cargo ship. Per 1 (data & images), 2 ('plimsollshipdata.org', Lloyd's Register listings, Empire Bardolph, 1942/43 thru 1945/46), 3 ('convoyweb.org', WW2 convoy duty, click on 'SHIP SEARCH' then insert Empire Bardolph), 4 (Miramar, link, you now must be registered to access). 431.0 ft. long (131.37 metres) perpendicular to perpendicular. 446.5 ft. long (136.09 metres) overall, signal letters BFDP. Built for Ministry of War Transport, & managed by 'Donaldson Bros & Black' & then by 'Lamport & Holt Line'. 26 WW2 convoy references, including at least 2 N. Atlantic crossings, to Freetown, W. Africa, many times, & U.K. coastal. 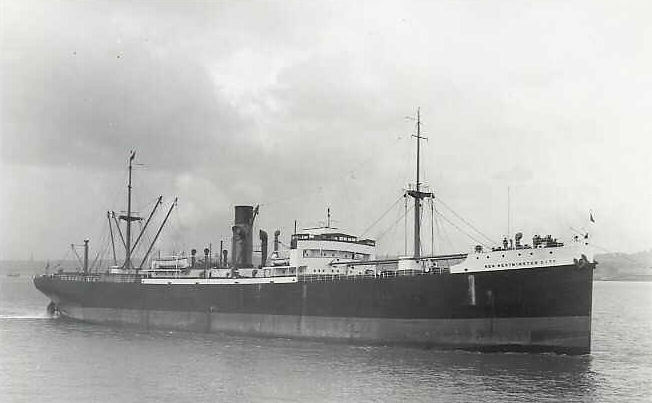 The vessel was sold, in 1945, to Lamport & Holt Line Ltd., of Liverpool, & renamed, in 1946, Memling (the 3rd fleet vessel of that name). 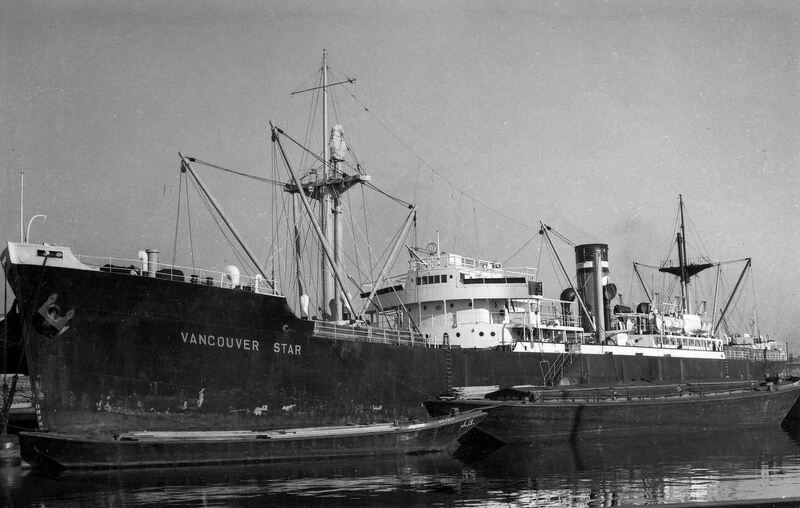 The vessel was sold again, in 1953, to Blue Star Line Ltd., & renamed Vancouver Star. Transferred, in 1957, to Lamport & Holt Line Ltd., of London, & again named Memling. The vessel was sold for �44,000, in Sep. 1959, to 'N.V. Simon's Metaalhandel'. It arrived at Rotterdam, on Oct. 19, 1959, to be scrapped, Scrapping commenced on Oct. 23, 1959 at the ship-breaking facilities there of N.V. Simon's Metaalhandel. Anything to add? A refrigerated cargo ship. Per 1 (Wikipedia, Yelkenci), 2 [Cunard, Valacia (2)], 3 [Bristol City Line, New York City (4)], 4 ('plimsollshipdata.org', Lloyd's Register listings, Empire Camp), 5 ('convoyweb.org', WW2 convoy duty, click on 'SHIP SEARCH' then insert Empire Camp), 6 (Bristol City Line), 7 (Miramar, link, you now must be registered to access). 136.1 metres long overall, 129.5 metres perpendicular to perpendicular, 431 ft., speed of 10 1/2 or 11 knots, signal letters BFKR. Built as Empire Camp for The Ministry of War Transport, managed by 'Blue Star Line Ltd.', of London. 31 WW2 convoy references including at least 6 (& maybe 7) N. Atlantic crossings, service to Freetown, W. Africa, & U.K. coastal. In 1946, the vessel was sold to 'Cunard White Star Line Co. Ltd.', & renamed Valacia. The second vessel of the name in the Cunard fleet. In 1949, the vessel was transferred to Cunard Steamship Co. Ltd. with no change of vessel name. 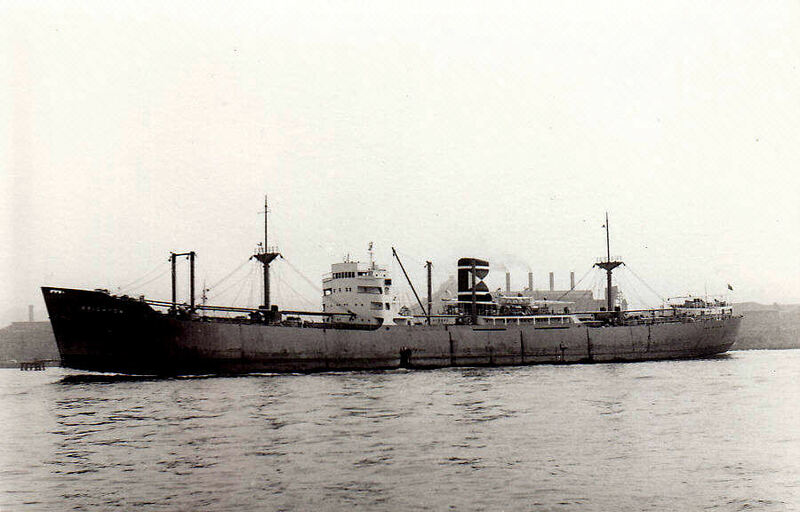 In 1951, the vessel was sold to 'Bristol City Line of Steamships Limited' i.e. 'Bristol City Line', of Bristol, 'Charles Hill & Sons' the managers, & renamed New York City. 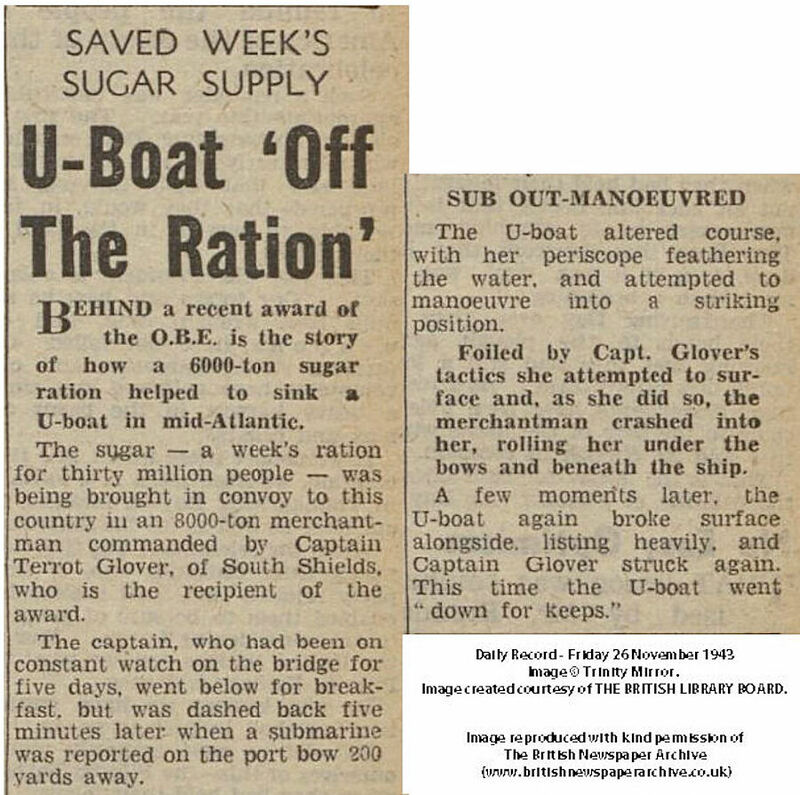 In 1955, the vessel was sold to 'Glasgow United Shipping Company Limited' ('United'), 'Maclay & McIntyre Ltd.' ('Maclay'), of Glasgow, the managers, & renamed Loch Morar. Miramar indicate that 'SS Induna Co. Ltd.' ('Induna') became the owners in 1955 & not United, Induna being however, I read, a company managed by Maclay. 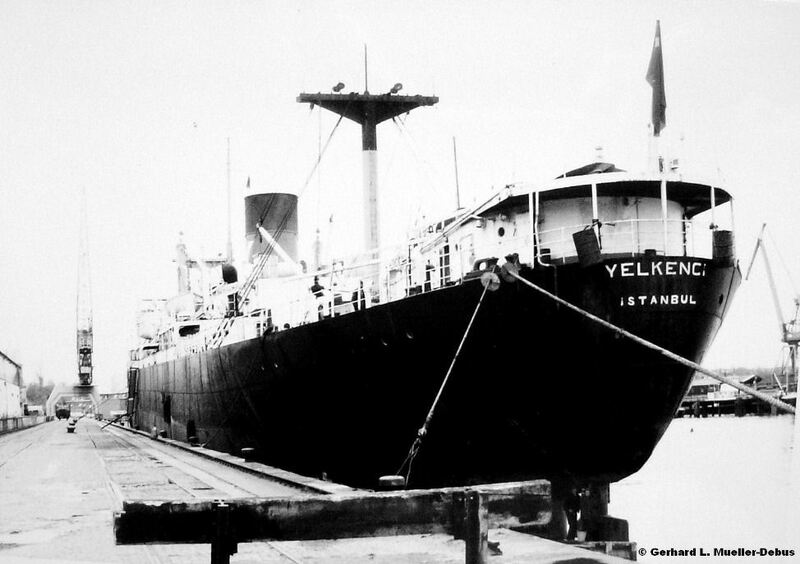 In 1959, 'Steamship Induna Co. Ltd.', sold the vessel for �80,000 to 'Lufti Yelkenci Evlatlari Donatma Istiraki', of Istanbul, Turkey, Lufti Yelkenci the manager, & renamed Yelkenci. Became Turkish flag, U.K. flag all prior periods. There was labour unrest re the unloading of bulk cotton seed at Hull, in Feb. 1959. On Feb. 20, 1971, the vessel arrived at the Halic, Istanbul ship breaking facilities of 'Imdat Gundogdu ve Zaven Eseyan' to be broken up. Can you add anything? Another image perhaps? A cargo ship. Per 1 [Union-Castle Line, Braemar Castle (2)], 2 ('convoyweb.org', WW2 convoy duty, click on 'SHIP SEARCH' then insert Empire Duchess), 3 (Ghent), 4 [Union-Castle, Braemar Castle (2), 50% down], 5 [King Line, King James (2)], 6 (Navarro, November 4), 8 (Miramar, link, you now must be registered to access). 466 ft. 6 in. (or 431 ft.) long, speed of 12 knots. Built as Empire Duchess for the Ministry of War Transport, managed by 'Hugh Hogarth & Sons', of Glasgow. 33 WW2 convoy references, (seems to be a small number), including at least 1 voyage across the N. Atlantic, (ONS.27 & UGS.37) service to West Africa (Freetown, Takoradi) & Mediterranean (Port Said) & local. Independent as far E. as Rangoon. 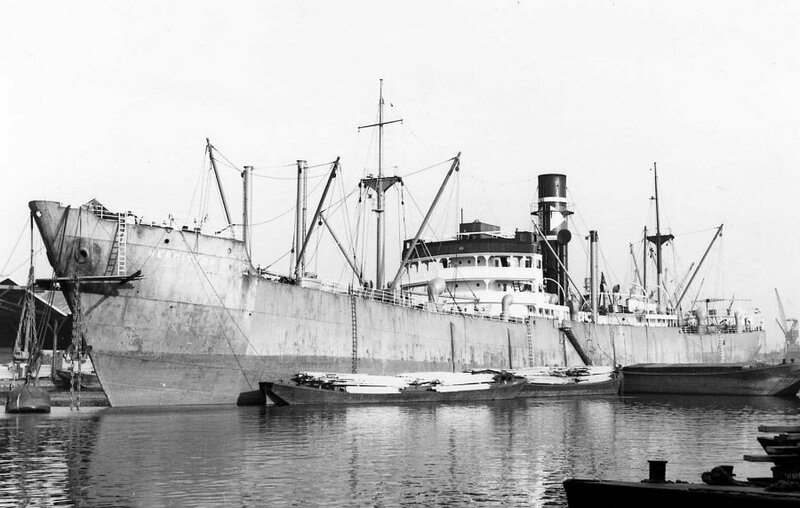 In Feb. 1944, the vessel went aground & suffered collision damage near Boston, Cape Cod Canal maybe. On Dec. 21, 1944, a collision with, I think, Chemong. Off the coast of Norfolk, at 52.59.15N/01.49.30E. 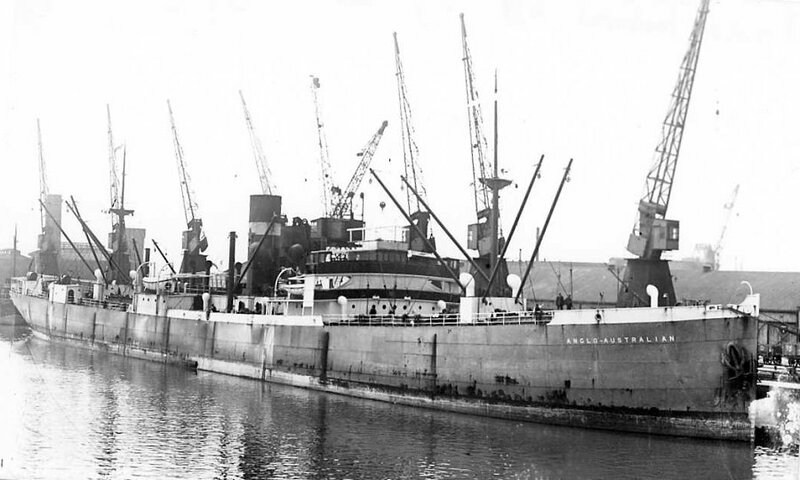 Empire Duchess was repaired at Grimsby. An explosion & fire in No. 2 hold at Ghent, Belgium, on Feb. 18, 1945. 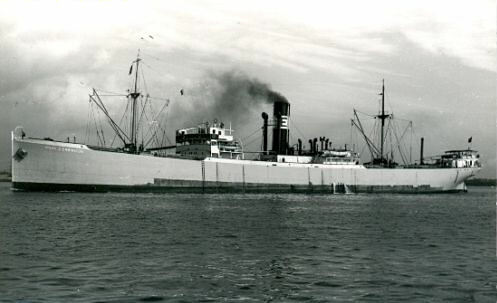 On Aug. 7, 1946, the vessel became managed by Union-Castle Mail Steamship Company Limited ('Union-Castle'). 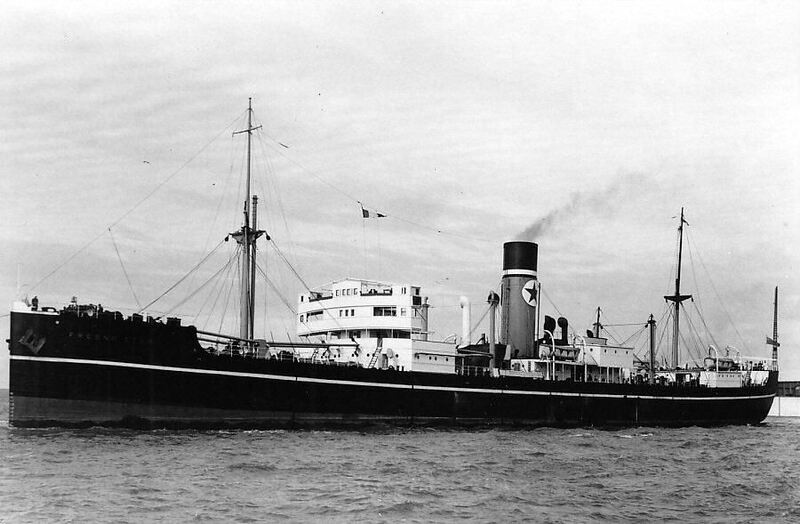 In 1949, Union-Castle became the owner, & the ship was renamed Braemar Castle. 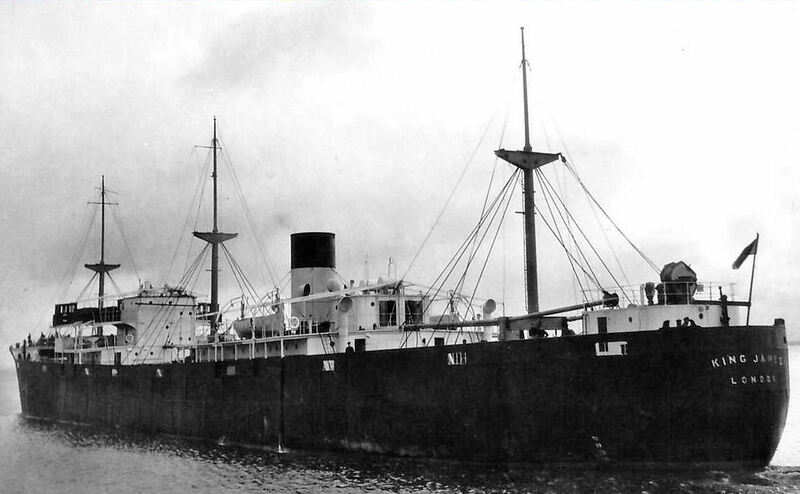 In 1950, the vessel was transferred to King Line Ltd., then Union-Castle owned, & renamed King James. John Nicholson, who served aboard the ship from Jun. to Dec. 1955, has an ongoing interest in the ship. He indicates that when they were in the Red Sea, the ship had to heave to for the replacement of a main bearing. And that in heavy weather in the N. Atlantic the ship suffered 'serious fuel oil pollution and lost way this combined with Radio/RDF failure'. In 1958, the vessel was sold to 'Cambray Prince Steamship Co.', of Hong Kong, (John Manners & Co., the managers) & renamed Tyne Breeze. 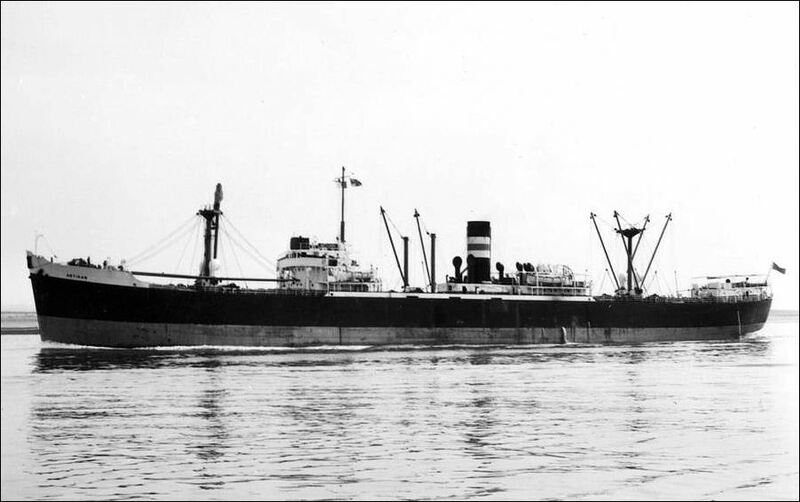 And in 1963, she was sold to Cathay Trader Steam Ship Co., of Hong Kong, & renamed Cathay Trader. In 1964, the vessel was sold again, to 'Pacific Pearl Navigation Co.', also of Hong Kong, & renamed Pearl Light. And in 1966, was sold to 'Marikar Navigation & Agencies Ltd.', of Hong Kong, & renamed Habib Marikar. 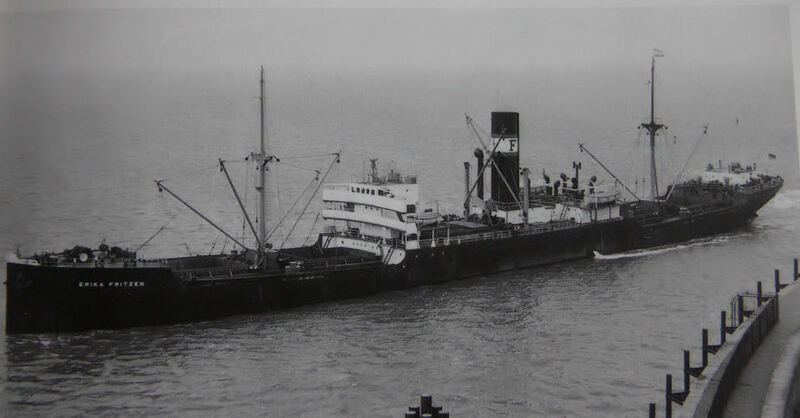 On Nov. 4, 1967, while en route from Hong Kong to Chittagong, Bangladesh with a cargo of cement, the vessel suffered an engine failure during Typhoon 'Emma', went ashore & was wrecked on a reef at Lincoln Island, 400 miles SSW of Hong Kong, in the Tonkin Gulf. A constructive total loss. At 16.30N/112.50E. 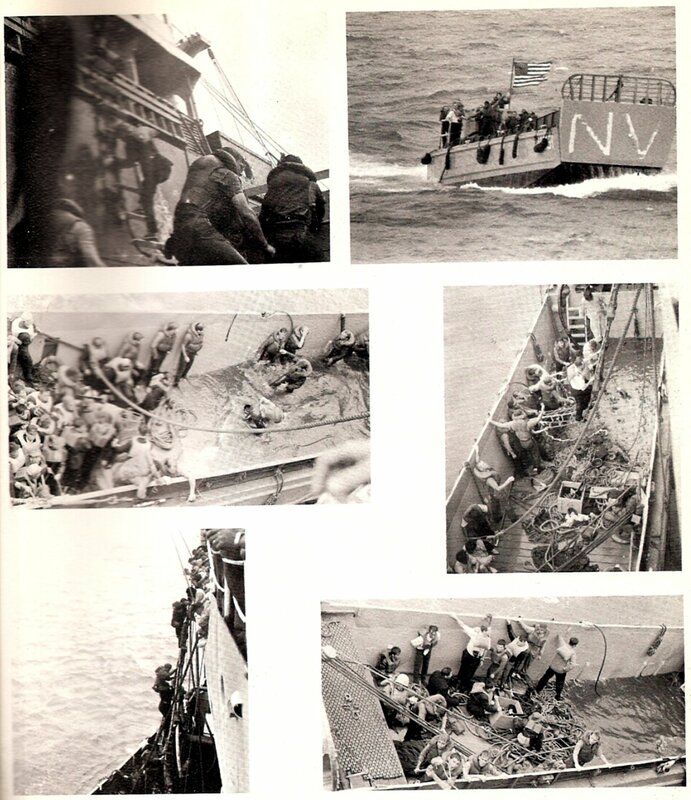 Two landing craft manned with volunteers from USS Navarro (APA-215) Captain Whitmore in command, rescued, with very great difficulty, 43 of the crew of Habib Marikar. Two crew members were in the water & Mick Ferl, Electronic Technician 3 & a Navy Rescue Swimmer, saved one of them & received a Commendation for his fine conduct. So one life was lost. 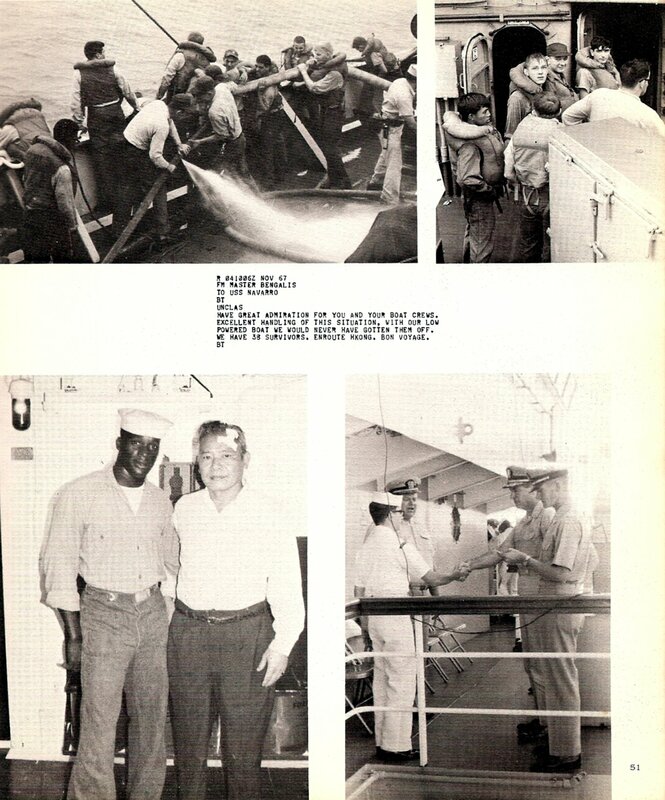 Vernon Jackson of the 'USS Navarro (APA-215) Association', via John Nicholson, has kindly provided images re the Navarro rescue in 1967 (last 3 images at left). 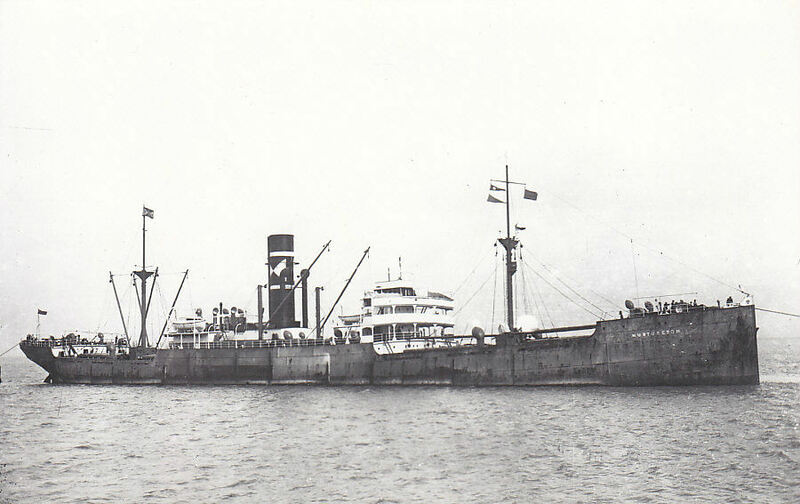 The bulk of the Habib Marikar crew, those that did not require the medical facilities aboard Navarro, were later transferred to Bengalis, a Dutch cargo ship, & landed at Hong Kong. John seeks such data as the name of the Habib Marikar master, its crew list & a manifest to help identify those in the images. Can you add anything? A cargo ship. Per 1 (image, Matelots Pillien et Peyrat), 2 [Compagnie de Navigation Mixte, (Matelots Pillien et Peyrat)], 3 ('convoyweb.org', WW2 convoy duty, click on 'SHIP SEARCH' then insert Empire Friendship), 4 ('pdf', French, meaning of French name), 5 (Miramar, link, you now must be registered to access). 431.0 ft. long perpendicular to perpendicular, 446 ft. 5 in. overall, speed of 12 knots, maybe, signal letters BFJB. Built as Empire Friendship for the Ministry of War Transport, managed by 'Sir Robert Ropner & Co. Ltd.' of West Hartlepool. 28 WW2 convoy references, including at least 2 voyages across N. Atlantic, service to E. & S. Africa [Cape Town, Durban, Kilindini (Kenya), Aden], in Mediterranean & U.K. coastal. In 1945, the vessel was sold to the French Government, managed by 'Compagnie de Navigation Mixte', & renamed Matelots Pillien et Peyrat. No WW2 convoy references, at 'convoyweb.org' under the new name. That new name, I read, relates to 2 young sailors (matelots) shot in Algeria in 1942 after failing in an attempt to escape from their ship, the 'Gabriel Guist'hau' while crossing the Straits of Gibraltar. 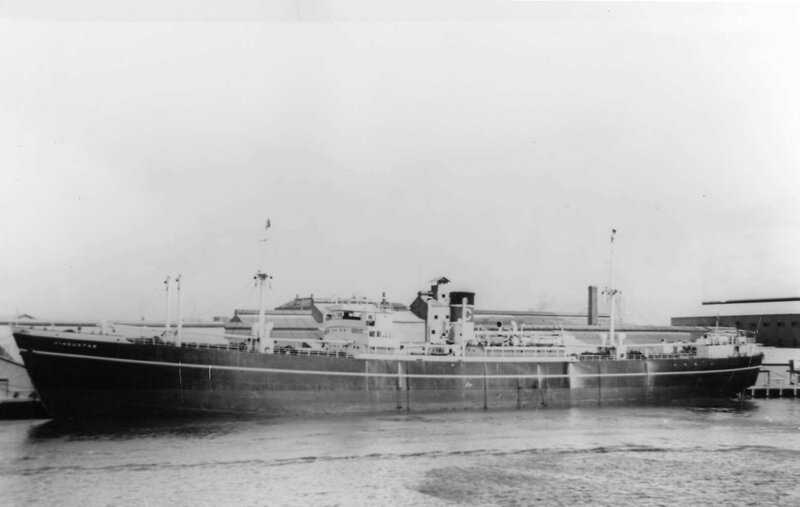 In 1948, the vessel was transferred to 'Compagnie Havraise de Navigation E. Corblet & Cie.', which company was restyled as 'Compagnie Havraise de Navigation � Vapeur', of Le Havre, & Paris perhaps? The vessel was laid up late in its life at Port-de-Bouc, Bouches-du-Rhone, near Marseilles, France. On Oct. 29, 1962, in high 'mistral' winds, she dragged her anchors, broke free from her moorings & was driven onto a breakwater at the entrance of the 'Canal de Marseille au Rh�ne'. The vessel was re-floated, on Nov. 3, 1962, but was declared a constructive total loss. And arrived at La Seyne-sur-Mer, Toulon, France, later in Nov. 1962, to be scrapped. Can you add to or correct the above? Particularly re the proper identification of the vessel's French owners & managers. An image perhaps? A refrigerated cargo ship. Per 1 [data 50% down, '8th November 2007', Inchmay (2)], 2 [Inch Steamship, Inchmay (2)], 3 ('Ron Mapplebeck' addl. 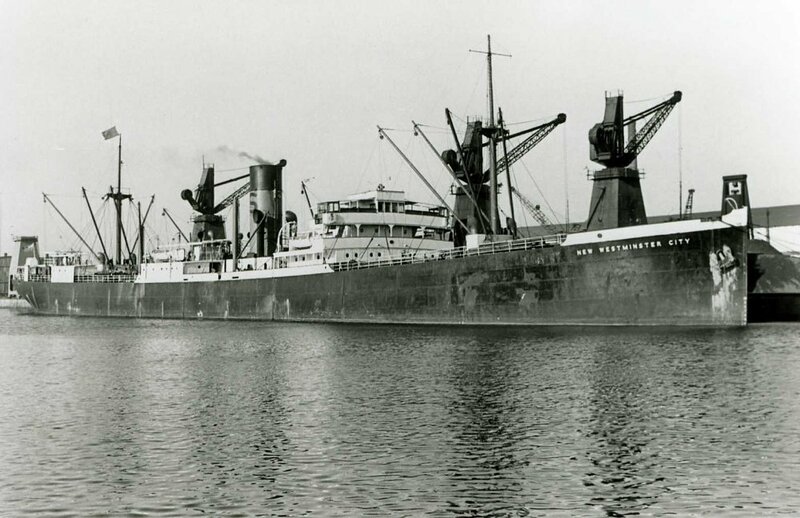 data), 4 [Blue Star Line, Corrientes (2)], 5 ('convoyweb.org', WW2 convoy duty, click on 'SHIP SEARCH' then insert Empire Cromer), 6 (Miramar, link, you now must be registered to access). 136.1 metres long overall, 129.5 metres perpendicular to perpendicular, 431 ft., speed of 10 or 10 1/2 knots. Built as Empire Cromer for the Ministry of War Transport, managed by 'Blue Star Line'. 15 WW2 convoy references thru Jun. 1945, incl. 3 N. Atlantic crossings, in fact 4 with an independent return voyage. Likely carried meat. Including service to Buenos Aires, Argentina. Additional independent crossings after Jun. 1945. On Mar. 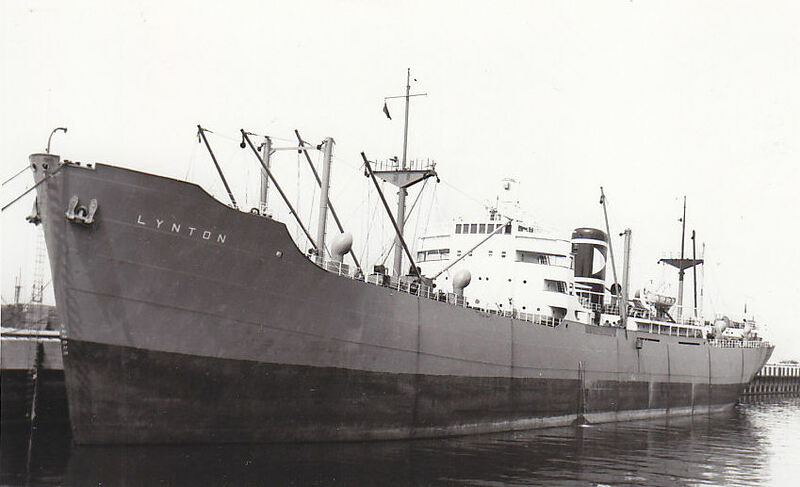 20, 1946, the vessel was sold to Donaldson Line Ltd., of Glasgow, & renamed Corrientes. In Mar. 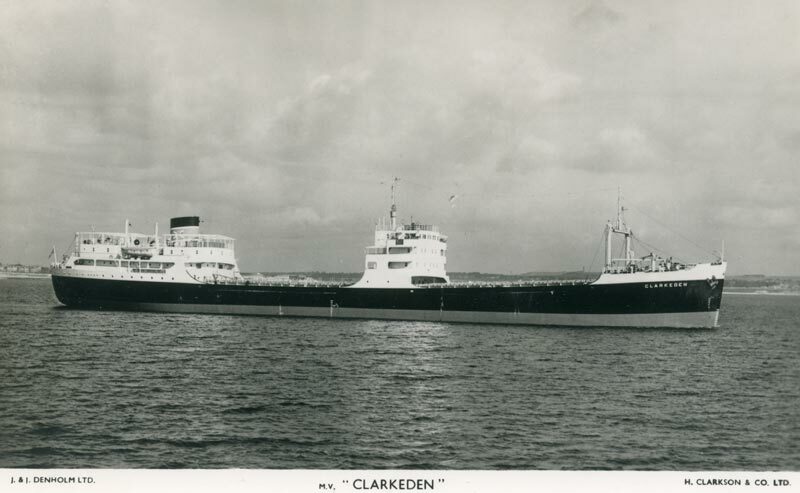 1954, it was sold again, to 'Blue Star Line' of London, with the intention of renaming her 'Oakland Star', however the vessel was surplus to Blue Star requirements & sold before the name could be changed. In Jan. 1955, the vessel was sold to Williamson & Co. ('Williamson') of Hong Kong (or maybe to 'Inch Steamship Company Ltd.', a subsidiary of Williamson), & renamed Inchmay. And in 1966, the vessel was sold to 'National Shipping Corp. of Pakistan' (or 'Pakistan National Shipping Co.'), & renamed Kaukhali. On Apl. 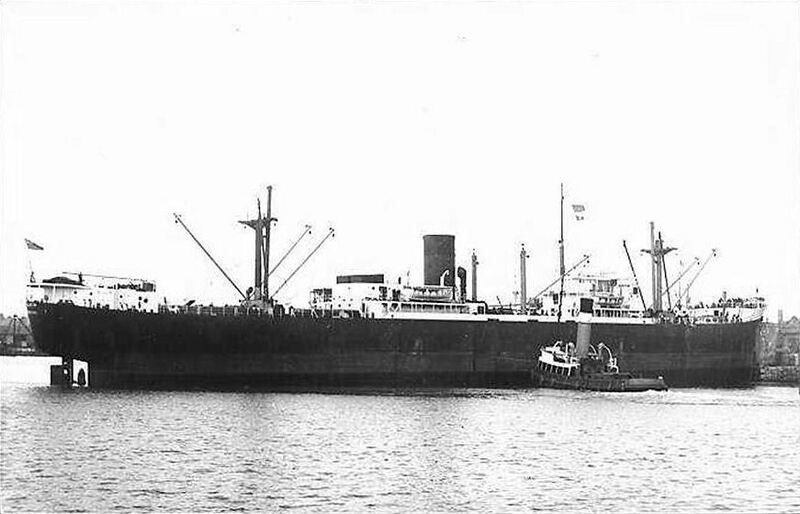 2, 1968, the vessel arrived at Karachi, Pakistan, to be a) laid up or b) broken up. The sale to ship-breakers was only, I read, effected in Oct. 1968 & break up only commenced in May 1969, at the ship breaking facilities of 'Eastern Steel Co.'. Can you add anything? An image perhaps? A cargo ship. Per 1 (data, Empire Pendennis), 2 (Miramar, link, you now must be registered to access). 136.1 metres long overall (446.5 ft.), 129.5 metres perpendicular to perpendicular (431.0 ft.), speed of 10 knots, signal letters MQJY. Built for the Ministry of War Transport, with Ellerman & Bucknall Steamship Co. Ltd. the managers. The vessel became Vasconia, when bought, in 1946, by Cunard White Star Line Ltd. It was sold, in 1951, to Blue Star Line Ltd. & renamed Fresno Star. 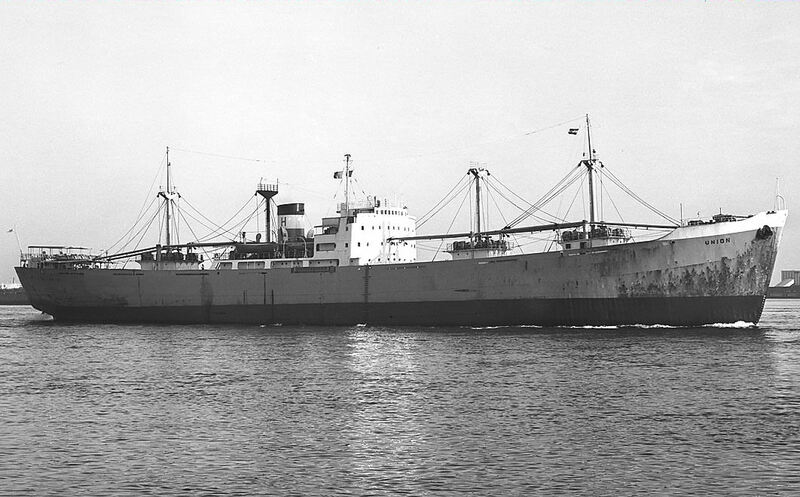 In 1957, the vessel was transferred to Lamport & Holt Line Ltd. & renamed Millais (the 3rd fleet vessel of that name). The vessel was sold for �102,500, in 1960, to Grosvenor Shipping Co. Ltd. of London, Mollers Ltd. of Hong Kong the managers, & renamed Grosvenor Navigator. The vessel was hit by Ocean Glory on Sep. 2, 1962, at Hong Kong, apparently during a typhoon. Ocean Glory (Sunderland built as Empire Trail) had broken free of her moorings in typhoon Wanda. 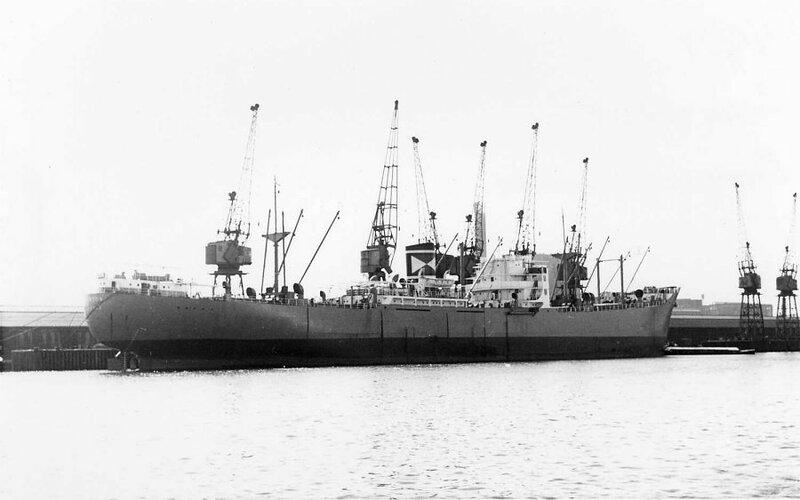 Grosvenor Navigator clearly survived the hit because 4 years later, on Sep. 9, 1966, the vessel arrived at the Kaohsiung, Taiwan, facilities of 'Sing Chien Yung Steel & Ironworks Co.', to be scrapped. Anything to add? A cargo ship. Per 1 ('convoyweb.org', WW2 convoy duty, click on 'SHIP SEARCH' then insert Empire Nairobi), 2 (image & data, Dover Hill, but you must be registered to access it), 3 (Miramar, link, you now must be registered to access). 136.7 metres long overall, 129.5 metres perpendicular to perpendicular, speed of 10 1/2 knots. 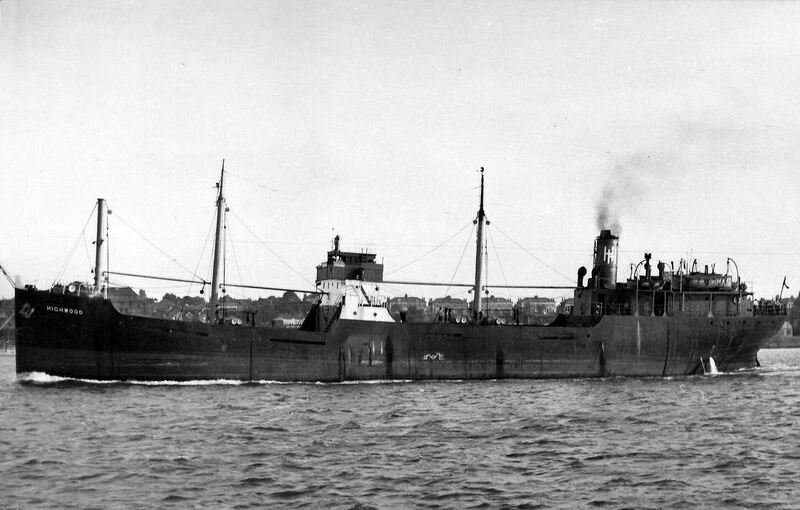 Built for Ministry of War Transport, managed by Lyle Shipping Co. Ltd., of Glasgow. Just 3 WW2 convoy references, two of which are re a N. Atlantic crossing westbound in Apl. 1945, returning in May 1945 (UGS.95). 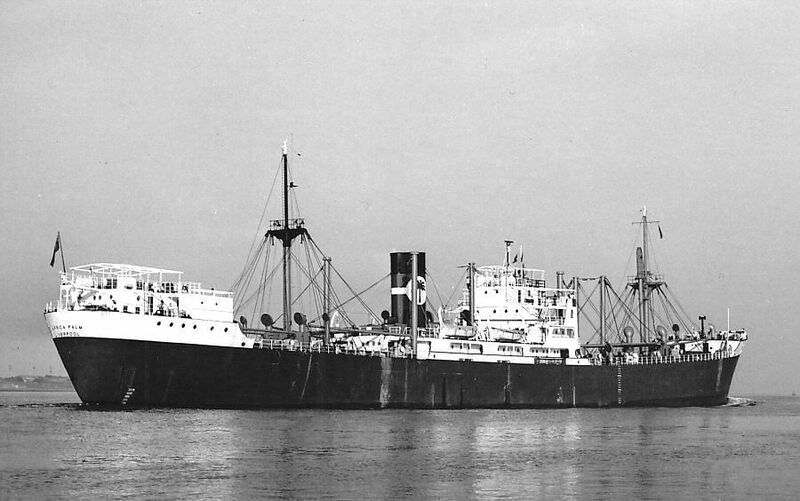 The vessel became Dover Hill, when bought, in 1946, by Dover Hill Steamship Co. Ltd., of Sunderland, managed & likely owned by 'Counties Ship Management Co. Ltd.', of London. The vessel was sold, in 1951, to 'Compagnia Naviera (or Navigazione?) 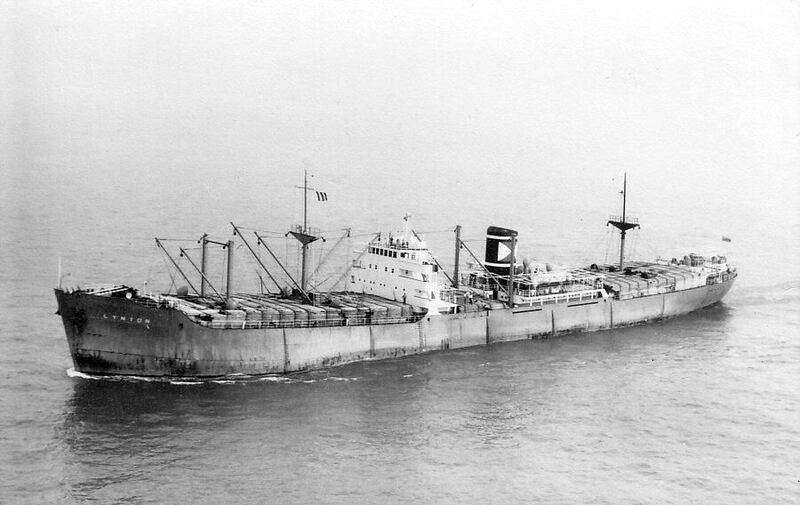 Castellana SA', of Panama City, Panama, & renamed Basil. 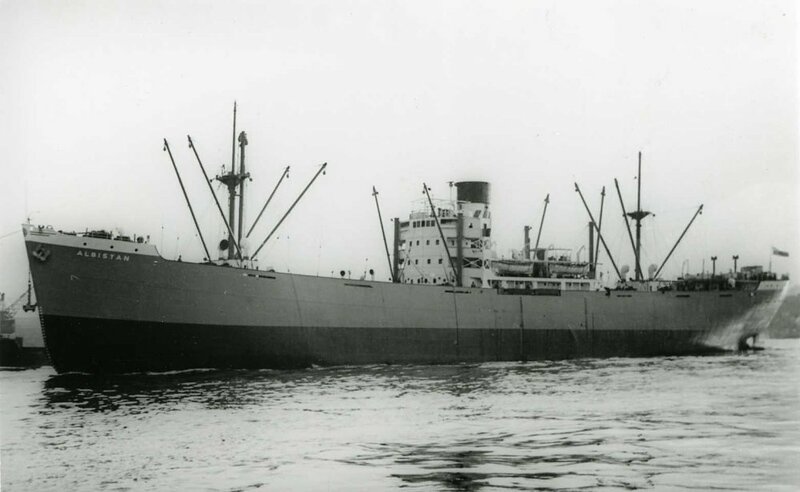 In 1954, the vessel was sold again, to British Steamship (or Steam Shipping) Co. Ltd., of Cardiff, John Cory & Sons Ltd., of Newport, the managers, & renamed Ravenshoe. 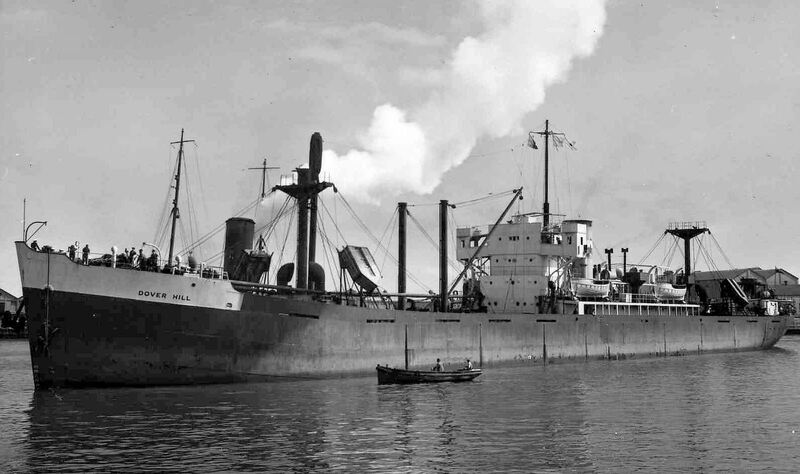 It would seem that the vessel was transferred, in 1957, to 'British Steam Shipping Co. Ltd. & Orders & Handford Steamship Co. Ltd.', also of Cardiff, with no change of vessel name. 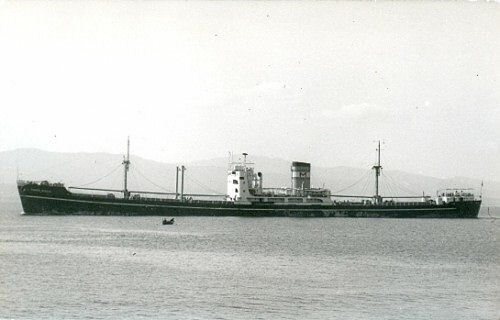 The vessel was sold, in 1960, to 'Plate Shipping Co. S.A.', of Piraeus, Greece, (or of Panama), managed by P. B. Pandelis Ltd., of London, & renamed Plate Shipper. The vessel was Greek registered. 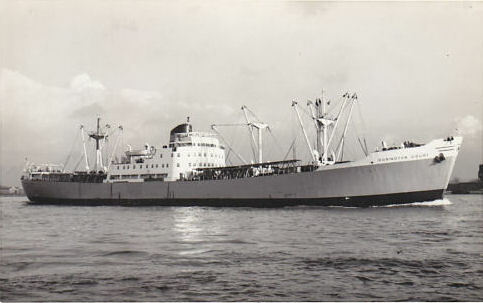 In 1961, the vessel was sold to 'Riza ve Aslan Sadikoglu ve Ortagi Adi Komandit Sirketi', of Istanbul, Turkey, & renamed Umran. The vessel was sold for the last time, in 1966, to 'Lutfi Yelkenci Evlatlari Donatma Istiraki', also of Istanbul, & renamed Tan 2. 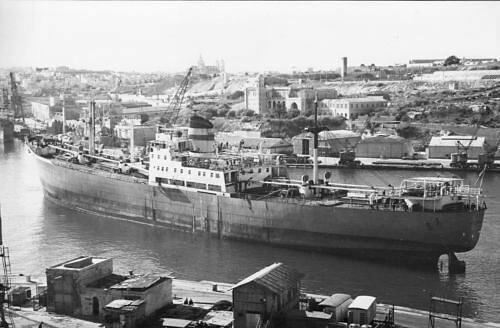 On Sep. 7, 1968, the vessel arrived at the Halic, Turkey, ship breaking facilities of 'Ali Tirali ve Onder KS', to be broken up. There are many references to the ship being of 7290 gross tons. I wonder why? 7295 tons seems to be correct. Anything to add? A refrigerated cargo ship. Per 1 (data & image, Portuguese page), 2 (image, Rio Gualeguay, ex link 3), 3 (Rio Gualeguay, data & image), 4 (Miramar, link, you now must be registered to access). 134.56 metres long, speed of 11 knots, crew of 42, accommodation for 5 passengers. Built for 'Flota Mercante del Estado', of Buenos Aires, Argentina, i.e. the Argentine Government. 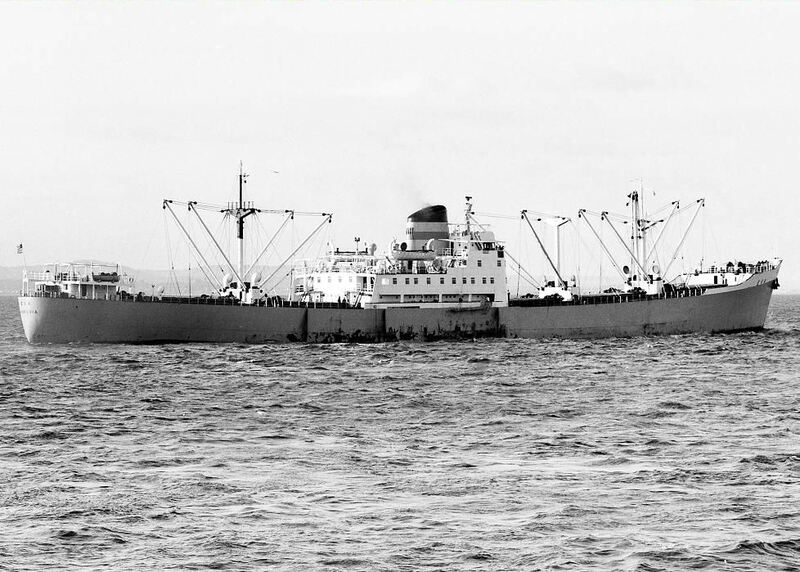 In 1961, the vessel was transferred to 'Empresa L�neas Mar�timas Argentinas S.A.', of Argentina. 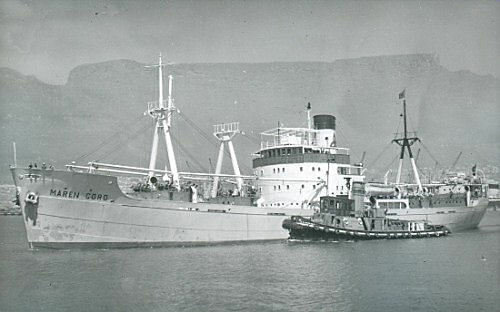 And in 1963 was sold again to 'Empros Shipping Co. Ltd.', of Piraeus, Greece, G. Dracopoulos (of Greece perhaps) the managers, & renamed Argolikos. And sold once more in 1969 to 'Providence SAL' of Beirut, Lebanon, N. Guida the manager, & renamed Francesca. The vessel was broken up at the Vado Ligure, Savona, Italy, ship breaking facilities of G. Riccardi, in 1.72 (which I think means Jan. 1972). Paolo Piccardo has kindly been in touch (thanks so much, Paolo!) to advise that the scrapping of Francesca is in fact documented, in a video which is available here. The 18 or so minute video, by Luigi Cassanello & entitled 'Lyberty Ships KJ1', shows Francesca & other vessels being broken up at the Vado Ligure facilities in 1972. Made available by 'Fondazione Ansaldo', it would seem. Anything to add? A cargo ship. Per 1 (Jardine Matheson, Taksang), 2 (Miramar, link, you now must be registered to access). 100.0 metres long (328 ft.) overall, 94.5 metres perpendicular to perpendicular, speed of 12 knots, but capable of 13/14 knots, capacity for 12 first class & 200 deck passengers, sister to Loksang. Built for 'Indo-China Steam Navigation Co. Ltd.', (a subsidiary of Jardine, Matheson & Co.), of Hong Kong & London. 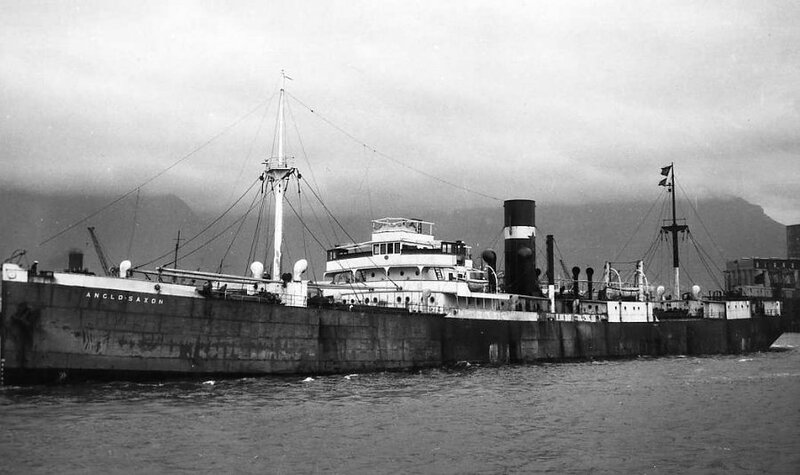 Taksang (& Loksang also), was known as a SEAC (South East Asia Command) coaster, & provided passenger & cargo service between Japan & India. The vessel was sold, in 1962, to Peninsular Shipping Co. Ltd., of Hong Kong, K. T. (or KT) Wong, of Hong Kong, the managers, & renamed Rochford. Have seen a reference to the vessel being sold, in 1972, to The People's Republic of China. I presume related to its being broken up. Since the vessel would seem to have arrived at Whampoa, (i.e. Huangpu, an outer port of Guangzhou, China), in Sep. 1971, to be broken up. There is very little data WWW available about this vessel. Anything you can add? A cargo ship. Per 1 (Miramar, link, you now must be registered to access). 130.5 metres long, perpendicular to perpendicular, speed of 11 knots. Built for 'D/S A/S Vard', of Oslo, Norway, 'Jacobsen and Salvesen', also of Oslo, the managers. 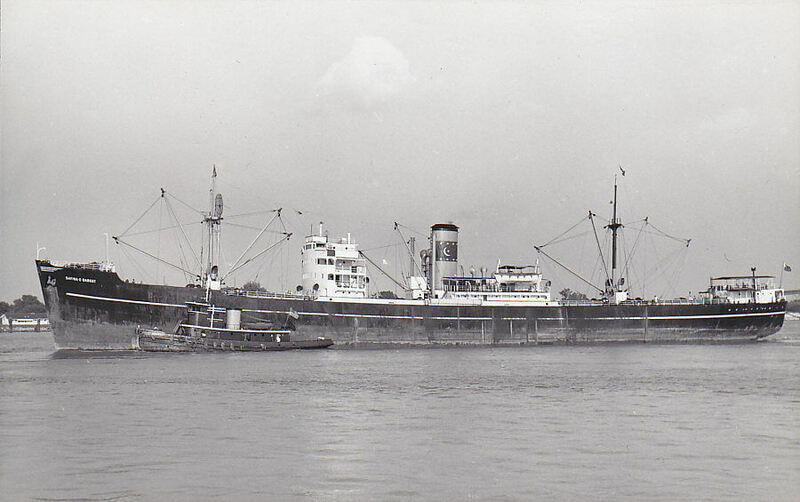 Sold in 1959 to Pan-Islamic Steamship Company Limited, of Karachi, Pakistan, & renamed Safina-e-Barkat. 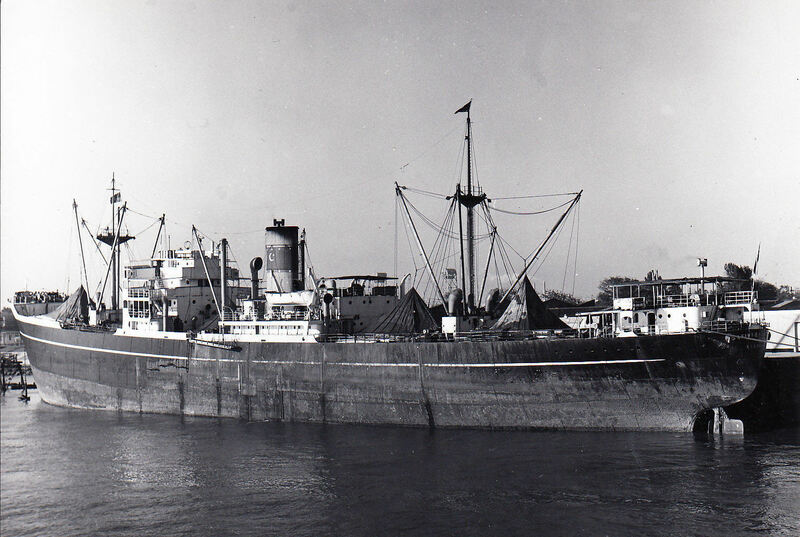 In 1960, while en route to Chittagong, Bangladesh, from Karachi, the vessel was driven ashore during a cyclone 6 miles from the river mouth at Chittagong. The ship's cargo was unloaded & the ship was then able to be re-floated. The vessel was broken up, in Apl. 1972, at the Gadani Beach, Pakistan, facilities of Hardware (likely correctly Hardwar) Shipbreaking Corp. Anything to add? A refrigerated cargo ship. Per 1 (data & image, Portuguese page), 2 (Miramar, link, you now must be registered to access). 134.65 metres long, crew of 42, accommodation for 5 passengers, speed of 11 knots. Built for the Argentine Government. 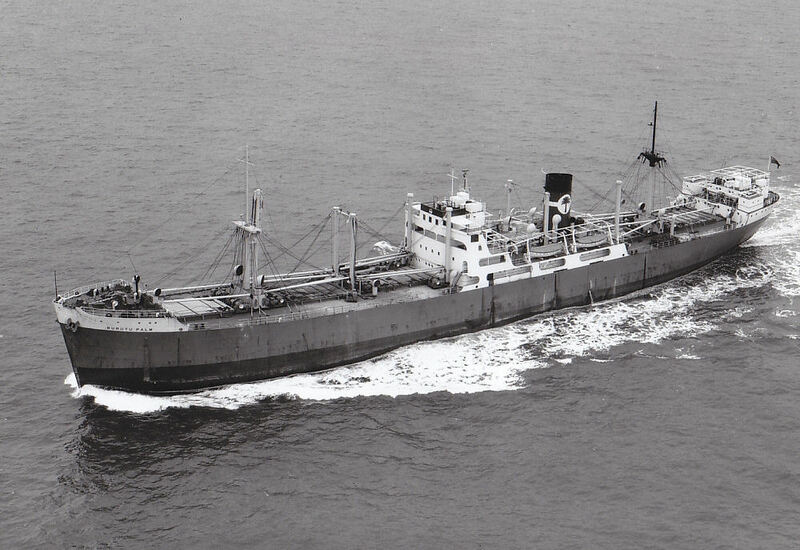 Sold in 1964 to Lemuria Shipping Corp., renamed South America & registered at Liberia. On Feb. 11, 1966, the vessel caught fire in the North Sea. About 1/2 way between Harwich & The Hague. At 52.02N/2.20E. Vessel was beached at Maasvlakte, nr. Rotterdam, The Netherlands. Anything to add? A cargo ship. Per 1 (data & image), 2 (Miramar, link, you now must be registered to access). The 1st page advises us (over half way down) that Albistan was originally ordered by Australasian United Steam Navigation Co. Ltd. of Melbourne, Australia, but was taken over by Strick Line Ltd. with F. C. Strick & Co. the managers, just before the keel was laid. 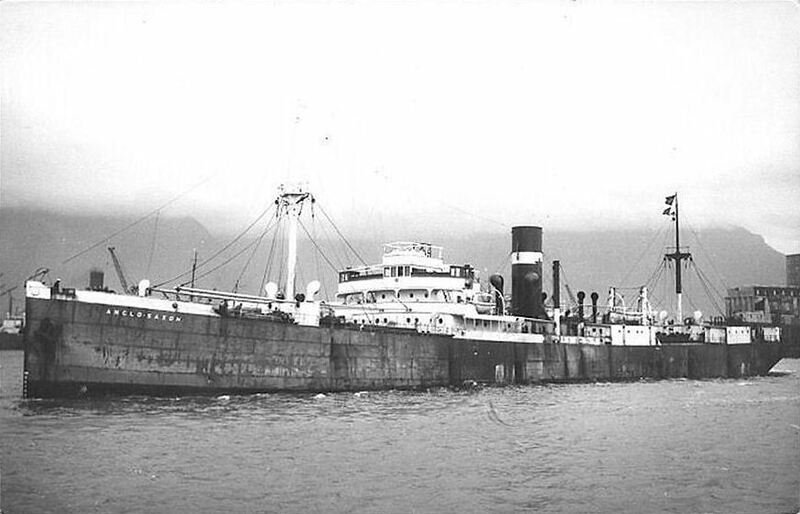 She was a Strick's ship for 23 years until sold for scrap in 1971 to Lee Sing Co. of Hong Kong. Can you add anything? 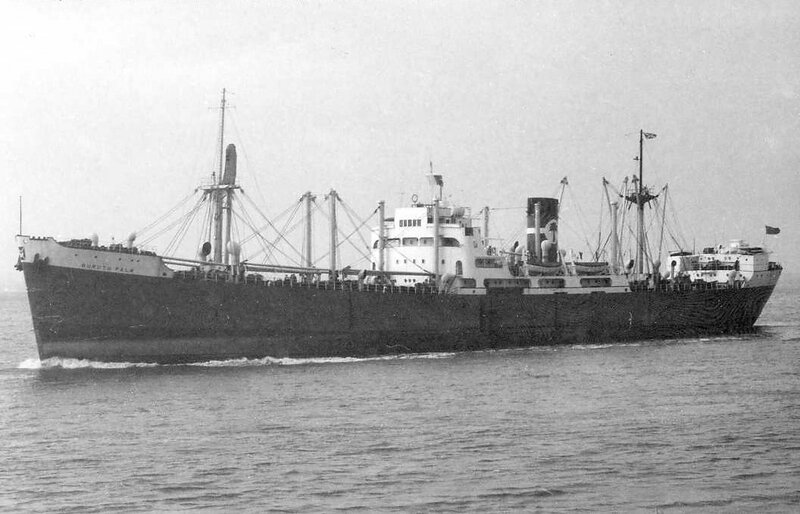 A cargo ship which carried passengers. Per 1 (data, Australasian United, Coramba), 2 (data 75% down, Coramba, image), 3 [McIlwraith McEacharn, Koomilya (2)], 4 (Miramar, link, you now must be registered to access). 116.2 metres long overall, 109.8 metres long perpendicular to perpendicular, 381 ft. 4 in. long, speed of 12 knots. Built for 'Australasian United Steam Navigation Co. Ltd.' of London & Sydney, Australia, Macdonald Hamilton & Co. the managers. Bought for the Australian coastal trade. She was an 'Australasian' ship for 13 years until they ceased to own ships. 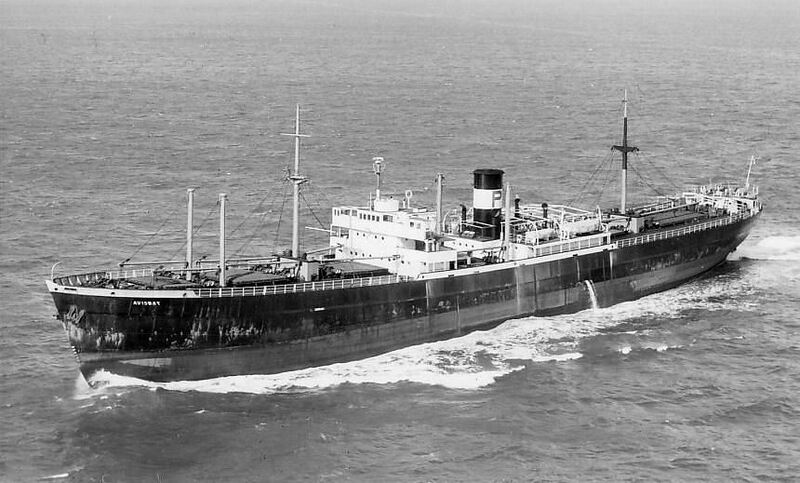 The vessel was sold in Feb. 1961 to 'McIlwraith McEacharn & Co.', of Melbourne, Australia, & later that year renamed Koomilya. 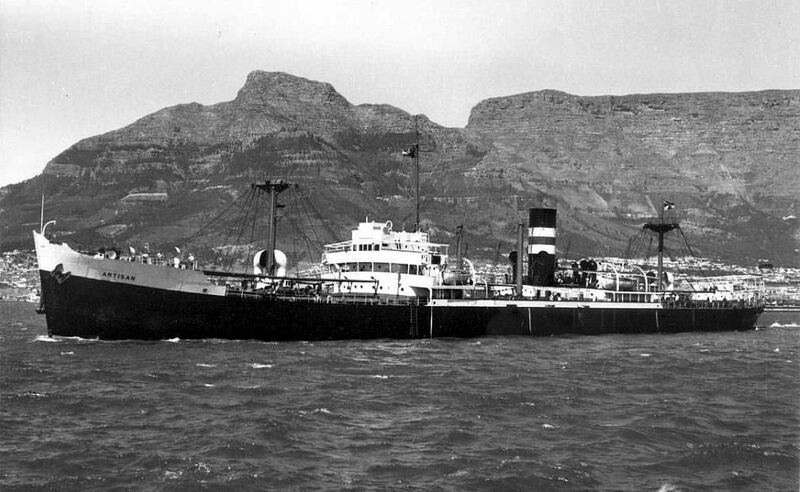 In 1963, the vessel was sold to 'Associated Steamships Pty. Ltd., of Melbourne, with no change of vessel name. 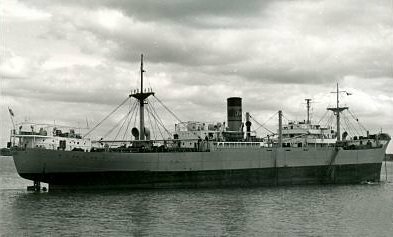 The vessel was sold again, in Nov. 1966, to San Francisco Steamship Co., of Hong Kong, John Manners & Co. the managers, & renamed San Fernando. 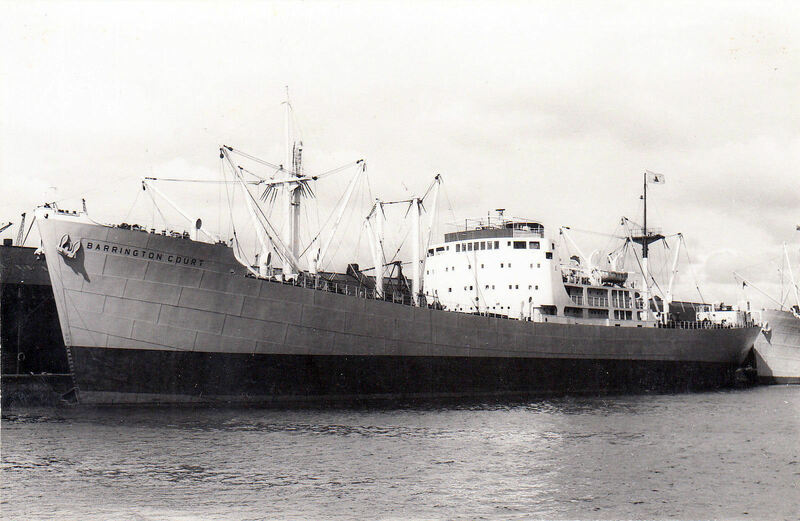 And sold again in 1970 to Haisen Navigation Ltd., of Panama, & renamed High Star. The vessel was sold for the last time in 1974, to 'An Lee Navigation Co. S.A.', also of Panama, (but have also read Shanghai, China), & renamed An Kuo. The vessel arrived at the Kaohsiung, Taiwan, ship breaking facilities of 'Lung Fa Steel Corp.' on Mar. 10, 1976 to be broken up. Can you add anything? A cargo ship. Per 1 (Danish page, crew experiences Stina Dan, image), 2 (link 1 translated), 3 (image, Stina Dan), 4 (Miramar, link, you now must be registered to access). 100.7 metres long overall, 94.6 metres long perpendicular to perpendicular, 310.0 ft., speed of 12 or 12 1/2 knots, signal letters OUJM, equipped for 4 passengers. Built for 'Rederiet Ocean A/S', of Esbjerg, Denmark, J. Lauritzen ('Lauritzen'), of Copenhagen, Denmark, the managing owners. The first link refers to some of the vessel's early service - carrying newsprint from Finland to Gravesend or Rochester, U.K., salt from Spain to Iceland, sand from Casablanca to Denmark, service in the Baltic & to France. 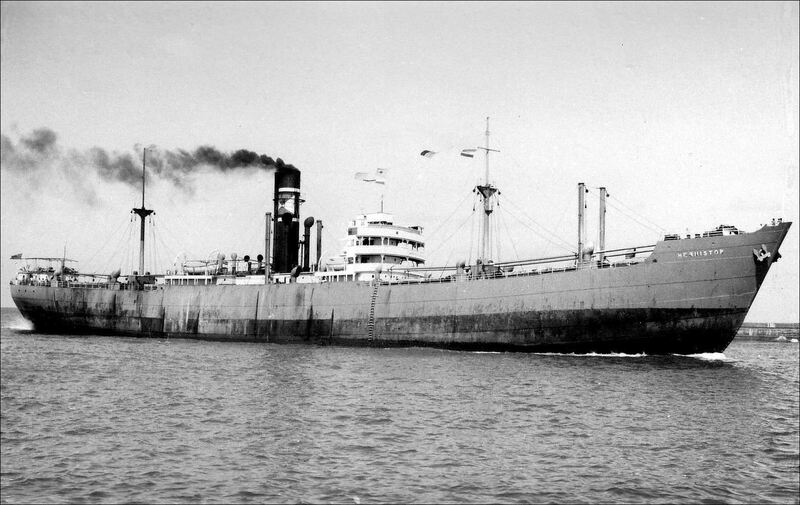 The vessel was sold, in 1957, to 'Concord Line A/S', of Copenhagen, Denmark, & renamed Mildred Cord. I wonder who Mildred Cord was? Can you tell us? John Knudsen has kindly been in touch - it would seem that 'Cord' relates to 'Concord Line A/S' & 'Mildred' to the wife of the owner. John advises 'The owner of Concord Line i.e. Joergen Ditlev Lauritzen (son of Knud Lauritzen owner of J. Lauritzen of Copenhagen) was married to Miss Sylvia Mildred Cornwell who was British but living in Chile where they met.' Thank you John! 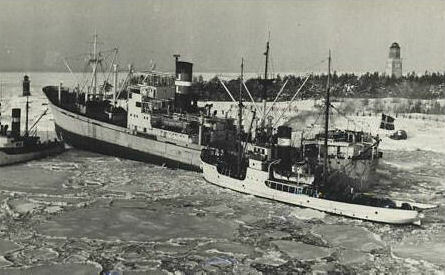 On Feb. 21, 1957, while en route from Rauma to Kotka, both Finland, with a general cargo, the vessel ran aground on the S. coast of Finland in ice conditions. It would appear that it, in fact, ran aground quite close to a lighthouse. The vessel was freed & repaired at Helsinki, Finland. The vessel was sold again, in 1964, to 'Etela-Suomen Laiva Oy', of Helsinki, & renamed Hakaniemi. And sold again, in 1966, to 'Koumtekal Cia Naviera SA', of Piraeus, Greece, & renamed Lion of Delos. On Jul. 25, 1974, the vessel arrived at the Split, Yugoslavia, ship breaking facilities of 'Brodospas', to be broken up. Can you add anything? A cargo ship. Per 1 (Miramar, link, you now must be registered to access). 100.7 metres long overall, 94.7 metres perpendicular to perpendicular, speed of 12 1/2 knots. Built for 'Rederi A/B Bifrost', of Gothenburg, Sweden, J. R. Trapp likely the manager. The vessel was sold in 1950 to 'Rederiet Ocean A/S', of Copenhagen, Denmark, 'J. Lauritzen' likely the manager & renamed Vilma Dan. 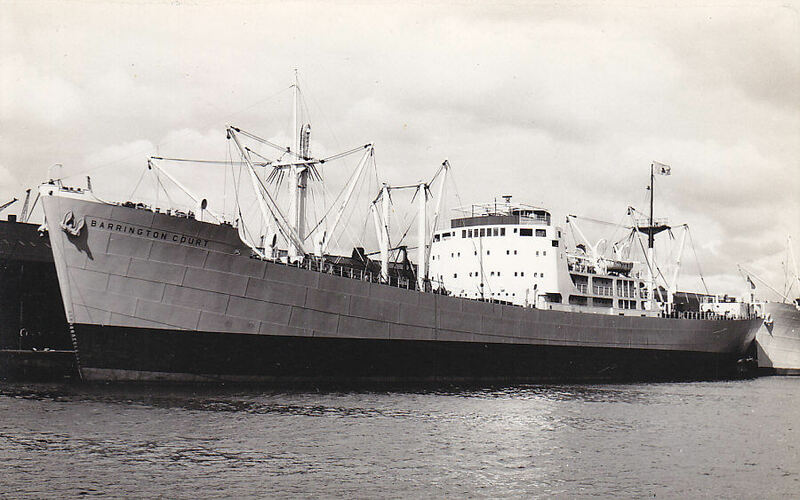 And sold in 1957 to 'Concord Line A/S', also of Copenhagen, J. D. Lauritzen likely the manager, & renamed Maren Cord. 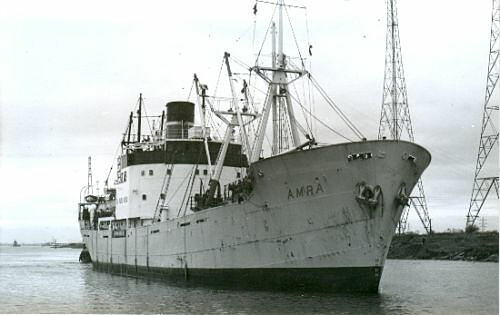 The vessel was sold again, in 1963, to 'Rederi Ab Asta', of Mariehamn, Finland, Lennart Karlsson likely the manager, & renamed Amra. 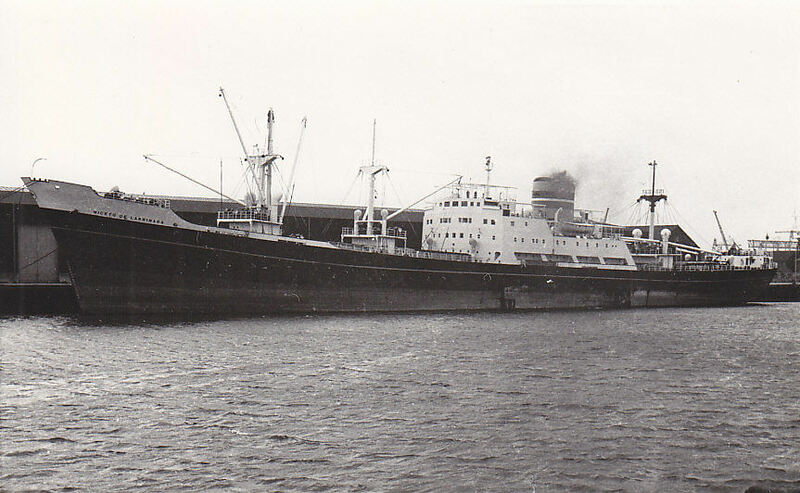 And sold in 1967 to Maldives Shipping Ltd., of Male, the Maldives, & renamed Maldive Carrier. On Oct. 4, 1974, the vessel caught fire 35 miles SE of Ras Meydani, or Ras-e Meydani, located at 25.33N/58.41E, Iran. In Dec. 1974, the vessel arrived at the Gadani Beach, Pakistan, ship breaking facilities of 'Abbas Steel Industries', to be broken up. I am unable to find WWW data re this vessel. Can you correct the above data or otherwise help? A cargo ship. Per 1 (Baden), 2 (plus 4 more images as Nautilus Line Baden & 1 as Trader - click left), 3 (Miramar, link, you now must be registered to access). 141.7 metres long, speed of 12 1/2 knots. Built for 'Diana Cia. 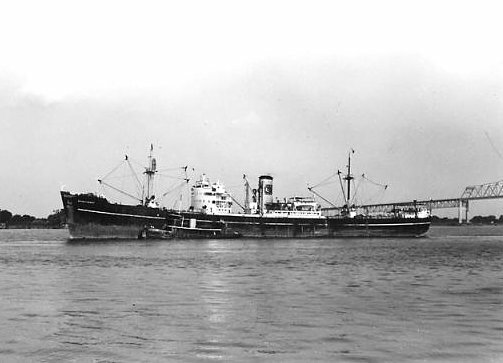 Naviera S.A.', of Panama. Sold 1951 to Nautilus Soc. Anon. di Navigazione Marittima, of Lugano, Switzerland & renamed Baden. 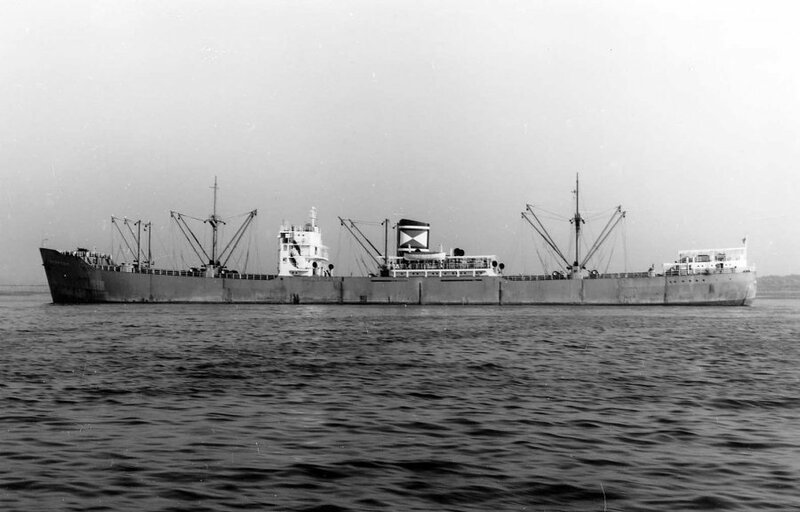 On Nov. 24, 1952, went aground 10 miles downstream from Libreville, Gabon. No damage & re-floated in early Dec. 1952. 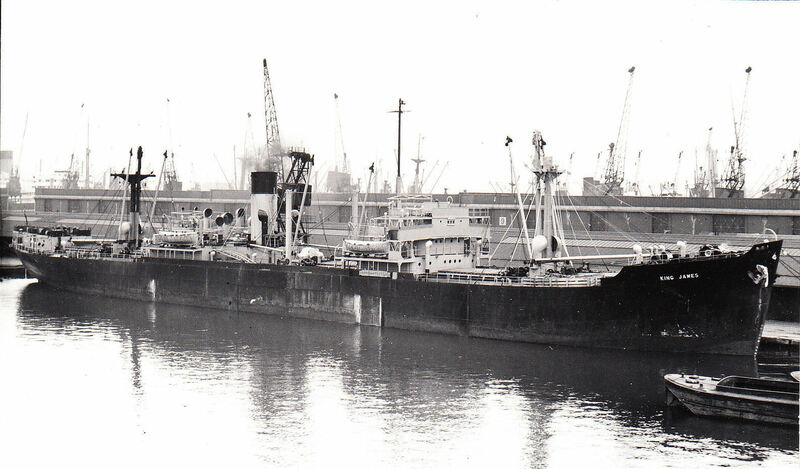 1954 sold to Keller Shipping Ltd., also of Basle. Sep. 1973 sold to Tim Shipping Co. S.A., of Piraeus, & renamed Natrader. 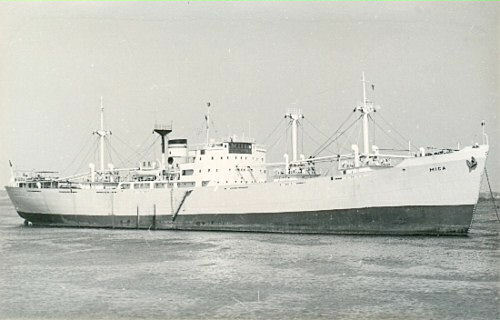 Sold Nov. 1973 to Astro Atlantico Armadora S.A., of Panama, who renamed her Trader in 1974. Sold for demolition to Eckhardt & Co. GmbH., of Hamburg, but vessel was resold to Spanish breakers, towed to Santander, Spain, & arrived there to be broken up in Mar. 1975. Anything to add? A cargo ship. Per 1 (Miramar, link, you now must be registered to access). 140.6 metres long, 461 ft., speed of 12 knots. Built for 'Stanhope Steamship Company, Limited' ('Stanhope'), of London, 'J. A. Billmeir & Company, Limited', the managers. 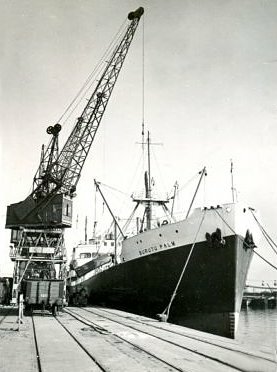 Stanhope was, I read, set up in 1934 & controlled by Jack Albert Billmeir (1900/1963), ship broker, ship owner & the owner of Stanhope. The vessel was sold, in 1954, to the Government of the Union of Soviet Socialist Republics (USSR), & renamed Sovetskaya Arktika, which name translates as 'Soviet Arctic'. 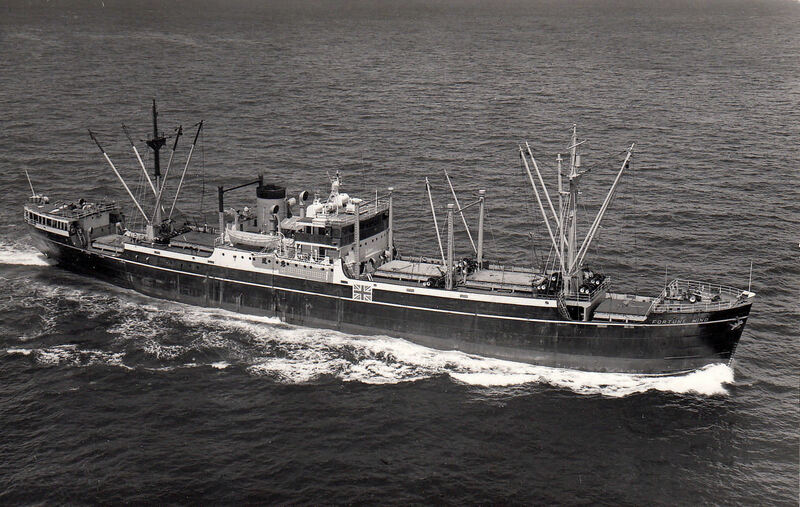 The vessel was converted to a 'fish carrier' in or about 1969. And broken up in the USSR in 1985 or 1986. There are many links to Stanhope but none that I can spot to the vessel of that name. Nor any to the vessel's later name. So I thank Miramar for their data. Where did the fishing fleet operate? Can you add anything? A freighter. Per 1 (NZ), 2 (modest image as Barrington Court), 3 (Miramar, link, you now must be registered to access). 144.1 metres long overall, 135.9 metres perpendicular to perpendicular, speed of 12 knots. Owned by Court Line Limited or maybe Court Line Shipping Company (Haldin & Co. Ltd. were I believe the managers). 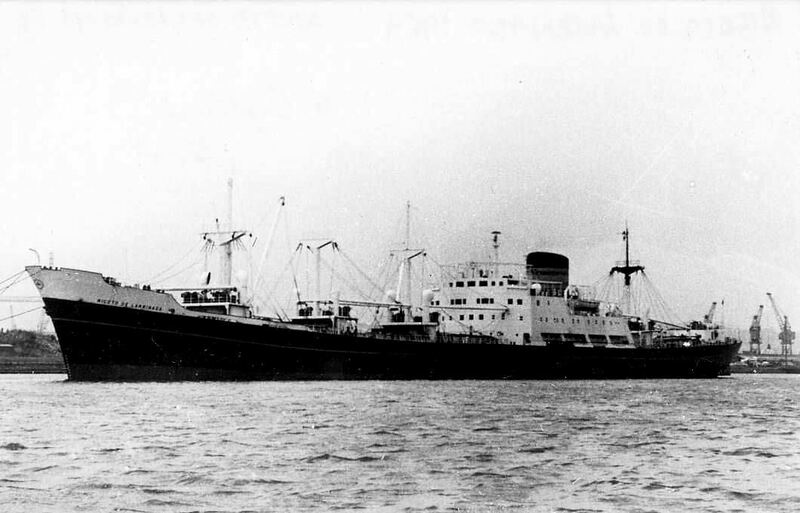 The vessel was sold, in 1963, to Jayanti Shipping Co. Ltd. of Bombay, India, & renamed Ashoka Jayanti. In 1970, the vessel was sold to 'Tex Cocle Co, SA', of Piraeus, Greece, & renamed Yannis. And in 1974, the vessel was sold to 'Shin Shin Nav Co. SA', of Panama, & renamed Blue Pearl. On May 1, 1975, the vessel arrived at Kaohsiung, Taiwan, to be broken up. Do you possibly have more detail? A cargo ship. Per 1 (image, Burutu Palm), 2 (Palm Line), 3 (image Tyhi), 4 ('wrecksite.eu', extensive 'Patience Kevin' coverage re wreck), 5 (Miramar, link, you now must be registered to access). 137.7 metres long, speed of 11 knots. Miramar refers to 'csd 7744gt/11100dw'. Can anyone explain the meaning of that reference? Built for Palm Line Limited, of Liverpool, which line served about forty ports along the African coast from Morocco to Angola. Carried palm oil in its tanks from West Africa to U.K. for William Lever (Unilever). Do read the interesting words at 5 re the vessel's navigation of tight turns in the rivers of West Africa - to Sapele, Warri, Port Harcourt & Calabar. The vessel was sold, in 1967, to 'Astrocid Naviera', of Piraeus, Greece, likely with 'I. & D. Caroussis', of Panama, the managers, & renamed Tyhi. On Jul. 27, 1970, while en route from Shanghai to Bangladesh, she ran aground in port but was re-floated. I am not clear as to exactly where that happened. Early in 1973, the vessel was sold to 'Globe Navigation Ltd.' ('Globe'), of Singapore, 'S. 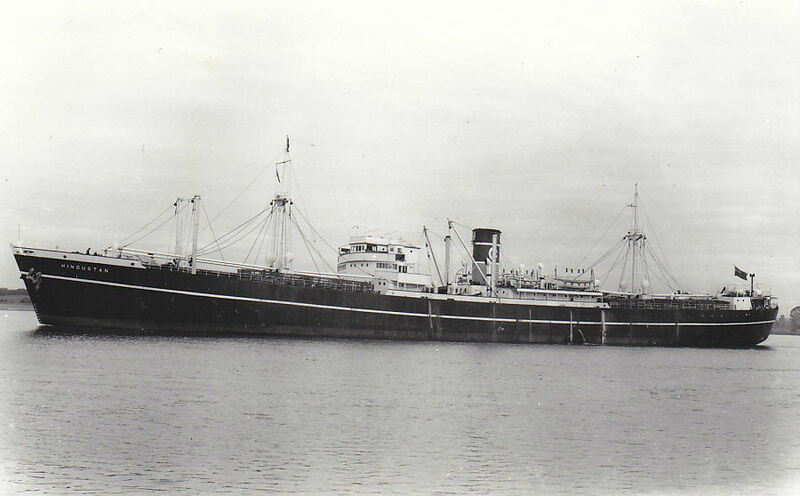 M. Maulabaksh International Trading Co.', of Hong Kong, likely the managers, & renamed Globe Star. Early on Apl. 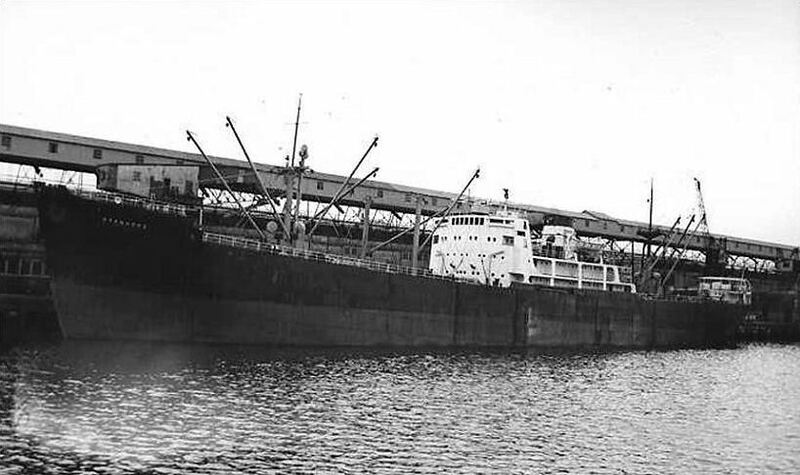 27, 1973, on her first voyage for Globe, carrying 10,000 tons of malt wheat from Iskenderun (on Mediterranean coast of Turkey) to Karachi, Pakistan, the vessel ran aground due to a navigational error & was wrecked at Leven Reef Reef, 8 miles N. of Mombasa, Kenya. Or maybe at 'Nyali Reef'. At 4.04.5S/39.42.01E. The route seems to be a puzzle. If her destination was Karachi, why was she as far south as Mombasa, even if she was there to replenish her water tanks as would appear to have been the case? Tugs attempted to tow her off without success & efforts were made to off-load her cargo. A long sad story - salvage was abandoned in Jun. 1973 when heavy seas split open the ship at hold No. 3. In Nov. 1973, 5 members of a salvage crew died in No. 3 hold - due to gas poisoning on the water surface, & as a result the wreck was off limits for a number of years. In late 1978, 'Divecon International' or 'Divecon Ltd.' essentially demolished the ship. The remains of the wreck lie in 7/10 metres of water, Kenya's best wreck dive today. Do you possibly have more detail? A cargo ship. Per 1 [Palm Line, Africa Palm (1)], 2 (Miramar, link, you now must be registered to access). 137.7 metres long overall, 129.8 metres perpendicular to perpendicular, 452 ft., speed of 11 knots. Built for Palm Line Limited, of Liverpool, which line served about forty ports along the coast from Morocco to Angola. Carried palm oil from West Africa to U.K. for William Lever (Unilever). The vessel was sold, in 1972, to 'Acromion Cia. 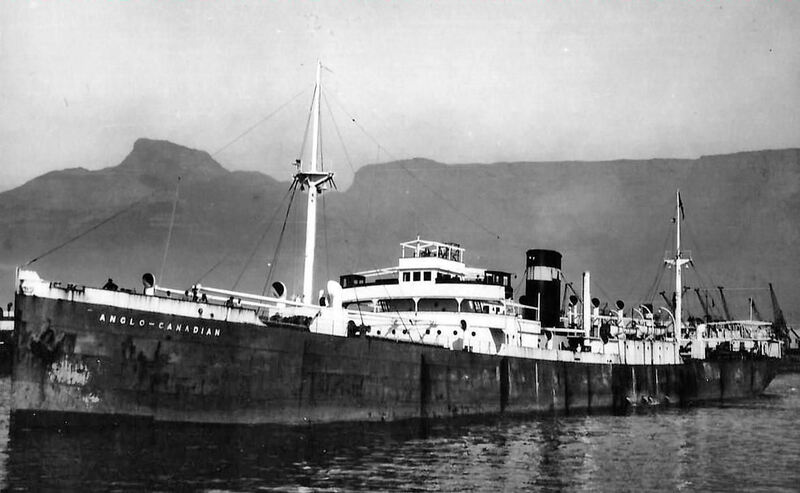 Naviera S.A.', of Panama, & renamed Savoydean. In Jul. 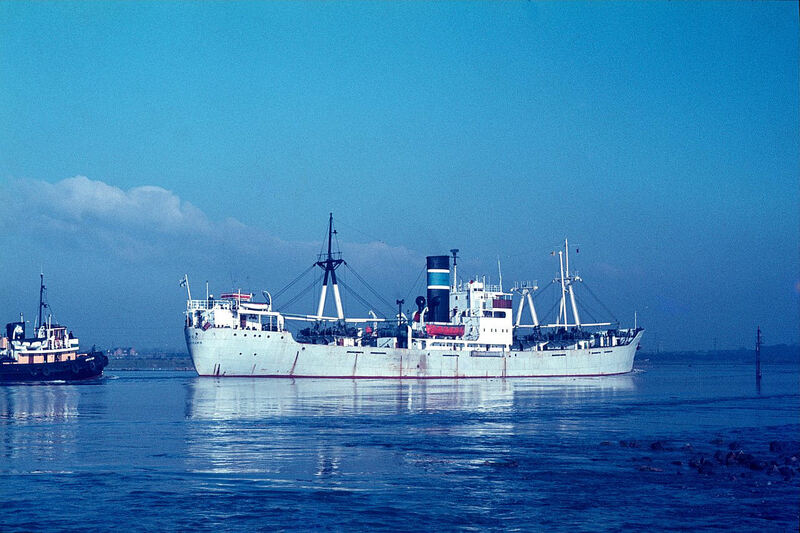 1975, the vessel was en route from Chittagong to African ports with a cargo of jute & hessian. On Jul. 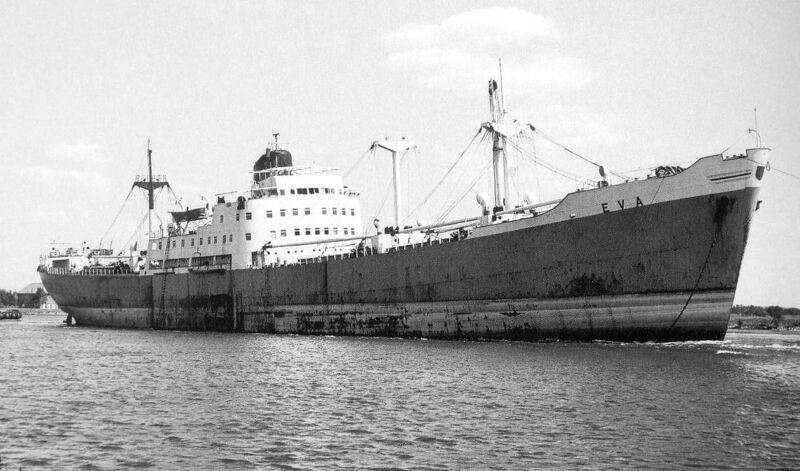 24, 1975, while loading additional cargo at Calcutta, India, the vessel suffered a fire in No. 4 hold. The fire quickly spread to other holds & to the accommodation areas causing severe damage. Her holds & engine-room were flooded during extinguishing operations, & the vessel settled to the bottom. It was re-floated but was declared a constructive total loss. Efforts were made to sell it 'as is where is', & it later was, by court order, sold to Indian Metal Traders Ltd., of Bombay, India, who, in Apl. 1976, commenced break up of the vessel. Do you possibly have more detail? A cargo ship. Per 1 (Alva, Pearlstone), 2 (image, Leto), 3 (Dutch, image & data, Leto), 4 (Miramar, link, you now must be registered to access). 141.7 metres long overall, 133.7 metres perpendicular to perpendicular, speed of 14 knots, signal letters PFON. Certainly 5884 tons in 1957/58. I believe that the initial owner was Alva Steamship Company, of London, the vessel being featured in the Sep. 1953 issue of The Motor Ship, which issue I have not seen (facts confirmed by 1). Changed names a number of times. Became Leto in 1954, owned by NV Mij Zeevaart of Rotterdam, Netherlands, Costaflora in 1967, owned by Leduma Cia Maritima SA, of Piraeus, Greece, & Pearl Delta in 1979, owned by 'Pearl Gulf Transportation Limited', also of Piraeus or maybe of Panama. On Feb. 9, 1981, the vessel arrived at the Gadani Beach, Pakistan, ship breaking facilities of Zulfiquar Metals Ltd., to be broken up. Do you possibly have more detail? A cargo ship. Per 1 (data & image, Thames Breeze, but you must now be registered to access it), 2 (Miramar, link, you now must be registered to access). 140.6 metres long overall, 443 ft., 133.2 metres perpendicular to perpendicular, 435 ft., speed of 12 knots. 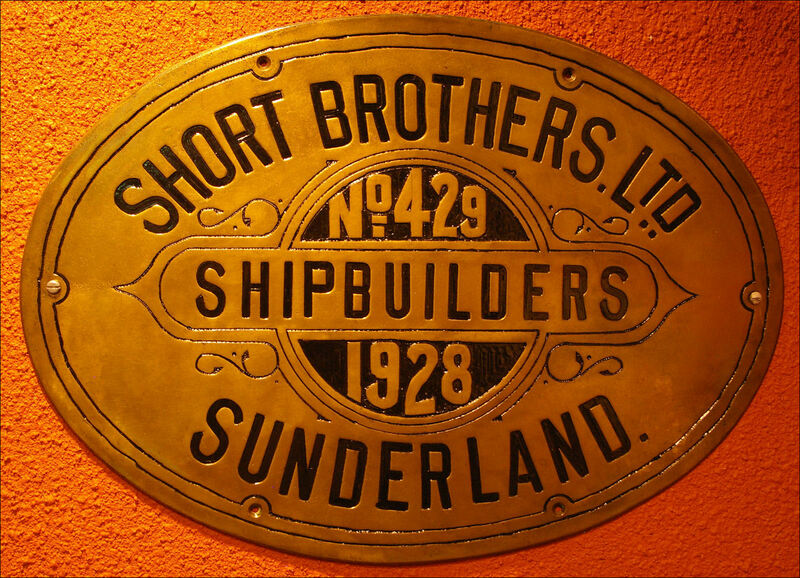 Built for 'The Thomasson Shipping Company Ltd.', of Newcastle, 'Stephens, Sutton & Co. Ltd.', also of Newcastle, the managers. The vessel visited Auckland twice - on Nov. 29, 1955 & Jan. 18, 1957. 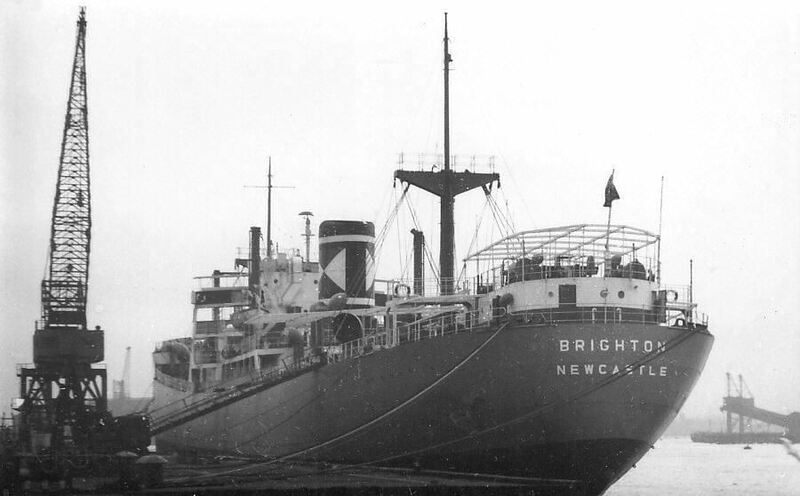 In 1958 (or maybe in 1957), the vessel was transferred to Avon Steamship Co. Ltd., also of Newcastle, with no change of vessel name. 2 states that the vessel was sold, in Feb. 1963, to Carrington Navigation, of Hong Kong, with Manners the managers. 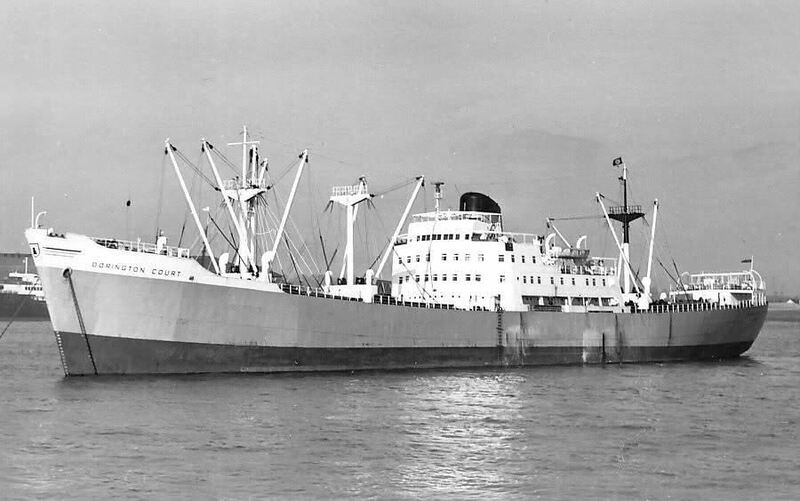 It would seem that the vessel was soon thereafter sold, in 1964, to 'Cambay Prince Steamship Co. Ltd.' ('Cambay'), of Hong Kong, which company was likely owned & certainly managed by John Manners & Co. Ltd. ('Manners'), also of Hong Kong, & renamed Thames Breeze. 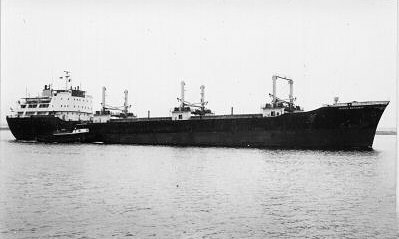 Cambay owned the vessel later, in 1969, when it ran aground. In 1964, the shelter deck was enclosed. 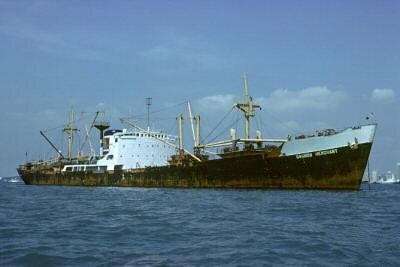 On Dec. 11, 1969, while en route from Shanghai, China, to Colombo, Sri Lanka, with a cargo of rice, the vessel ran aground & was wrecked on Investigator Reef in the South China Sea. At 9.40N/113.01E. While I have read few details as to the circumstances, I read i) that the crew abandoned the ship on Mar. 13, 1970, & ii) that on Mar. 18, 1970, the vessel was declared a constructive total loss. Do you possibly have more detail? A cargo ship. Per 1 (Auckland), 2 (data & Mica image), 3 (Miramar, link, you now must be registered to access). 142.0 metres long overall, 133.7 metres perpendicular to perpendicular, 465 ft. 10 in., speed of 14 knots. Built for 'D/S A/S Sverre', of Bergen, Norway, (S. M. Kuhnle & Son the managers?). The vessel visited Auckland, New Zealand, 6 times between Jul. 1955 & Apr. 1958. The vessel was renamed Sabre Purpose in 1961. Sold at that time? If so, the purchaser may possibly have been Sabre Shipping Corporation (a court case re Flint), with 'D/S A/S Flint' ('Flint') the manager, both of Bergen. 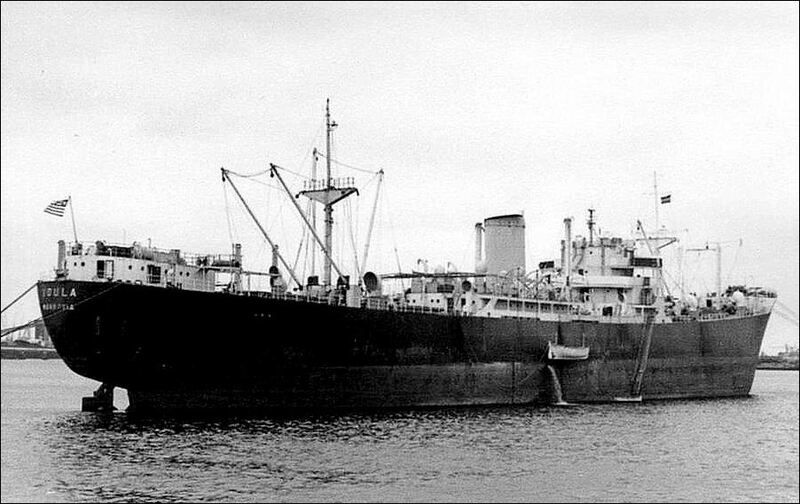 In 1962, the vessel was, I think, sold to 'D/S A/S Flint', (Willy Kubon, of Bergen, the manager), & renamed Mica. 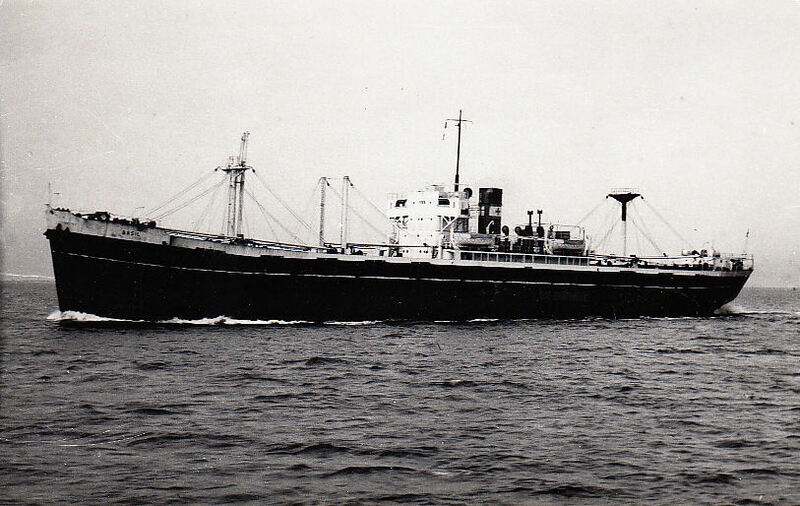 Its name became Union in 1970, when bought by Jumbo Shipping Co. Ltd., of Famagusta, Cyprus. 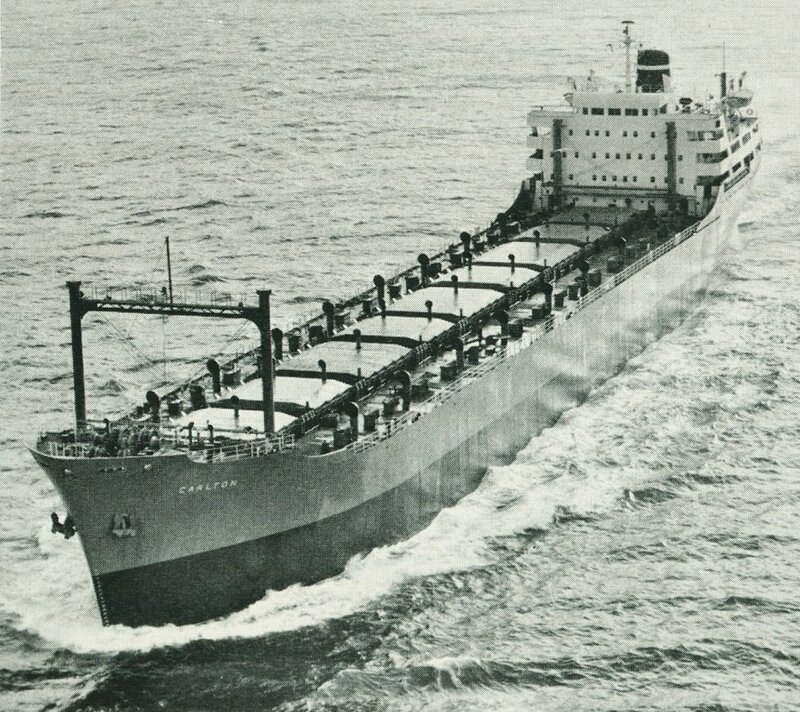 In Oct. 1971, the vessel was en route from Gdynia, Poland, to Chittagong, Bangladesh, with a cargo of coal. On Oct. 10, 1971, the vessel suffered a fire in her engine room when off W. Africa, at 7.55N/14.57W. The vessel was abandoned by her crew, &, burning furiously in 5 holds, drifted until it sank 6 days later, at 8.24N/15.04W. Both off Freetown, Sierra Leone. I presume that the crew made it safely to land. The ship would have been unable to transit the Suez Canal due to the Egyptian blockade of 1967/1975, hence was at that location. Do you possibly have more detail? A freighter. Per 1 (bottom - thanks Hilsen Arnes), 2 (Miramar, link, you now must be registered to access). 147.8 metres long, 485.0 ft. long overall, speed of 14 1/2 knots, signal letters LATH. Built for I/S "Espen", Bj. Ruud-Pedersen the managers, both of Oslo, Norway. The vessel was sold, in 1963, to Mareante Cia. Naviera S.A., of Piraeus, Greece, & renamed Agios Nikolas. It was sold again, in 1976, to Tay Hock Gwan Enterprise Pte Ltd., of Singapore, & renamed Tong Hong. And sold in 1978 to 'Taiko (S) (Pte) Ltd.', of Singapore, & renamed Cosmos Merchant. The vessel may have caught fire at Calcutta, India. It was broken up in 1983 at Calcutta. Do you possibly have more detail? A freighter. Per 1 (Norwegian, data, image, Vigrafjord), 2 [Norwegian-America Line, Vigrafjord (1)], 3 & 4 (images, Vigrafjord), 5 (Miramar, link, you now must be registered to access). 147.8 metres long overall, 485.0 ft., 137.2 metres perpendicular to perpendicular, 462.4 ft., speed of 14 knots, signal letters LASO. It would seem that the vessel's plans were published in the Sep. 1955 edition of 'Motor Ship'. Built for 'Skibs A/S Malmtransport' ('Skibs'), of Oslo, Norway. Skibs may have been owned by 'Den norske Amerikalinje A/S', i.e. Norwegian-America Line, since there are many vessel references to that shipping line. 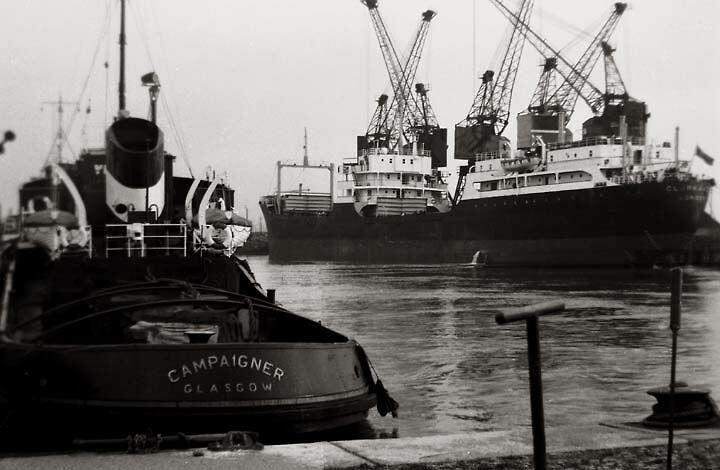 The vessel was sold, in Feb. 1960, to Ocean Tramping Corp. Ltd. ('Ocean'), of Glasgow, & renamed Oceantramp. 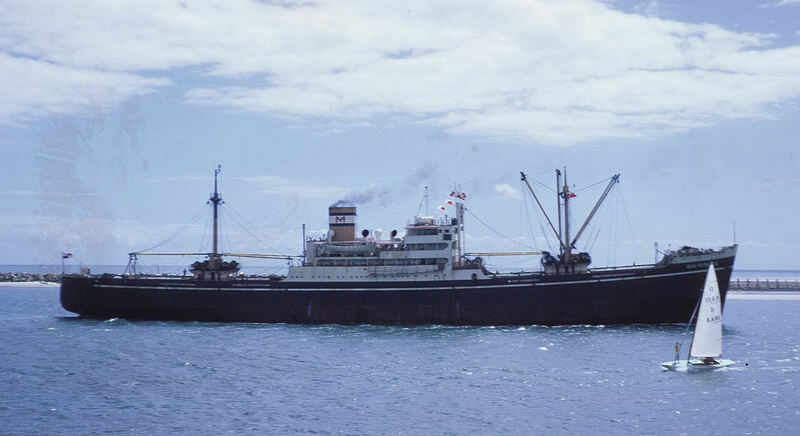 Ocean was apparently owned by Hong Kong interests & in 1963 the vessel was transferred to 'Ocean Tramping Comp. ', of Hong Kong. While I have not read the detail, it would seem that in early 1970, the vessel ran aground in the Western Caribbean, & was towed to Furness-Smiths Dock (Trinidad) Ltd. for repairs. In Sep. 1970, the vessel was sold to Nan Yang Shipping Co. ('NanYang'), of Mogadishu, Somalia, 'Ocean Tramping Co.' possibly the managers, & renamed Oriental. There also was a NanYang of Macau - the same or a related company? Perhaps the vessel was only registered at Mogadishu? On Jun. 26, 1973, while en route from Whampoa (i.e. 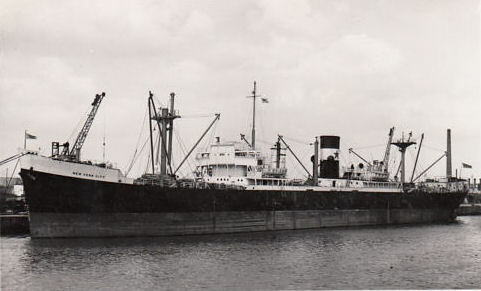 Huangpu, an outer port of Guangzhou, China), to Karachi, Pakistan, with a cargo of steel billets & coils & also general cargo, the vessel was wrecked. At 24.34N/67.06E, or 24.36N/67.07E, 14 miles S. of Karachi. The vessel broke in two, was abandoned by her crew of 43, & was declared a constructive total loss. Can anybody provide details as to the circumstances? 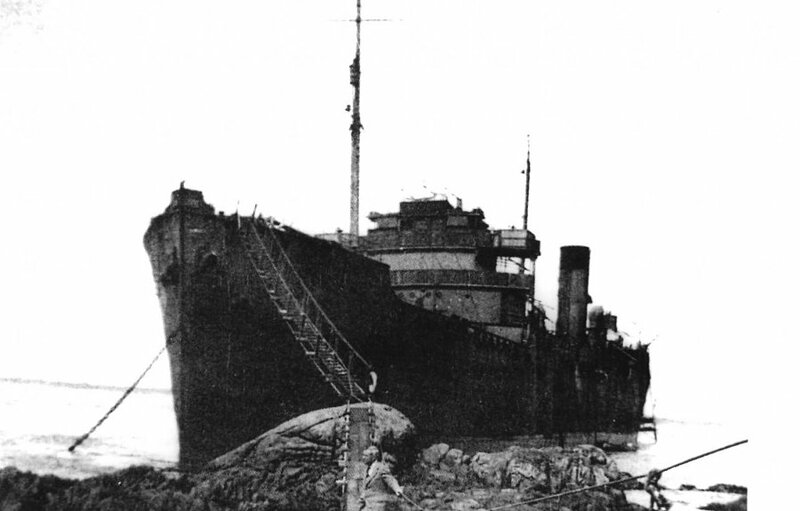 The wreck was sold to 'Taisei Kaihatsu K.K. & Nichimen K.K.' Presumably the two halves were each re-floated since I read that the vessel was later sold to Taiwan ship breakers to be scrapped. Do you possibly have more detail? A freighter. Per 1 (image & data, Dimitris P.), 2 (Miramar, link, you now must be registered to access). 149.6 metres long overall, 137.3 metres perpendicular to perpendicular, speed of 13 1/2 knots, signal letters SVDJ. Built for 'La Poseidonia Compagnia de Vapores S.A.', of Chios, Greece. 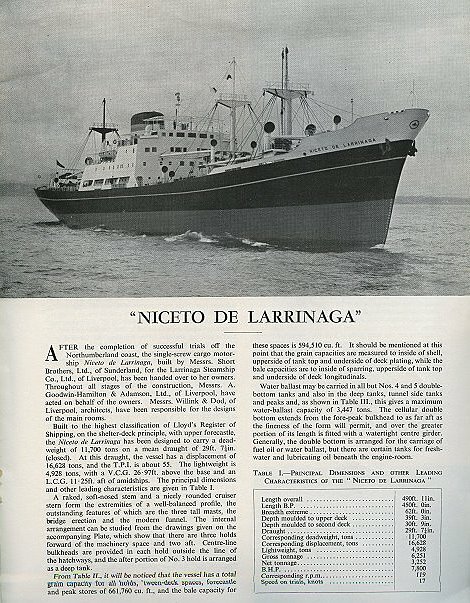 The vessel was sold, in 1978, to 'Nisos Daskalio Marine Ltd.', of Limassol (or Nicosia), Cyprus & renamed Dimitris P. In 1980, the vessel was sold to 'Prigiponissa Compagnia Naviera S.A.', 'G. & D. Pavlou Shipping Co. Ltd.', the managers, both of Panama, with no change of name. On May 13, 1983, the vessel arrived at the Gadani Beach, Pakistan, facilities of 'S. S. International' to be broken up. The WWW record for this ship is modest. Do you possibly have more detail? A cargo ship. Per 1 & 2 (similar data & image(s) Dorington Court), 3 (image, Dorington Court), 4 (fine image, Eva, but you must be registered to see it), 5 (Court Line fleet, 35% down), 6 (Miramar, link, you now must be registered to access). 144.2 metres long overall, 135.6 metres perpendicular to perpendicular, 444.87 ft., speed of 12 knots. Built for 'Court Line Ltd.', of London, 'Haldin & Co. Ltd.', also of London, the managers. The fifth fleet vessel of the name. Delivered at a difficult time - a world-wide drop in freight rates. At 10:55 p.m. on Jan. 7, 1962, or maybe early on Jan. 8, 1962, Dorington Court was in collision in dense fog with the Yugoslavian freighter Sabac, (A & B), 2811 tons. At 51.5N/1.30E, 7 miles off Dover, near the Goodwin Sands. 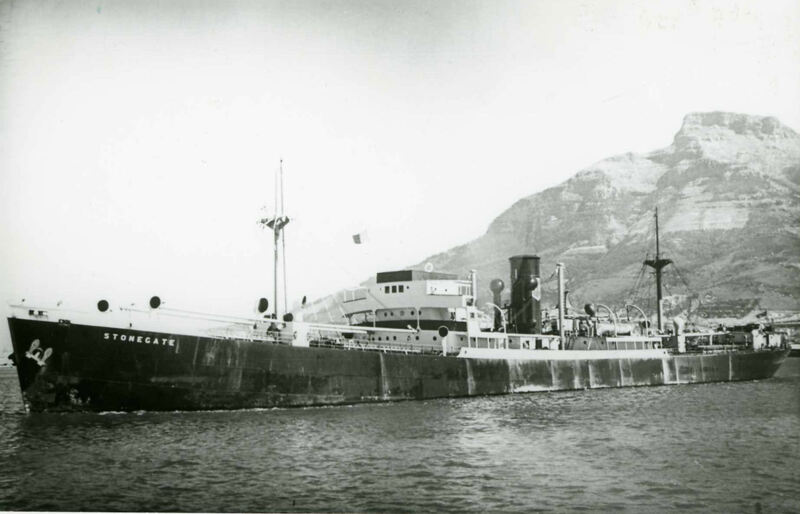 Sabac, which was en route from Ploče, Yugoslavia (now Croatia), to Rotterdam with a cargo of bauxite, was holed on her port side, indeed split in half, & sank within 5 minutes - with the loss of 28 of her crew of 33. Dorington Court, I read, suffered bow damage. Have read limited data as to the full circumstances. Dorington Court was sold, in 1963, to 'Montelindo Compania Naviera S.A.' (Montelindo'), of Monrovia, Liberia, 'Seafaring Co. Ltd.', of London, the manager, & renamed Eva. A puzzle is that a 1969 'Fairplay International' data 'snippet' refers to Eva, owned by Montelindo, having been sold to Bermudan-flag interests for $325,000 and delivered. 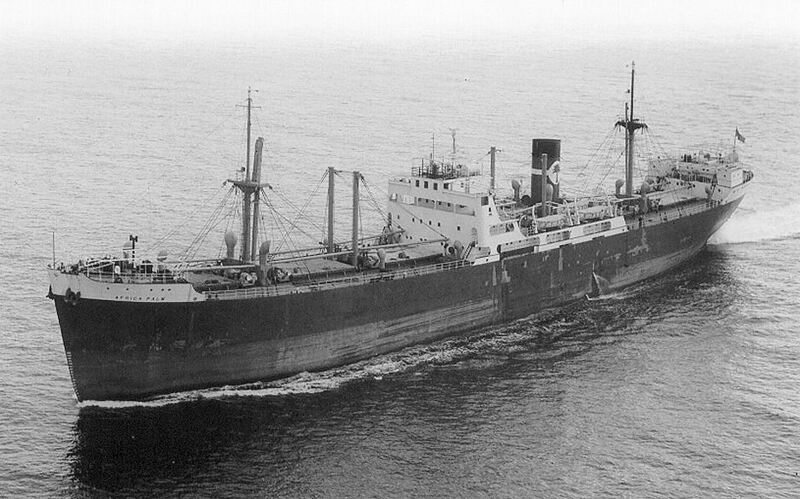 A puzzle because Montelindo is later, in 1976, said to have sold the vessel to German ship breakers. Indeed on Aug. 22, 1976, (have also read Aug. 28, 1976) the vessel arrived at the ship breaking facilities of 'Eisen und Metall Aktiengesellschaft', at Hamburg, Germany, to be broken up. That was soon after the vessel was declared a constructive total loss as a result of a fire at Gdansk, Poland, on Jul. 14, 1976. WWW details of the fire circumstances are limited, however it would seem that the fire broke out in her engine room & spread to her mid-ships & accommodation areas. The vessel was fully loaded (with what?) at the time, & near the Wiślany landing pier. All said & done, the WWW record for this ship is modest. Do you possibly have more detail? A cargo ship. Per 1 (short Chapman history), 2 (Chapman and Willan, Ltd., flags & data), 3 (Miramar, link, you now must be registered to access). 144.4 metres long overall, 135.6 metres perpendicular to perpendicular, speed of 11 knots, signal letters GVTZ. Built for Carlton Steamship Co. Ltd., Chapman & Willan, Ltd. ('Chapman'), of Newcastle, the owners/managers. The second vessel of the name owned by that company & its predecessor companies. 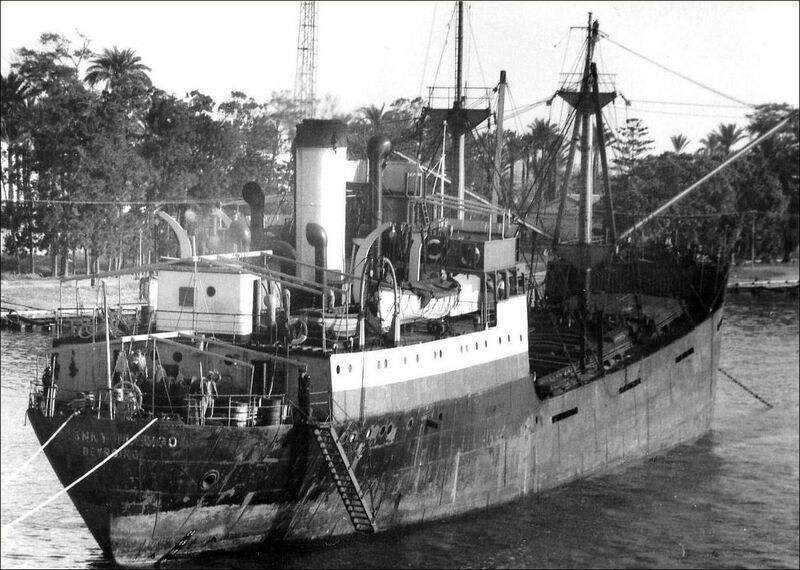 The last tramp ship that Chapman owned (they moved into bulk carriers). It would seem that the vessel spent 3 months in dry dock after running aground at Nagoya, Japan with a 'full cargo of Pollards from BA'. Thanks to a kind site visitor I learn (I profess my ignorance) that 'pollards' are soya bean oil in a pellet form, tubular in shape & prone to turning to maggots (how jolly!) within 24-48 hours if wetted. And that 'BA' would mean Buenos Aires. But when did it happen? 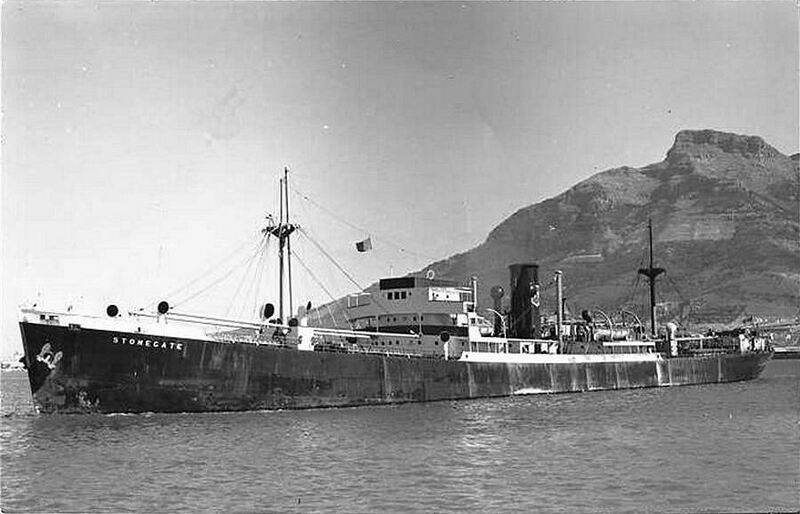 In 1959, per Miramar, the vessel became owned by Carlton Steamship Company Ltd. & Cambay Steamship Co. Ltd.'. The vessel was sold, in 1972, to 'Five Star Shipping Corp S.A.' of Greece (or of Panama), & renamed Five Star. Sounds like a luxury hotel! On Aug. 20, 1979, the vessel arrived at the Gadani Beach, Pakistan, ship breaking facilities of Rashid Ltd. to be broken up. WWW data about the vessel is essentially non-existent. Can you add anything? A cargo ship. Per 1 (Auckland), 2 (image, Scorton), 3 (Chapman and Willan, Ltd., flags & data), 4 (Miramar, link, you now must be registered to access). Built for Cambay Steamship Co. Ltd., Chapman and Willan, Ltd. ('Chapman'), of Newcastle, (R. Chapman & Son, the manager, related to the owners of Chapman). 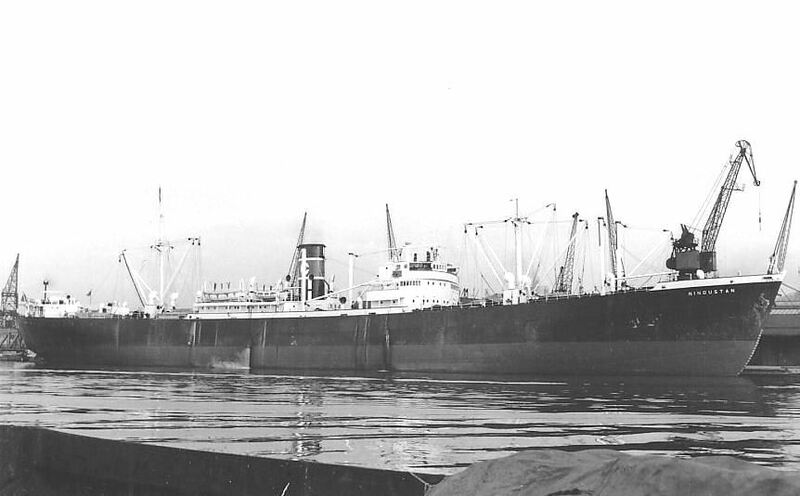 In 1959, per Miramar, the owners became Carlton Steamship Co. Ltd. & Cambay Steamship Co. Ltd. Visited Auckland, New Zealand, once, on Dec. 8, 1959. John Powles advises (thanks John!) that he served as a junior engineering officer aboard Scorton from Oct. 1969 to Sep. 1970. Sailing the Far East & tramping all around Australia, India, Malaya, Burma & Africa. A slow ship but it got around OK. John� cracked his skull on the exit doors to the engine room during a bad storm. And also got burned by being thrown onto the main exhaust also in rough seas � 'grin & bear it said the chief steward. There's no hospital at sea nor time off there'. Sold in 1970 to Greek owners (name? ), & renamed Agelos Michael. On Oct. 21, 1971, the vessel suffered explosions & caught fire about 35 miles SE of Sri Lanka. The vessel was abandoned &, I believe, sank on Oct. 29, 1971, at 5.20N/82.03E. Any loss of life? WWW data about the vessel is most modest. Anything to add? An ore carrier. Per 1 (image), 2 (Miramar, link, you now must be registered to access). Detail quite limited. 426 ft. (or 129.7 metres) long, single screw, speed of 11 (or 11 1/4) knots, registered at London. Owned by H. Clarkson & Co. Ltd., of Glasgow or London, (with references to 'J. & J. Denholm Ltd.', who perhaps were the managers?) Arrived at Faslane, on Oct. (or maybe Nov.) 13, 1972 to be broken up. Faslane would appear to be one 'site' of 'Her Majesty's Naval Base Clyde', located on the River Clyde, 25 miles from Glasgow. Can you add data to expand this listing? An ore carrier. Per 1 & 2 (same image), 3 (Miramar, link, you now must be registered to access). 129.7 metres long, speed of 11 knots, registered London. Detail quite limited. 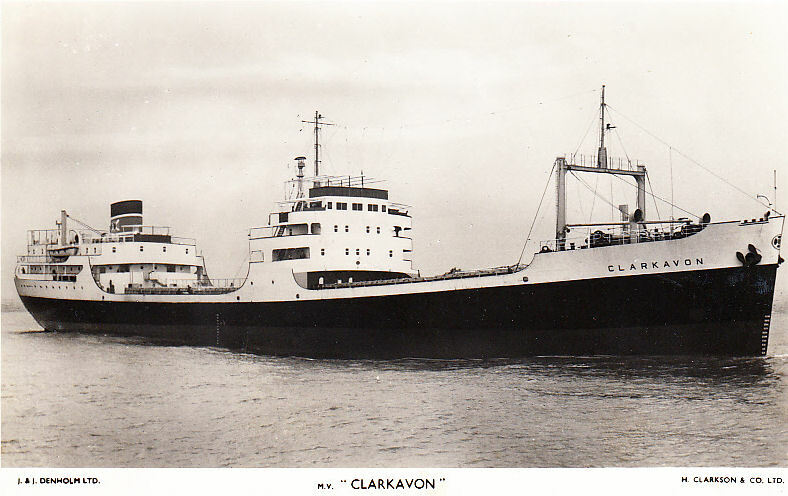 A sister ship to Clarkavon. Owned by H. Clarkson & Co. Ltd. of Glasgow or London, J. & J. Denholm Ltd., likely the managers. 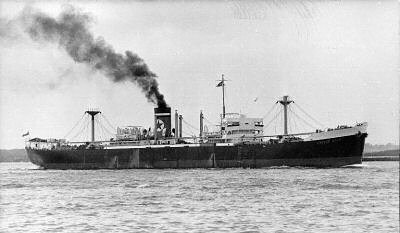 The vessel was sold in 1973, to 'Phaedon Shipping Co. SA', of Piraeus, Greece, & renamed Phaedon. And sold in 1974 to 'Prekookeanska Plovidba Bar S.A.', of Yugoslavia/Croatia, & renamed Berane. On Apl. 30, 1982, the vessel arrived at the 'Brodospas' ship breaking facilities at Split, Croatia, to be broken up. Can you add anything? A cargo ship. Per 1 (Chapman and Willan, Ltd., flags & data), 2 (image, Voula, but you must be registered to access it), 3 (1963 grounding), 4 (Global Navigation, image, Voula), 5 (Miramar, link, you now must be registered to access). 144.3 metres long overall, 135.6 metres perpendicular to perpendicular, speed of 11 knots. Built for Carlton Steamship Co. Ltd. & Cambay Steamship Co. Ltd., both owned by Chapman & Willan, Ltd., of Newcastle. 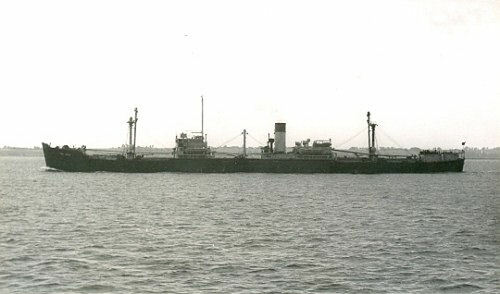 On Dec. 29, 1963, while en route from Singapore to Japan, carrying 'bags of grain & some kind of pellets (subsequently these wetted bags started to spontaneously combust)', the vessel ran aground on the Royal Captain Shoal, W. of Palawan Island in the S. China Sea, & was seriously damaged with a giant hole in her fore section. With difficulty, the vessel was freed after 27 1/2 hours & began sinking - until watertight holds were temporarily repaired. The vessel made Manila Bay at half speed to effect emergency repairs. Philip Pickford advises, in addition to the quotes above, (thanks Philip!) 'I was on the Grainton when we hit that reef. The captain, a Welshman, handled the situation beautifully. The lifeboats were swung out but not launched & all hands were set to stitching a collision mat of cargo nets sandwiched between two good hatch tarps. The galley crew fed us on deck & we sewed around the clock. The mat was positioned over the bow & we ran the engines astern. As the ship came off the reef, she slipped deeper into the water & the wooden vent plugs shot out of the goose necks like cannons going off. When she settled, the foredeck at the break of the fo'csle was just above the water. Not far off there was a pod of killer whales that seemed to take a keen interest in our antics. We got the mat in place & proceeded slowly towards Manila.' Also, in answer to my question, 'Goose neck vents along each side of the deck vented the bilges. They had wood plugs hammered in them when we were loaded with cargo.' A new bow section was later installed at Yokohama, Japan. It would seem that no mayday message was sent. It is not known, it would seem, whether there was later an inquiry into the incident. The vessel was sold in 1970 to Global Navigation & Investment Inc., possibly of Greece, & renamed Voula. Was registered at Monrovia, Liberia, & then, in 1973, Piraeus, Greece. On Jul. 6, 1980, the vessel arrived at Kaohsiung, Taiwan, to be broken up. All said & done, I can locate minimal WWW data about the vessel. Can you add anything, as Philip Pickford did? A cargo ship. Per 1 (Chapman and Willan, Ltd. flags & data), 2 (data & image Five Bays), 3 (Miramar, link, you now must be registered to access). 145.1 metres long overall, 476 ft. 2 in., 136.4 metres perpendicular to perpendicular, 447 ft. 6 in., speed of 11 (or 13) knots. 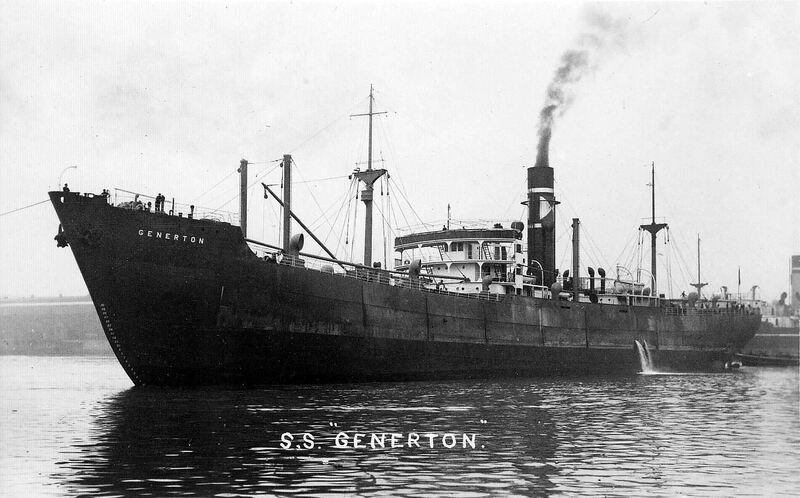 The vessel was built for Somerston Shipping Co. Ltd., owned? by Chapman & Willan, Ltd., which company, together with its predecessor companies, owned 4 vessels of the identical name. 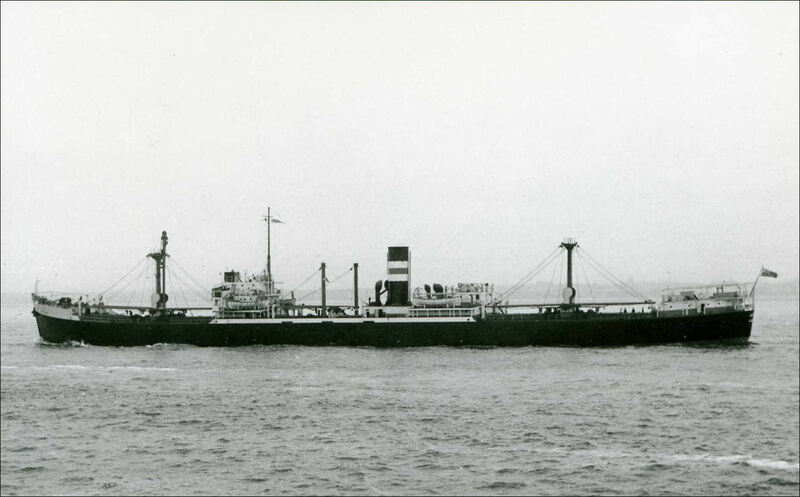 In 1969, the vessel was sold to 'Armadora Naviera Proestos S.A.', of Piraeus, Greece, & renamed Proestos. And sold again, in 1973, to 'The Flanders Shipping Co. Ltd.', of Antwerp, Belgium, renamed Five Bays, & registered at Monrovia, Liberia. On May 28, 1980, the vessel arrived at the Kaohsiung, Taiwan, ship breaking facilities of Lien's Steel Industrial Co. to be broken up. Anything you can add? A cargo ship. Per 1 [Larrinaga Line, Niceto de Larrinaga (3)], 2 (2 pages of images via i) 'Gallery' at top left & ii) entry of Niceto de Larrinaga in search box at right edge 1/3 down) - I presume it is all still there; you must now be registered to access), 3 & 4 (1961 damage & tow images, & many more via (in Dutch) 5 (item 3), 6 (Court Report), 7 (a fully illustrated account of 1966 voyages, thanks to Alan Rutherford), 8 (Miramar, link, Sitala, you now must be registered to access), 9 (Miramar, link, Niceto de Larrinaga, you now must be registered to access). 451 ft. 0 in. long perpendicular to perpendicular, 491 ft. 2 in. long overall, later, from 1964, 518 ft. 7 in. (158.06 metres) long perpendicular to perpendicular, 558 ft. 6 in. (170.23 metres), single screw, speed of 16 (or 15 1/2) knots, signal letters GCCH, 7800 BHP engines by Geo. 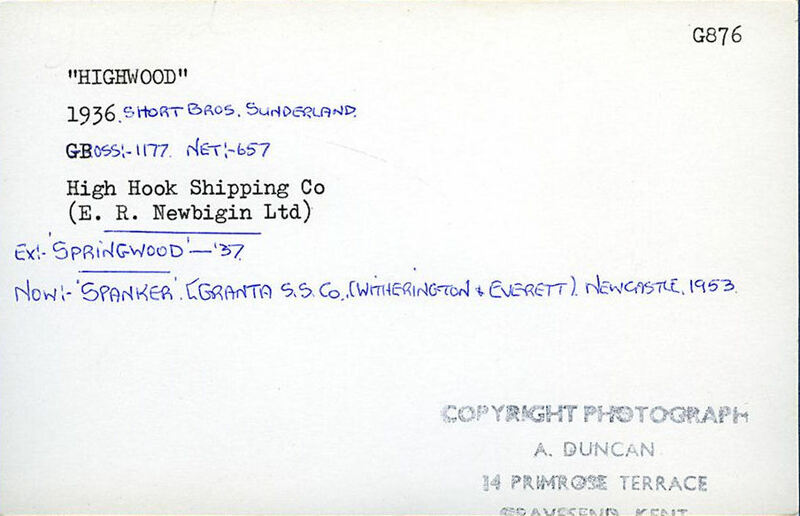 Clark & North Eastern Marine Co. Ltd. of Sunderland. Built for 'Larrinaga Steamship Company Limited', of & registered at Liverpool. 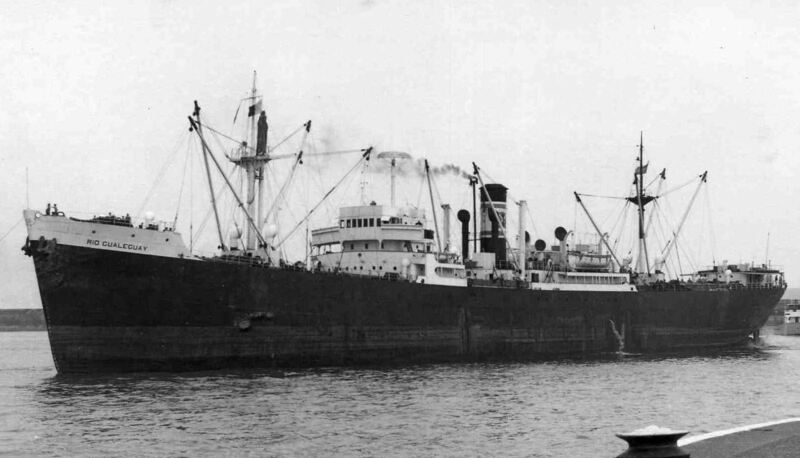 Was chartered to carry wheat from Geelong, Australia, to Shanghai, China, & then, in Aug. 1961, was chartered to 'British Phosphate Commissioners' to carry phosphates from Nauru, Micronesian S. Pacific, to Lyttelton, New Zealand. Carried nitrates from Tocopilla, Chile. 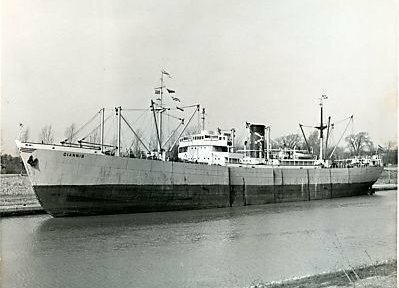 On Sep. 23, 1961, while en route, with a cargo of iron ore, from Freetown, West Africa, to Ymuiden, Holland, with a crew of 42 all told, the vessel collided in calm conditions but in dense fog (visibility of no more than 300 ft.) with Sitala, a 49,204 ton supertanker of 'Soci�t� Maritime Shell France'. Niall Golding, Acting 3rd Mate at the time, advises (thanks Niall!) that the collision occurred on Sep. 23, 1961, 8 to 10 miles N. of the Casquets, just west of Alderney in the English Channel. Niceto de Larrinaga's stern & port side was badly damaged (it collided with the stem & forward bow of Sitala) & two Niceto de Larrinaga crew members were killed as a result. The vessel was towed to Ymuiden, Holland, to be unloaded & then towed to Amsterdam for dry-docking & repairs. We seem to not know what happened to Sitala. We thank Niall Golding, for much of this data. The Court found that the bad navigation of Niceto de Larrinaga was a cause in the collision & the Master's Certificate of Joseph Meade, its Master, was suspended for 9 months. The Chief Mate's also, I understand. I underlined the 'a' because the Master of Sitala was not present at the hearing, rather his statutory statement, made at Rotterdam, was read to the Court & the Court agreed to proceed based only on the data presented at the hearing. I wonder why he was not required to appear? Was there a French hearing into the collision? It would, regardless, seem that Niceto de Larrinaga was proceeding at an excessive speed in all of the circumstances. 'There is no doubt that the navigation of the "Niceto de Larrinaga" was deplorable. The speed of between 12 and 13 knots was excessive ...' If I understand Niall's words correctly, Sitala made course changes which were quite inappropriate, but that evidence was maybe not presented at the hearing? In 1964, the vessel was lengthened to 170.2 metres at Harland & Wolff, Belfast, & her tonnage increased from 8,869 to 10,519 (or 10,520) tons. Images of the separated bow section is at 2 (access as above). From Jan. thru Jul. 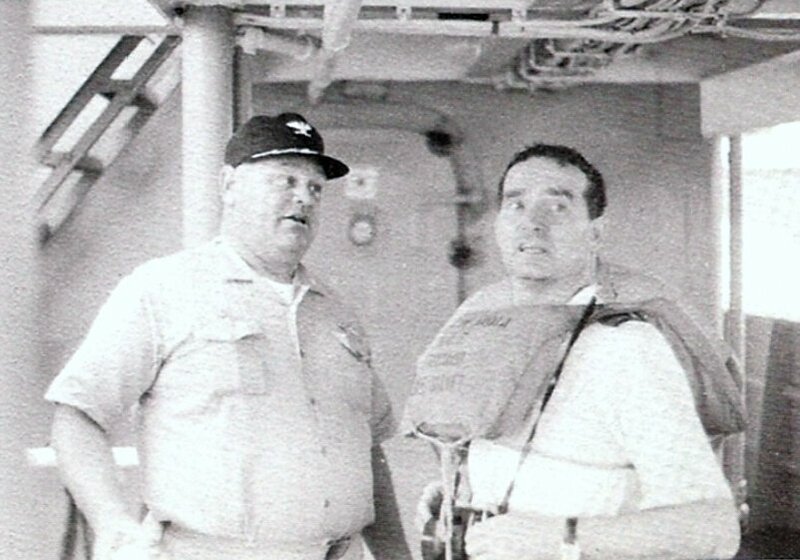 1966, Alan Rutherford served as a cadet aboard the vessel. Alan has kindly made available an account of his voyages & many many images. All available via link 7. 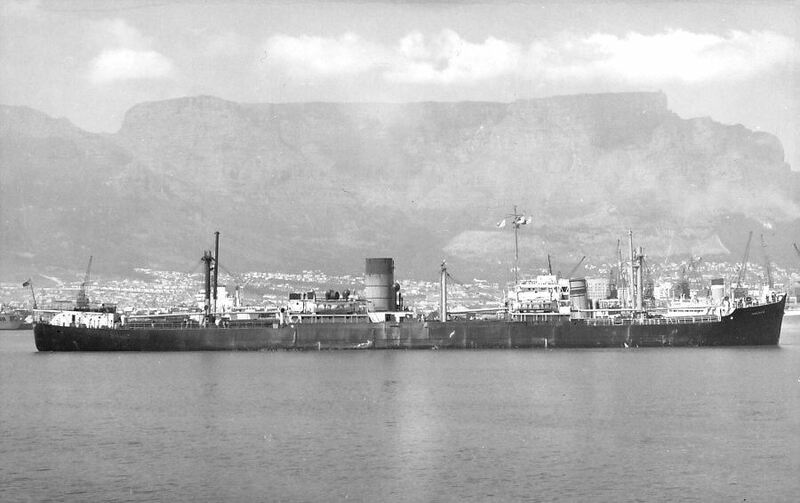 The vessel was sold, in 1972, to 'Navarino Shipping Co.', of Cyprus (owned by N. D. Papalios, i.e. Aegis Lines) & renamed Aegis Bounty. 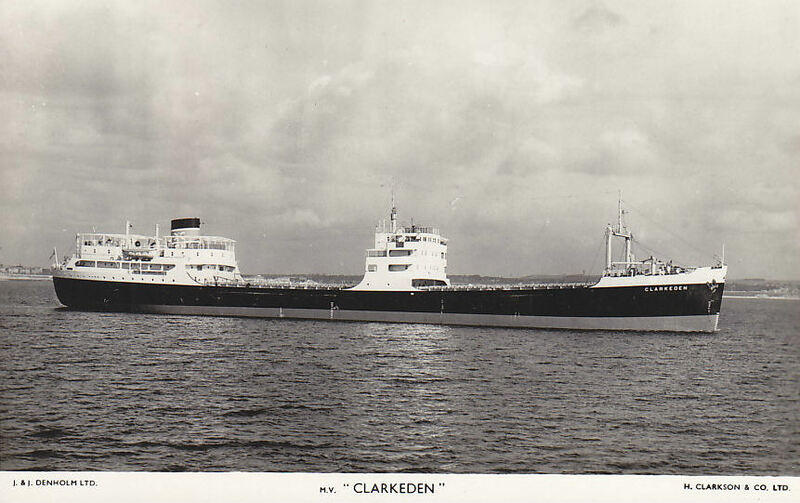 It was sold again, in 1978, to 'Char Chun Marine (Panama) S.A.', & renamed Char Chun. 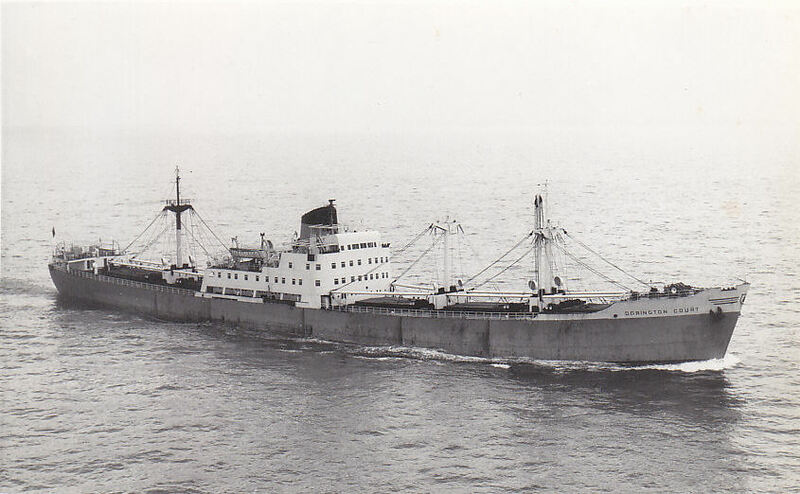 And sold again, in 1979, to 'Char Hang Marine (Panama) S.A.', & renamed Char Cheng. Was broken up at Kaohsiung, Taiwan, in 1981. Can you add anything? A cargo ship. Per 1 (Chapman & Willan, references to Brighton), 2 (Chapman and Willan, Ltd. flags & data), 3 (image, Brighton, but you must be registered to access it), 4 (image & data, Loukia), 5 (Miramar, link, you now must be registered to access). 145.1 metres long overall, 476.2 ft., 136.4 metres between perpendiculars, speed of 11 knots. The vessel was built for Carlton Steamship Co. Ltd. & Cambay Steamship Co. Ltd., Chapman and Willan, Ltd., of Newcastle, the managers. 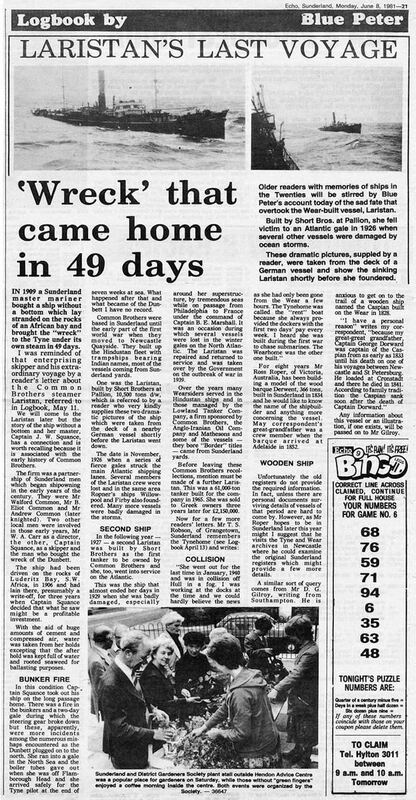 On Feb. 19, 1961, the vessel stood by the wrecked Runic on Middleton Reef (Tasman Sea, 120 miles N. of Lord Howe Island, at 29.28S/159.04E) until salvage tugs arrived. 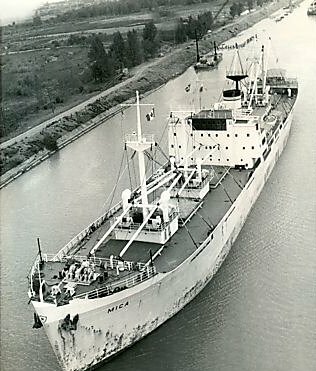 The vessel was sold, in 1971, to 'Efmariners Cia SA', of Piraeus, Greece, & renamed Kaptayanni. And renamed Mareantes in 1973. In 1975, the vessel was sold to 'Conship Cia SA', also of Piraeus, & renamed Loukia. And renamed Melpo in 1976. The vessel was laid up in 1980. 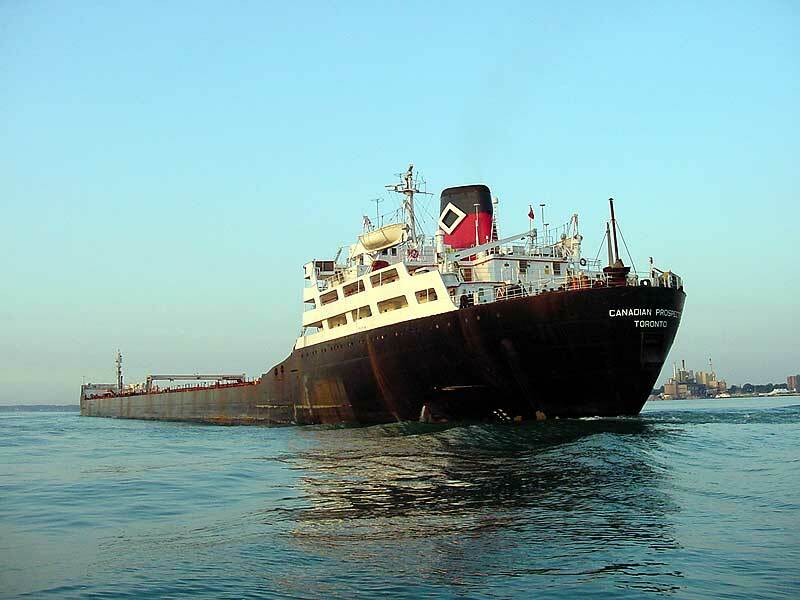 In 1981, the vessel was sold again, to 'Skystar Cia Naviera SA', of Piraeus, & renamed Despoula K. On Sep. 2, 1982, while on tow by Forum Craftsman from Monrovia (Liberia, West Africa) to Yugoslavia to be broken up, the vessel broke its tow in heavy seas & was wrecked. At 6.30.24N/10.57.18W. Off the W. African coast, near Monrovia. WWW data about the vessel is modest. Anything to add? A cargo ship. Per 1 (image), 2 (Chapman and Willan, Ltd. flags & data), 3 (Auckland), 4 (Miramar, link, you now must be registered to access). 136.4 metres long. Built for Somerston Shipping Co. Ltd., owned? by Chapman and Willan, Ltd., of Newcastle. Who over time had 3 vessels of the name. Visited Auckland, New Zealand, in May 1965. Sold in 1968 & renamed Captain Lemos. Sold in 1973 & renamed Michael Angelos. Sold in 1976 & renamed Kallimachos. Sold in 1979 & renamed Sami. Have not read the names of the new owners re any of the above sales, but in view of the vessel names, the purchasers are likely Greek. On Apl. 8, 1982, arrived at Gadani Beach, Pakistan, to be broken up. WWW data about the vessel seems to be non-existent. Anything to add? A bulk carrier. Per 1 (extensive history of vessel), 2 (New Zealand), 3 (fine image, Virana), 4 (image, Martin's), 5 (Miramar, link, you now must be registered to access). 161.6 metres long overall, 150.9 metres perpendicular to perpendicular, speed of 13 1/2 knots, signal letters JXPI, later SXTU & HPMZ. Built for 'Skibs A/S Eidsiva', of Oslo, Norway, with 'Sverre Ditlev-Simonsen & Co. Management A/S', the vessel's manager. A frequent visitor to Auckland, New Zealand - 5 times between Apl. 29 & Sep. 30, 1966. In 1967, the vessel was sold, for a reported �725,000, to 'Panvia Compania Naviera SA' of Monrovia, Liberia, managed by 'M. 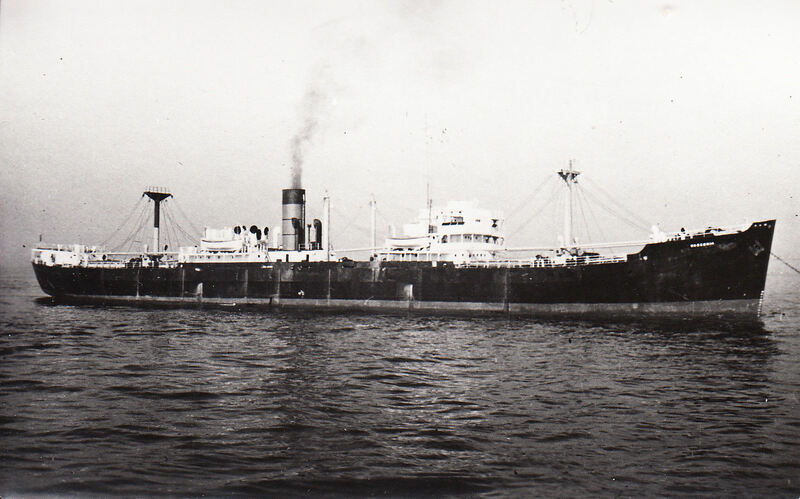 Marcou Shipping Co. Ltd.', of London, ('M' means 'Marcos') & renamed Marco Botzaris. So named, the vessel visited Auckland 3 times between Mar. 15, 1968 & Mar. 7, 1969. On Jul. 15, 1976, the vessel was sold to 'Eucharis Shipping Corp.', of Monrovia, 'Finnaval SA' of Piraeus the managers, & renamed Arc. The vessel was initially registered at Liberia but soon was registered at Piraeus. On Jan. 2, 1980, the vessel suffered an engine room fire when at Manzanillo, Mexico. Following that fire, the vessel was sold, for approximately $700,000, to 'Audacity Maritime Corp.' ('Audacity'), 'Naval Engineering Dynamics Ltd.' the managers, both of Piraeus, & renamed Martis (often referred to as Matis). Audacity had the vessel towed, by Englishman, to Piraeus, to effect repairs (left Manzanillo on Mar. 15, 1980, arrived at Piraeus on May 25, 1980 - a very long tow!). In 1982, the vessel was sold for the last time, to 'Mediterranean Sky Navigation Co. SA', (or Ltd.), of Panama City, Panama, managed by 'STL Ship and Trade Management Ltd.', (the correct name? ), of Geneva, Switzerland, & renamed Martin's. Mainly engaged, I read, in the cement trade of 'Seapako', of Geneva, with officers & crew, 24 in all, of the Philippines. 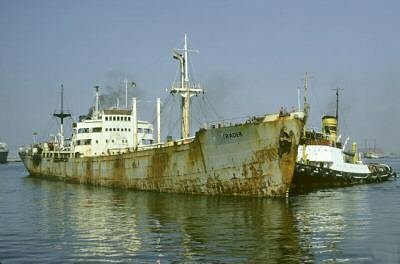 On Feb. 8 (or Feb. 10), 1984, the vessel arrived at the Karwar, (Karnataka State, SW coast of India, S. of Goa), ship breaking facilities of 'Metal Scrap Trade Corp.', to be broken up. Anything you can add? A universal bulk carrier. Per 1 (extensive data & a great many images), 2 (Burnett history, 40% down), 3 (image, Canadian Prospector), 4 (10 images, Canadian Prospector, en route to scrapping, top of page), 5 (Miramar, link, you now must be registered to access). 171.3 metres (530.0 ft.) long, speed of 14 1/2 knots, signal letters GMMU. The very last ship built by Short. Built for Chapman & Willan Ltd. ('Chapman'), of Newcastle (Upper Lakes Shipping, Ltd., maybe the managers). In 1968, the vessel was lengthened (one new cargo hold added) at Amsterdam. Became 195.7 metres (610 ft. 1 in.) & 16303 tons gross. The vessel was chartered to 'Federal Commerce and Navigation Limited' ('Federal') at about this time. John Powles advises (thanks John!) that he served as 3rd Engineer aboard Carlton in the 1970s, sailing to U.S.A. & to S. America. A fair ship to sail on - we had a good crew in the engine room. On one of John's voyages, a Greek ship cut across Carlton's bow entering the port of Genoa, Italy. Carlton raked the starboard side of the Greek ship, knocking off hand railings & other parts as she went past. Carlton's starboard bow suffered damage too, which included a hole in the bow at water level - an unfortunate incident for the skipper who was retiring at voyage end. 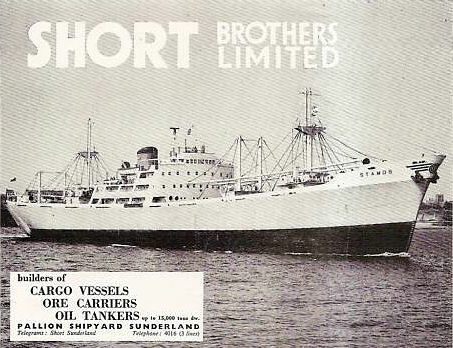 In 1974, Burnett Steamship Co. Ltd. ('Burnett') of Newcastle, acquired Chapman & hence Carlton. Burnett was then taken over (in 1975?) by Federal, of Montreal, Quebec. 'Burnett Chapman Ship Management Ltd.' became the managers. 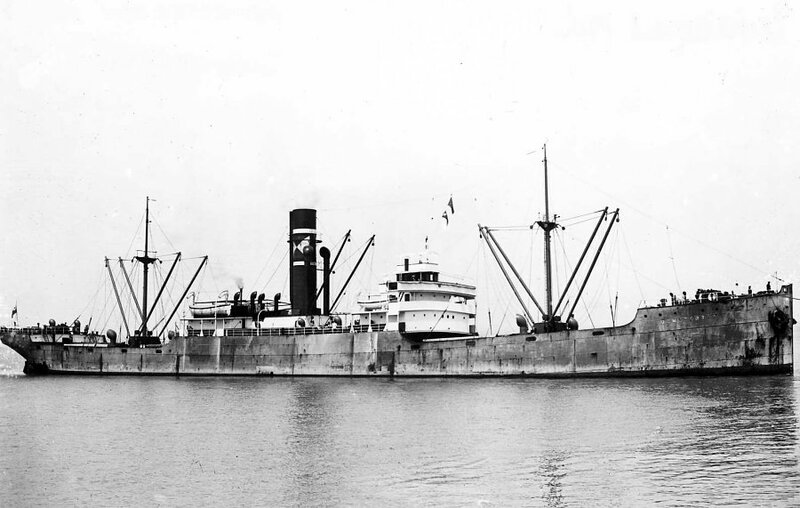 The vessel was renamed Federal Wear. A puzzling ref. to Port Weller Dry Docks, Ltd., of Toronto, Ontario, Canada, being the owner of Federal Wear. 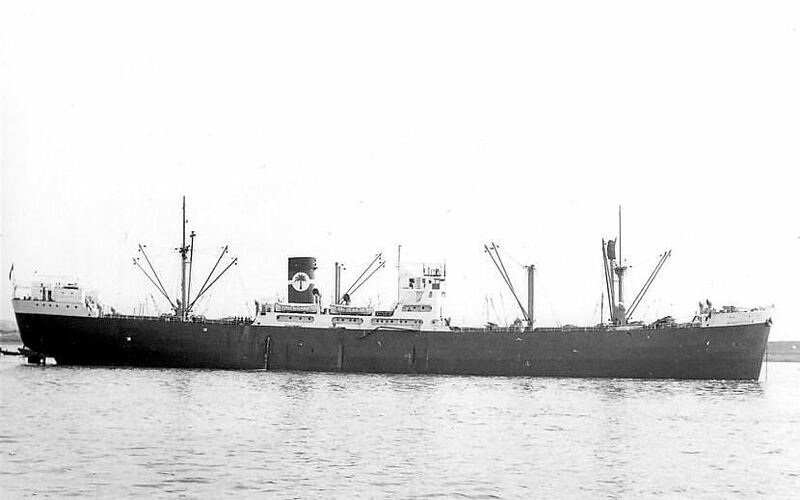 Also in 1975, the vessel was sold to Upper Lakes Shipping Ltd., of Toronto, & renamed St. Lawrence Prospector. Another puzzling ref. :- In 1979, owner became Niagara Finance Corp., Ltd., also of Toronto. On Mar. 31, 1979, the vessel was renamed Canadian Prospector. Was lengthened in 1979 & a bow thruster was installed at Saint John Shipbuilding & Dry Dock Co., Ltd., of Saint John, New Brunswick, Canada, to serve on the St. Lawrence Seaway. Became 222.5 metres long & 18527 tons gross. On Apl. 8, 1980, while upbound on the St. Lawrence, the vessel ran aground near the Haskell Shoals (where exactly is that?). Was freed after 2 days, & with temporary repairs effected, proceeded to Hamilton, Ontario. 5 longitudinal cracks on her starboard side were discovered - repairs were made at Port Weller Dry Docks ('Port Weller') on the Welland Canal. On Sep. 7, 1981, while upbound on the St. Lawrence again, she ran aground 200 ft. below Sillery Wharf, Quebec. 2 states that the vessel was then (not sure when the words were written) sailing under the management of Seaway Marine Transport or Seaway Bulk Carriers, of St. Catharines, Ontario, (a partnership of Algoma Central Corp. and Upper Lakes Group), & engaged in the shipment of grain & iron ore in the St. Lawrence & Great Lakes area. On Oct. 12, 2002, while downbound for Port Cartier, Stella Nova lost steering & collided head on with Canadian Prospector, near the C�te Ste. Catherine Lock, Lachine Canal, near Montreal. Canadian Prospector suffered bow damage & was holed below the waterline by the bulbous bow of Stella Nova, which was also damaged, of course. Canadian Prospector was repaired at Port Weller. A frequent customer there, it would seem! Still operating, I understand, in Nov. 2009. The above text surely needs corrections which are invited. Have seen a ref., as an example, to Leitch Transport Ltd. owning the vessel in 1975. On Oct. 1, 2010, after a long period laid up at Montreal, Canadian Prospector commenced its journey to Turkish shipbreakers, towed by tugs Simoon & Vigilant 1. Do you have knowledge to contribute? I knew absolutely nothing about this shipbuilder. But was curious when I found an obscure reference to a ship that was built by Simey in 1877 & went aground in 1881. Now there was an earlier 'Simey', who went into business with Philip Laing in years 1834 thru 1837. That was Thomas B. (Boyes) Simey (1798/1871). But... Stan Mapstone tells us about Alfred Simey here. He advises that Alfred Simey & Co. started building wood ships at Strand Slipway, Strand Street, Monkwearmouth in 1861, & that he was in business until 1879. Along the way he built 33 ships, totalling 15,142 tons. He was clearly the son of Laing's Simey - Thomas B. (Boyes) Simey - Stan describes Alfred as being 'the son of T. B. Simey who had run his own yard on the Wear before becoming a surveyor'. Being a surveyor refers to the older Simey's role as the Lloyd's Surveyor for the river Wear. 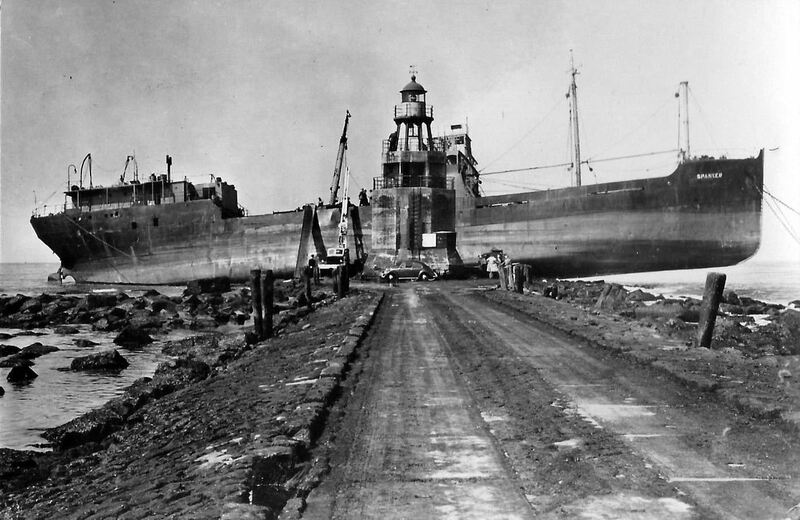 The Alfred Simey & Co. shipyard may have been known as 'Simey's Slipway', or just Strand Slipway, it would seem. There were three partners, i.e. Alfred Simey, William Stobart & Philip Henry Laing. If you can add additional data, your contribution would be most welcome. 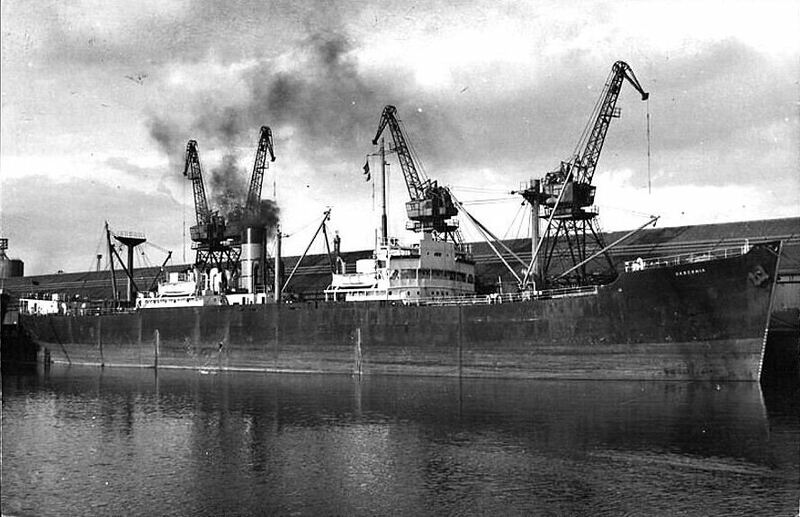 A site visitor, a member of the 'Simey' family, has kindly provided some extensive detail about the 'Simey' family history & about their extensive shipbuilding background. But has requested anonymity. I include the detail next, substantially as it was provided. Should anybody wish to contact that site visitor, I will gladly offer to be the 'go-between'. Thomas Boyes Simey Thomas Boyes Simey was born in�Bishopwearmouth in 1798 & baptised there on May 17, 1799.�On Nov. 22, 1827, also in Bishopwearmouth, he married Isabella Harrison & they had 12 children - including Alfred Simey, of course. Thomas Boyes Simey was a shipbuilder. 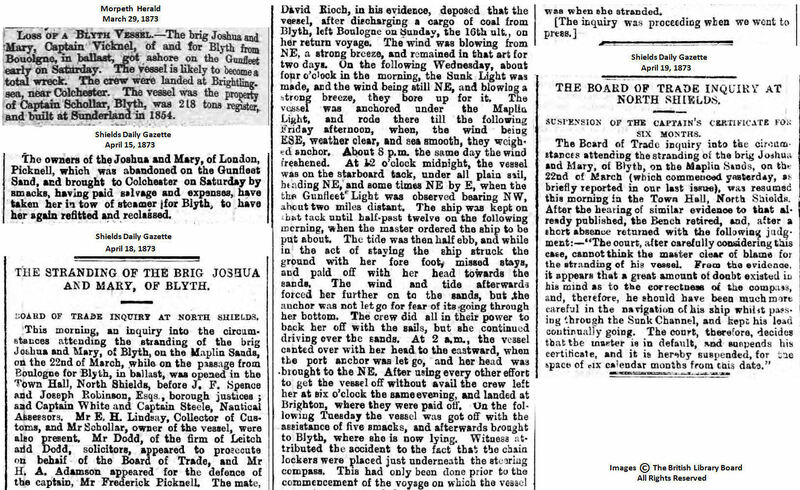 The Newcastle Courant dated Dec. 1, 1836 shows Thomas, 'shipbuilder at Deptford, near Sunderland', dissolved the partnership of Laing & Simey. The 1841 Census shows Thomas as a Ship Owner, living with his wife and children in Frederick Street, Bishopwearmouth. The 1850 Ward's Directory for Sunderland shows Thomas as a 'Surveyor of Shipping' with an office at 46 Villiers Street, Sunderland.�He is also shown as a Councillor for Bishopwearmouth Ward. The Mercantile Navy List dated 1860 shows Thomas as one of four Sunderland Nominees of the Board of Trade. The 1861 Census shows Thomas, his wife, children and four servants, living at 'The Poplars', Bishopwearmouth. In 1866, Thomas was Land Tax Commissioner for County Durham. The Newcastle Courant dated Feb. 10 shows he died earlier that month of heart disease, and gives his�home address�as 'Ashbourne Villa', Bishopwearmouth.�His wife, Isabella, died in late Jan. 1892. 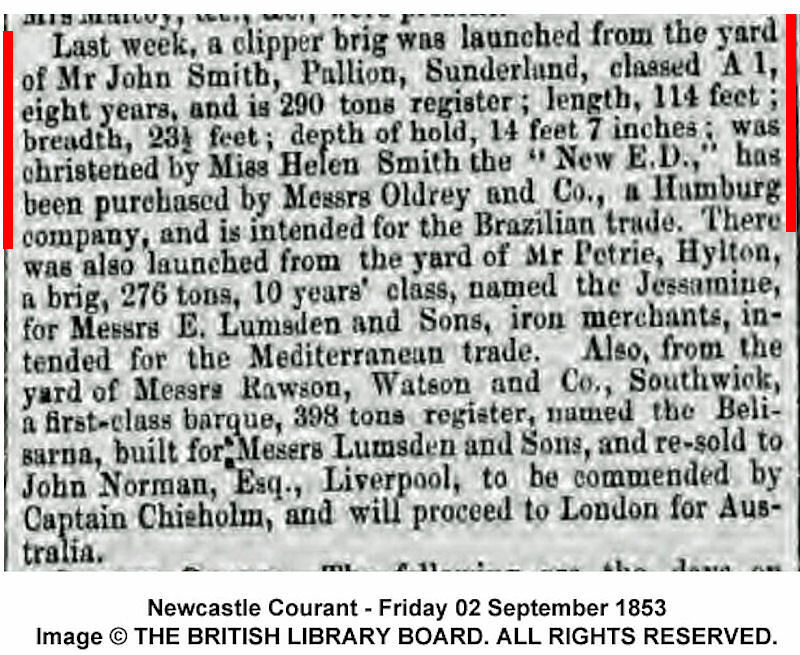 Thomas Harrison Thomas Harrison was described in the Newcastle Courant newspaper announcement of Isabella's marriage as 'of His Majesty's Customs', & he appears in Pigot's Trade Directory of 1828 as a 'Shipowner' in Bridge Street, Bishopwearmouth. Alfred Simey was born in Bishopwearmouth & baptised there on Jul. 23, 1839.� His father was Thomas Boyes Simey. And Isabella Harrison, daughter of Thomas Harrison, was his mother. The London Gazette dated Dec. 05, 1865 gave Notice of the dissolution by mutual consent of Alfred's partnership with his brother-in-law, Thomas Henry Woods, in the shipbuilding and ship repairing business at Strand Slipway, Monkwearmouth Shore. The 1871 Census lists Alfred as 'Anthony Simey', aged 31, Shipbuilder employing 7 men and boys, and living with his wife, 3 daughters�and 3 servants at 8 Roker Terrace, Bishopwearmouth. The Middlesbrough Daily Gazette dated May 7, 1875 shows Messrs A. Simey & Co. lost �22,000, under the heading 'Another Heavy Failure in the Steam Shipping Trade'. The London Gazette dated Dec. 17, 1878�gave Notice of Dissolution, by mutual consent, on Nov. 1, 1878,�of the business partnership of Alfred Simey, William Stobart and Philip Henry Laing as Iron Shipbuilders/Repairers, known as Alfred Simey & Co.�Afterwards, Stobart and Laing continued the business as 'Strand Slipway Co'. 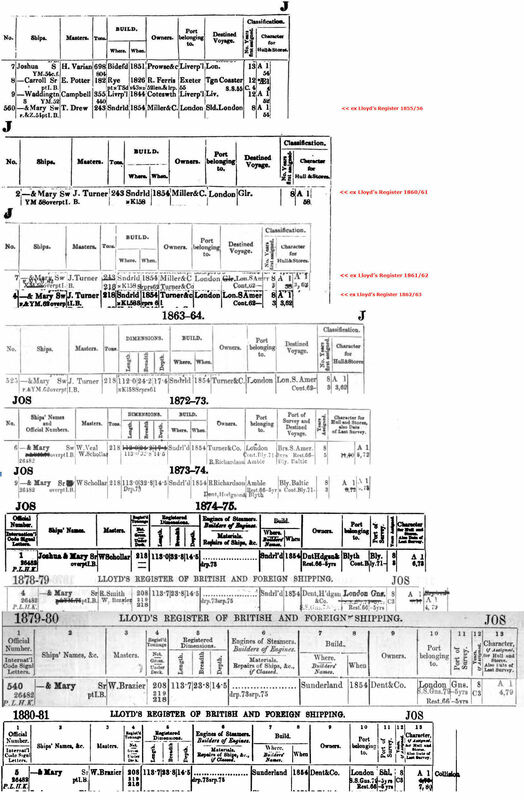 The 1881 Census shows Alfred still as 'shipbuilder/repairer' living at 8 Roker Terrace. In 1911, he�was listed as a shareholder of the Great Western Railway. He died in 1911 (ref. FreeBMD, Volume 5c, page 593), and the National Burials Index shows he was buried in Somerset, England. Edith Freeman Downes Alfred's wife was Edith Freeman Downes, daughter of John Downes, a London tea dealer.�Alfred & Edith married in 1865, lived in Bishopwearmouth,�and had three daughters before a son, Alfred James Downes Simey, was born in 1875.� A. J. D. Simey became an Army officer & served in France during WWI.�Edith died in Somerset in 1928. Anyway, names of vessels constructed by 'Alfred Simey & Co.' of Sunderland - in a table in build date sequence. Just one vessel so far, built in 1877. What is at present a puzzle is that the one vessel is indicated to be Hull #51. When 'Simey' is said, above, to have built 33 vessels only. But they may be many reasons for such a high hull number - such numbers were not always neat & tidy! 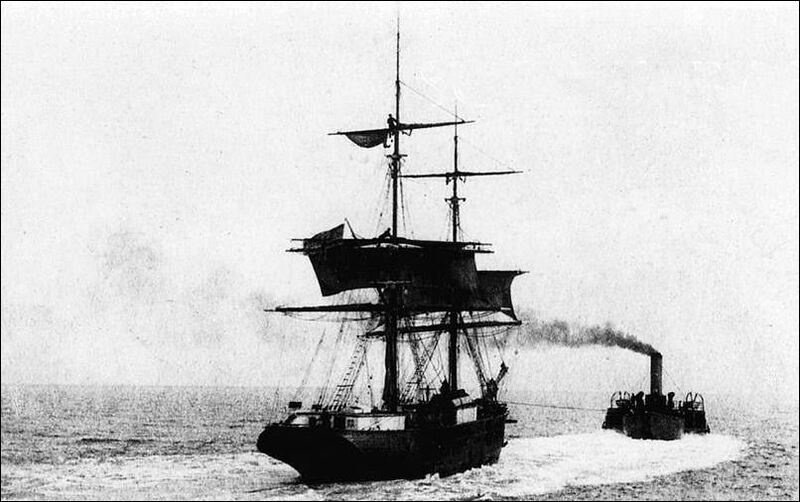 An iron steamship. Per 1 (1880 grounding, ex 'The Nautical Magazine', of 1881, a 'Google' book), 2 (Ulster Steamship, Bickley), 3 (extensive data about 1884 wreck), 4 (Miramar, link, you now must be registered to access). 176 ft. 0 in. long, per Miramar 53.6 metres long perpendicular to perpendicular, signal letters QTMB. 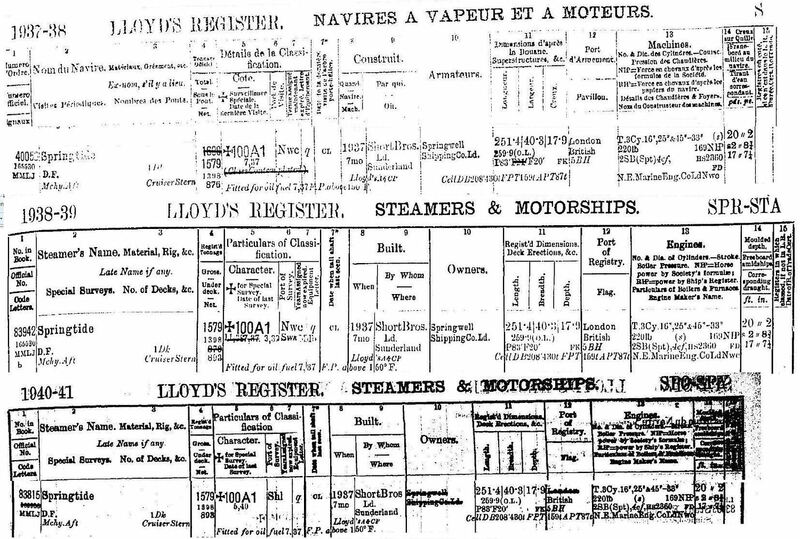 The webmaster has a few Lloyd's Registers available, & the 1878/79 edition indicates two owners, 'G. Heyn & Ss' ('Heyn') & then 'Ulster Steamship Company Ltd.'. Heyn would seem to correctly mean 'G. Heyn and Sons Ltd.', of Belfast, from 1879 the managers & maybe the owners also of 'Ulster Steamship Company Ltd.' ('Ulster') known as 'Head Line' - which Line then served the E. coast of Canada, the Far East, Europe & Baltic ports. 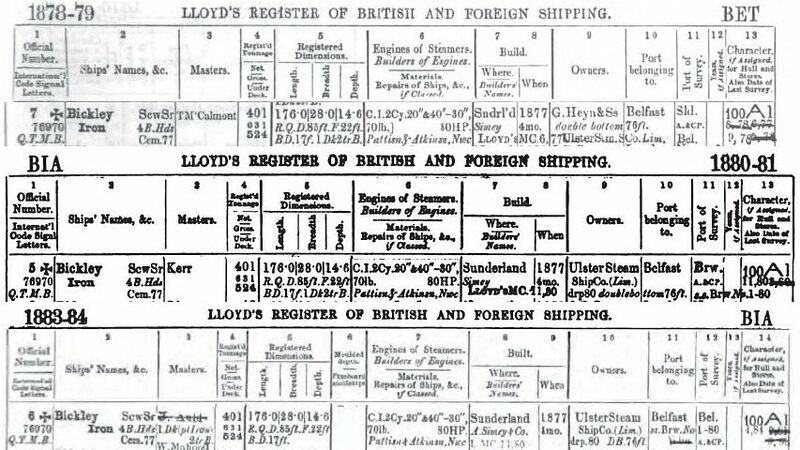 In the 1880/81 edition of Lloyd's Register, the owner was stated to be Ulster, of Belfast, & I have read that Bickley was Ulster's very first ship. 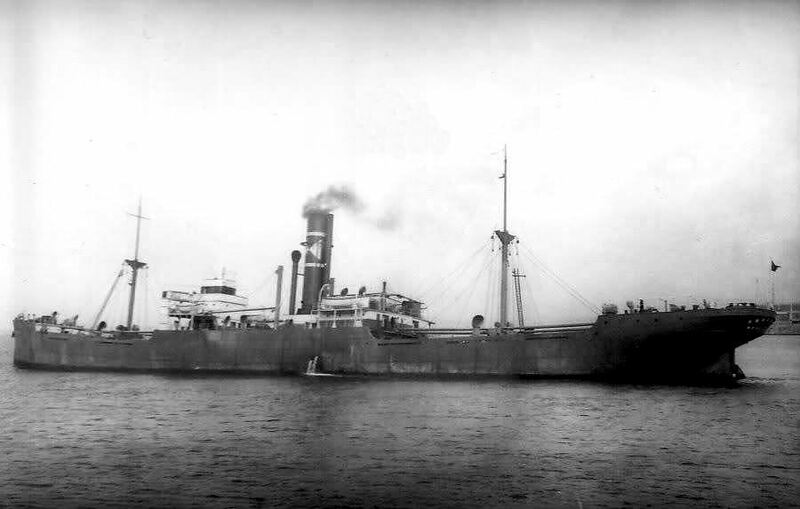 On Sep. 8, 1880, the vessel, owned accordingly by 'Ulster Steamship Company, Limited', was en route from Barrow-in-Furness, to Riga, Latvia, with a cargo of pig iron. The vessel was stranded, at Windam, Russia, the Captain (Kerr, perhaps?) being held responsible because he continued at high speed in close proximity to the land. I cannot identify where 'Windam' is, but I suspect it may be in the Baltic, near the Gulf of Riga. The vessel was presumably re-floated because it stranded again, 4 years later. This time it went aground, at Crossapoll Bay, on the E. side of the island of Coll, Inner Hebrides, W. coast of Scotland. On Oct. 4, 1884, though the wreck references are to Oct. 6, 1884, perhaps the date when she was considered to be a total loss. At 56.34.5N/6.40.0W. The vessel was en route from Liverpool to Copenhagen, Denmark, with general cargo, W. Mahood (not Mallwood, I think) in command, a crew of 17. I have not been able to learn the circumstances, but when Bickley went aground, the seas would seem to have been calm. Seamew & Androsine, & also Claymore perhaps, went to Bickley's assistance, but for a great many days, indeed for a whole month, in high seas & in gale conditions, rescuers, who could get close to the ship, could not board her. And the ship presumably broke up. 5 lives are said to have been lost - perhaps it is a coincidence that at 3, 5 of the crew are specifically referred to as being saved. Was the Captain saved, I wonder? Miramar references 'Pile & Co' to be the owner in its listing for the vessel - a bit of a puzzle. Can you add anything! I first included the name in these pages because of the vessel listed below, by the name of New Ed, that John Smith built in Sunderland in 1853. 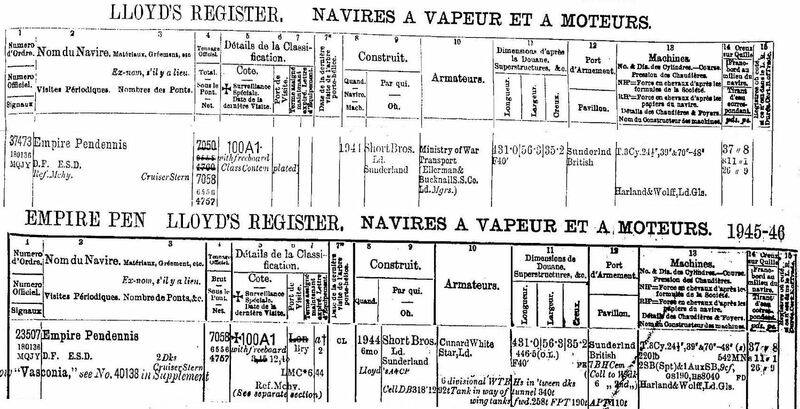 Now Lloyd's Registers of that point in time state where a ship was built but do not state who built it. There is available a list of ships built in Sunderland in 1857 ex 'Christie's Annual Shipping Register, Maritime Compendium, and Commercial Advertiser' for 1858, & such list does not contain the name J. Smith. But he may well have been out of business by that date. Now, thanks to Bill Swift, we are able to make available a 'pdf' about John Smith, complete with contemporary newspaper cuttings, a tentative build list & even some maps. You can access Bill's comprehensive 'pdf' here. Should you happen to note any errors in such 'pdf' or have additional information, Bill invites you to be in contact with him via the webmaster. I will gladly pass on any such comments. Bill Swift advises that John Smith was indeed out of business by 1858, having died in 1855. John Smith, Bill tells us, was born in humble circumstances in Monkwearmouth in about 1810 & died on May 14, 1855 at his son-in-law's residence at Poplar, London - at age 45. He clearly was a successful business man, not only building ships but also manufacturing cable & anchors, making sails, being a timber merchant, etc. He even served as a councillor for Monkwearmouth Ward. He was clearly a significant employer in the Sunderland scene since he had almost 300 employees in his various enterprises in 1851. He never mastered the skill of writing, however! He was the owner of his shipbuilding business, per Bill Swift, from just 1850 thru 1855. And possibly from even earlier - in 1848. Hopefully more vessels built by John Smith will soon be included below. Just 2 at this moment. We do have data on site now about a number of the ships that he built, i.e. Janet Willis, Shakspeare, Dumfriesshire, George Kendall, Brahan Castle, Jane Gray, Richard Battersby, Sir Walter Raleigh, Prima Donna, Walter Duncan, Lady Ann, Tijarety Misr, & Sir James. A 'John Smith' build list is now on site - here. A snow, later a brig, which would seem to have had a longer life than I at first thought. The vessel is not Miramar listed. 113.3 ft. long, signal letters HETW. Built for J. Oldrey, also the vessel's captain, of Hmbro', which clearly means Hamburg, Germany. For voyages from Sunderland to Hamburg, it would appear. 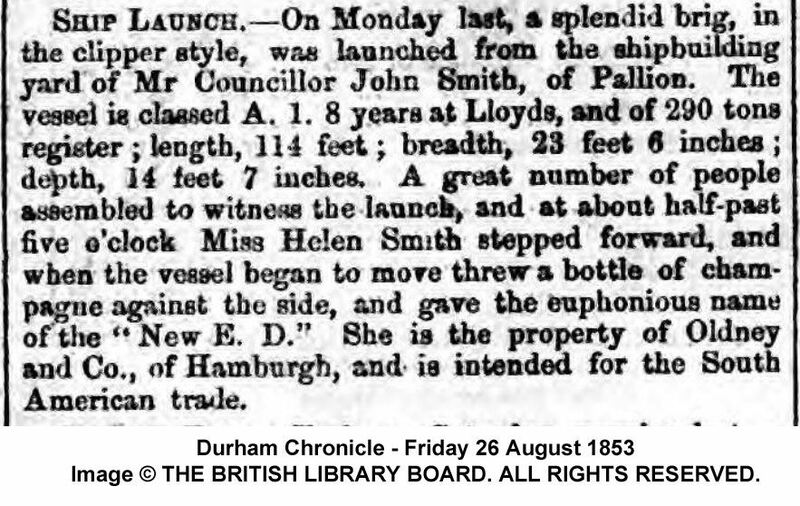 This newspaper cutting announces the launch of the vessel on Aug. 22, 1853 for Oldney & Co. of Hamburg, the vessel being christened by Miss Helen Smith & intended for the South American trade. A 2nd launch announcement has the purchaser as Messrs. Oldrey & Co. 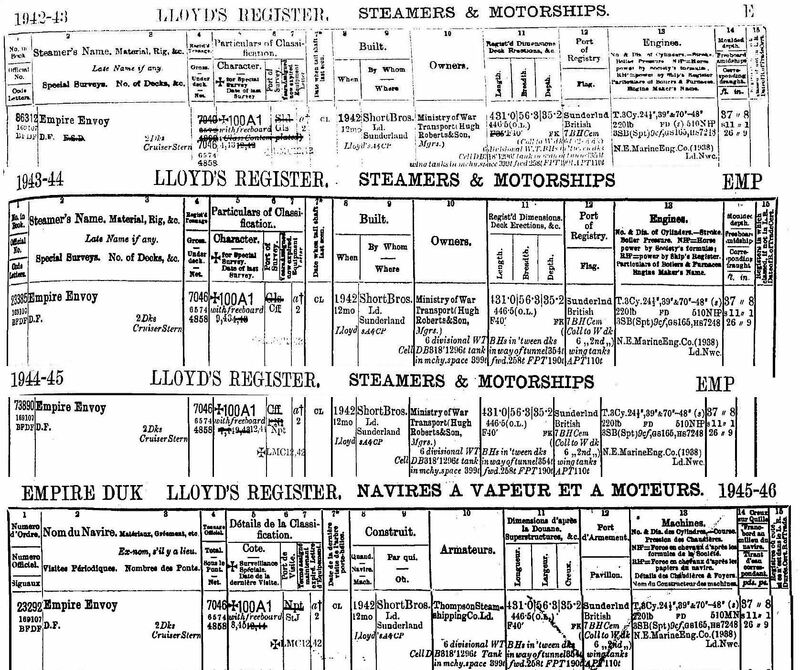 The webmaster has editions of Lloyd's Register available to him ex 'Google' books, thru 1862/63 - see left. Note that the vessel is not Lloyd's listed in such later editions (1863/64 thru 1889/90) as the webmaster has available, & it seemed likely that the vessel was renamed. 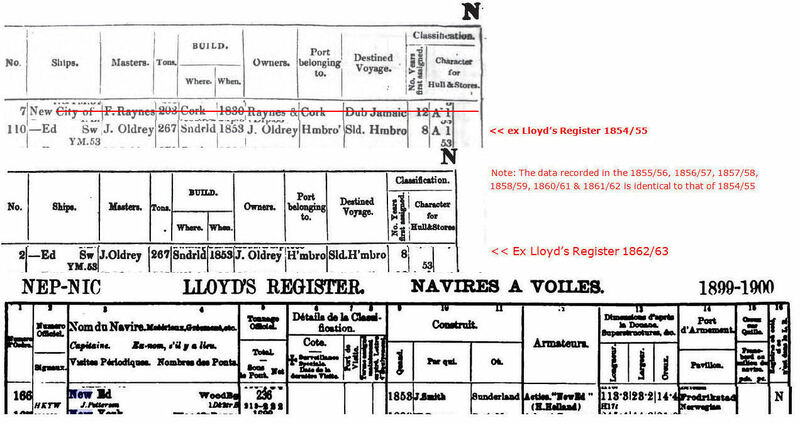 But the webmaster has also seen a much much later Lloyd's Register reference to the ship, in 1899/1900, when still named New Ed. That reference has been included at left also. Vendor 'scott-base' indicated, in his eBay listing (thanks! ), that by 1867 the vessel was sold to owners from T�nsberg, Norway. Later in life, at 1899/1900 for sure as we can see, the vessel was owned by Acties "New Ed", H. Helland the manager & maybe the owner also, of Frederikstad, Norway. That is, alas, all that I can at present tell you about the vessel. What finally happened to her, I wonder? Can you add anything! #1835. A ship, 158 ft. long between perpendiculars, built of English oak & East Indian teak, named after & with a full-length figurehead of Uncle Tom, the black slave & the principal character in the 1852 anti-slavery novel 'Uncle Tom's Cabin' written by American author Harriet Beecher Stowe. This newspaper launch announcement advises that 3,000 people were in attendance when on Jun. 21, 1853 (as I read the words) the ship was launched to much acclaim. The vessel was intended for the Australian & East Indian trade. 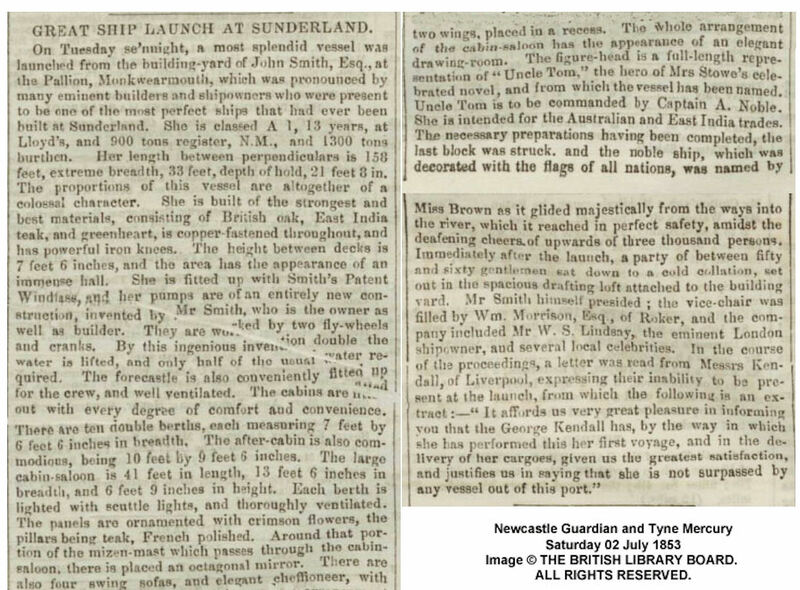 The article does not refer to a buyer's name but it does refer to a letter from Messrs. Kendall of Liverpool which suggests that they may have been the vessel's proposed owner. A quality ship it would seem. Alas that is all I can at present tell you about the vessel which, so far as I can see was never listed in Lloyd's Register, nor would it appear to have been issued an Official Number & likely therefore was not in existence on Jan. 1, 1855 when such numbering system commenced. If anyone can provide more information about the vessel & what happened to her, do please be in touch. #1927. I know absolutely nothing about this shipbuilder. Whose name is not, in fact, particularly common. Can you help? It would appear, however, that a John Smurthwaite, in 1880, owned (about 70% down), Mark Quay Brewery of 100 Low Street, in Sunderland. Is that of relevance to this page? It would seem that it probably is since John Smurthwaite is described as being 'originally a shipbroker & builder'. Anyway, names of vessels constructed by 'Smurthwaite' of Sunderland - in a table in build date sequence. Just one vessel so far, however, built in 1864. 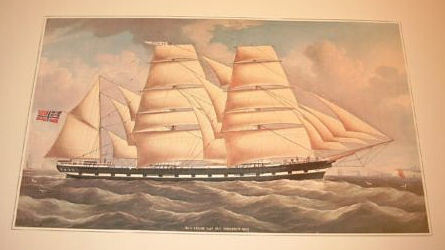 A well-regarded fully rigged 'clipper' ship, completed in Mar. 1864, which later, in or about 1883, became a barque. Per 1 (Devon), 2 (data, page in Norwegian & English, Venus), 3 (image, Devon). 207.2 ft. long, signal letters WFVD, later HMSV. 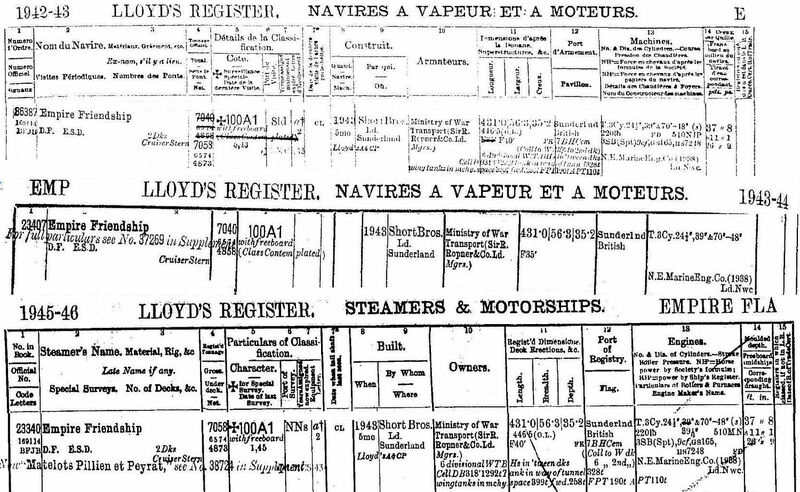 So far as I can see, the vessel is Lloyd's Register ('LR') listed from 1863/64 thru 1894/95. The vessel was, per LR, first registered at London, built for Joshua Brothers, who owned the vessel thru 1873/74. 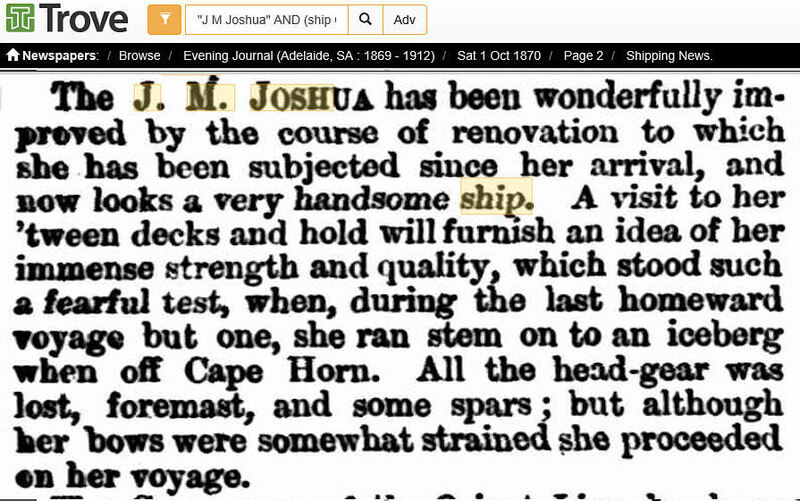 It would seem that J. M. Joshua was the principal of Joshua Bros., a prominent firm of shipping agents of Melbourne, Victoria, Australia. Joshua Brothers & Co. was the partnership of Joshua Michael Joshua, Moss Joshua & Samuel Joshua & was dissolved on Sep. 30, 1874. The Mercantile Navy List ('MNL') of 1870 lists Samuel Joshua of London as the vessel's then owner. For initial service from Sunderland to China (thru 1866/67), from London to Australia (1867/68 thru 1870/71) & ex London thereafter thru 1873/74 when LR stopped listing intended voyages. With J. Ferguson serving as the vessel's captain thru 1867/68, 'Hodgson' thereafter thru 1873/74 & W. Hicks, from 1873/74 thru 1880/81. Madeleine Harwood indicates that 'Hodgson' means Robert F. (Francis) Hodgson, her GGG grandfather. Yes indeed! 'Hodgson' served as captain of the vessel from approx. Apl. 1867 thru Feb. 1874. Some details of J. M. Joshua's many voyages to Australia & New Zealand ('NZ'). i) In mid Nov. 1865, the vessel, captain Ferguson in command, en route in ballast from China to Callao, Peru, to load guano for Fuzhou, China, put into Auckland, NZ, for provisions. ii) 'Hodgson' was in command of all of the following voyages. On Jun. 14, 1867 the vessel left London for Melbourne, arriving there on Aug. 27, 1867, 72 days out of Gravesend, with no passengers. And absent Richard Luffman a young seaman who had fallen from the mizen top gallant mast head & could not be found in the sea. On Nov. 18 or 19, 1867 the vessel left for London with a cargo that included 4,753 bales of wool, copper ore & gold. iii) The vessel left London, Gravesend, on Mar. 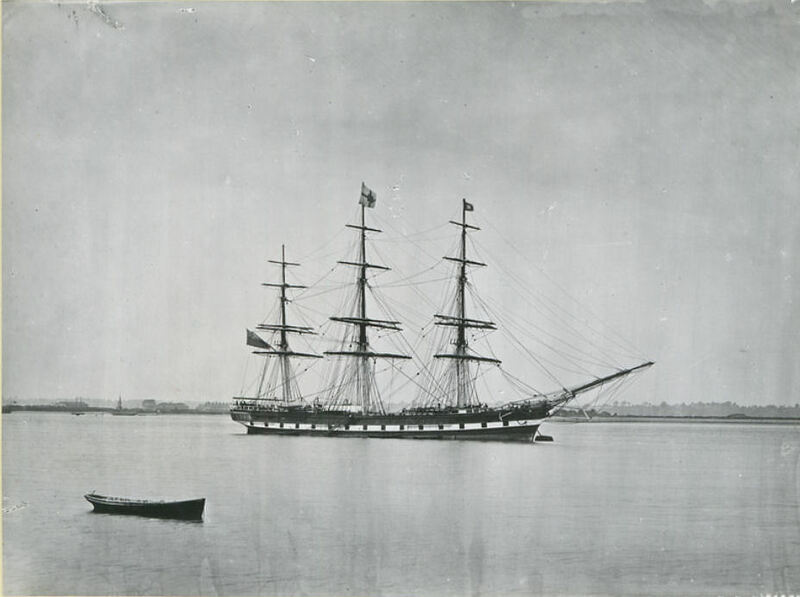 11, 1868, arriving at Melbourne on Jul. 2, 1868 with a cargo that included rams & ewes from the Rambouillet farms of the French Emperor. The vessel went on, in ballast, to Newcastle, New South Wales, where it was nearly wrecked on Oyster Bank as it arrived - when the tow rope of tug Warhawk broke in difficult weather & sea conditions. On Sep. 8, 1868 the vessel left Newcastle for Shanghai, China, with 1,460 tons of coal. It would seem that on its return voyage to London, the vessel ran stem-on into an iceberg off Cape Horn. iv) there was a similar voyage in 1869, which left London on Jun. 1, 1869 with about 33 passengers & left to return to London on Nov. 13, 1869 with 4,892 bales of wool, copper ore etc. It was at the Isle of Wight on Mar. 4, 1870. v) On Jul. 17, 1870 the vessel arrived at Melbourne with a general cargo & 13 passengers. It went on to Adelaide, South Australia, in ballast, & was there extensively renovated. On Nov. 10, 1870 the vessel left Adelaide for London with over 5,000 bales of wool. vi) A similar voyage in 1871. vii) On Apl. 20, 1872 the vessel left Gravesend for Melbourne. A notable voyage because Herbert Harris, the ship's chief officer for 6 years, showed signs of insanity & became violent soon after leaving the U.K. He apparently had to be confined & guarded & died on Jul. 14, 1872 on which day the vessel arrived at Melbourne. On Aug. 23, 1872 the vessel left Melbourne for Adelaide with a cargo which included coal, & left Adelaide on Nov. 5, 1872 for London with a cargo of wool. viii) On Jun. 29, 1873 the vessel again arrived at Melbourne, went on to Newcastle & back, & on Nov. 21, 1873 left for London with 5,228 bales of wool. Just before she left Melbourne the vessel assisted in putting out a fire aboard Penthesilea. The vessel arrived back in London on Feb. 28, 1874. I note that the vessel was then sold & while captain Hodgson was preparing to take command of a new ship, likely in mid-summer, he fell ill & died. As per this Australian report dated Sep. 24, 1874. In 1874, the vessel was sold to 'Bagehot & Co.', of London, & renamed Devon (confirmed by LR of 1874/5 which lists Devon but not J. M. Joshua). MNL of 1880 lists 'Joph. 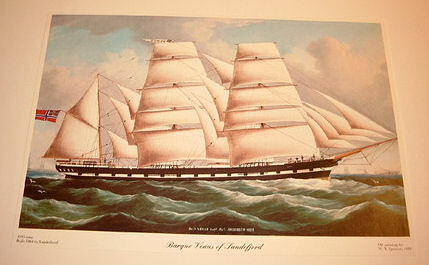 B. Bagehot' of London as the vessel's then owner. With W. Hicks continuing as captain of the vessel, now of 1148 tons, thru 1880/81 when ownership changed again. The vessel had further voyages to Australia as Devon (yet to be researched). A site visitor has indicated that his grandmother arrived at Port Adelaide, aboard Devon on Mar. 4, 1880. The vessel would seem to have been sold in 1882 to Wright Bros. & Co., of London, but there is much LR confusion as to such sale. LR of 1880/81 lists Wright Bros. & Co. of London as the vessel's new owner & registered there, LR of 1881/82 reverts to 'Bagehot', LR of 1882/83 reverts to 'Wright', while LR of 1883/84 lists K. Smith as the new owner. A. Barron served as captain during the Wright ownership period. Meanwhile, MNL of 1883 (difficult to read) lists Edwin Smith of Lutton Ho, South Brent, Devon, (as I read it) as the vessel's then owner. I had hoped that MNL of 1882 might clarify the then ownership but it is not available as this page is updated. LR of 1883/84 lists the vessel, now a barque, as sold again, to 'A. F. Klaveness.' or 'A. F. Klaveness et al', of Sv�rdstad, Sandefjord, Norway, & renamed Venus. There were, per LR, a number of captains under 'Klaveness' ownership - A. (maybe H.) Anderson thru 1886/87, Christiansen in 1887/88, Klapens in 1888/89, Klaveness or M. J. Klaveness from 1889/90 thru 1892/93 & T. J. Ness? in 1893/94. The vessel is first LR recorded at 1134 tons in 1891/92. In 1895, I read that the vessel was damaged while en route from Pensacola, Florida, to Antwerp, Belgium, with a cargo of pitch pine. It was surveyed at San Miguel, Azores, & condemned. Crew lists thru 1883 are available here. Can you add (or correct) any of the above text? SOUTH HYLTON SHIPBUILDING AND REPAIR CO. LTD.
Alas I know nothing about this shipbuilder. I include the name as a result of learning that they built a few modest ships in 1895 & 1896. Modest? 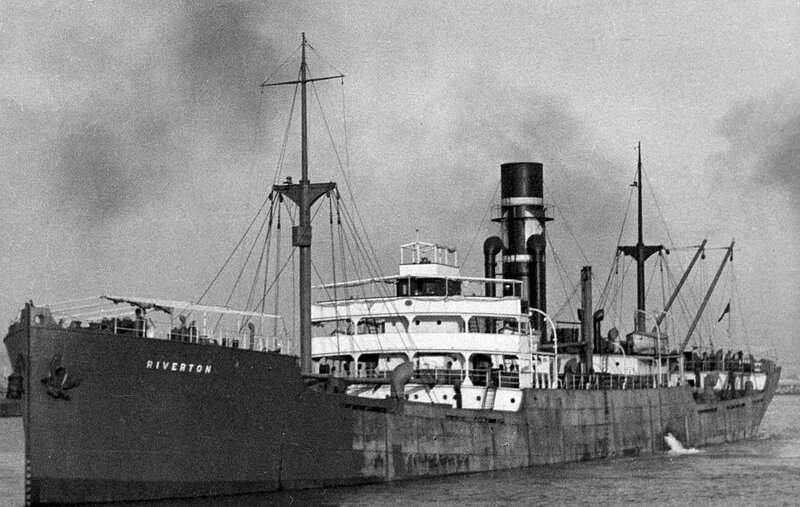 The two biggest vessels that have come to my attention so far are Wheatflower, of 188 tons built in 1895. And Prompt, of 127 tons, built in 1896. I have seen no references to exactly where their yard, presumably at South Hylton, was located. If you can tell us more about them, do be in touch.